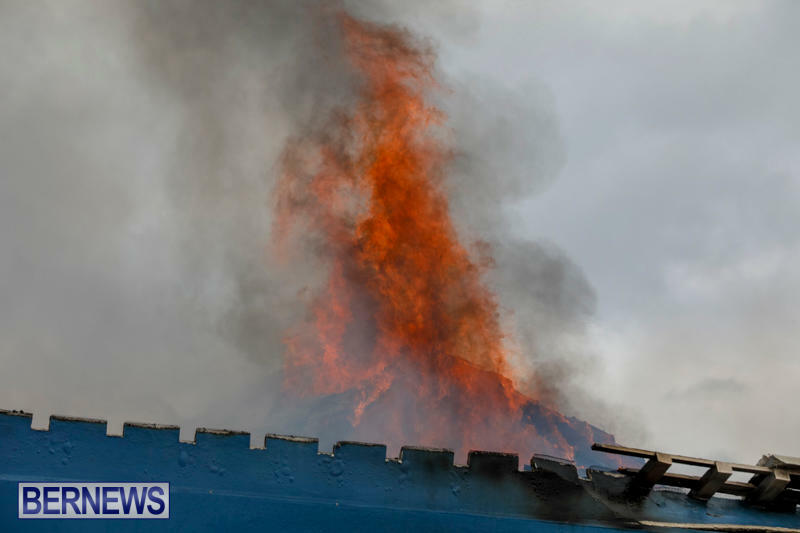 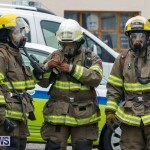 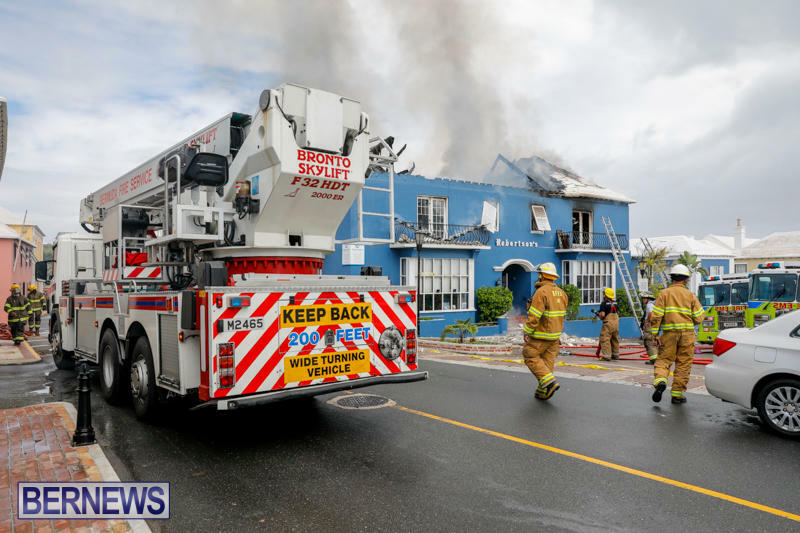 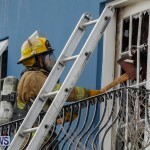 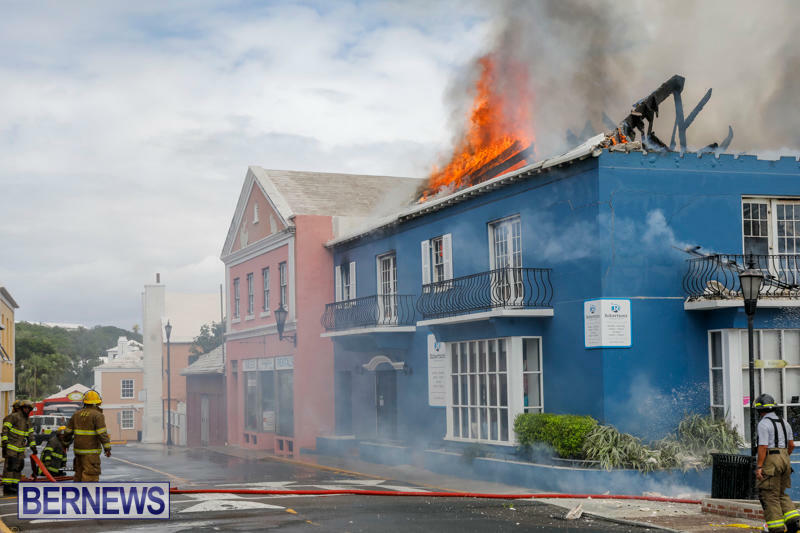 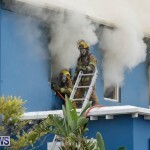 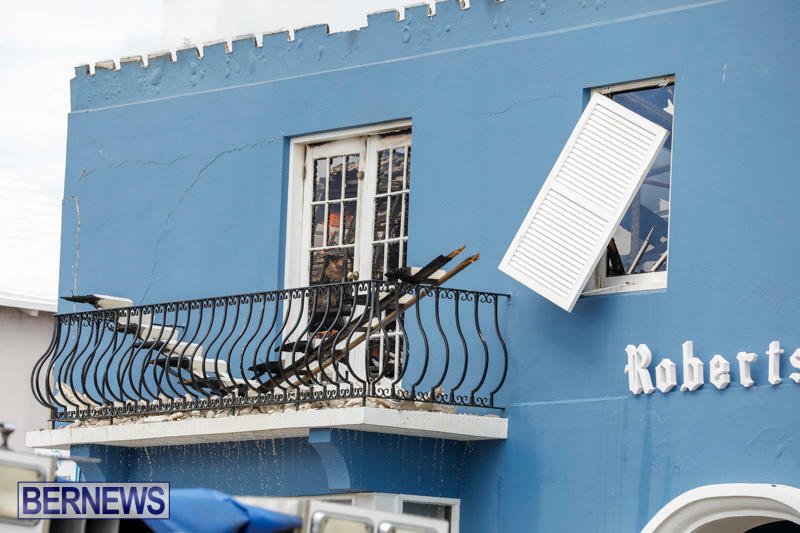 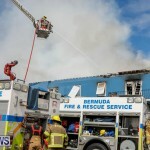 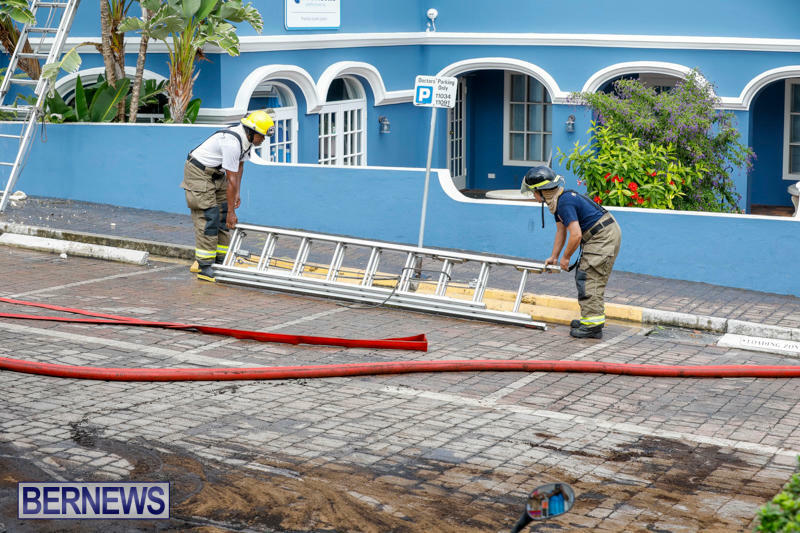 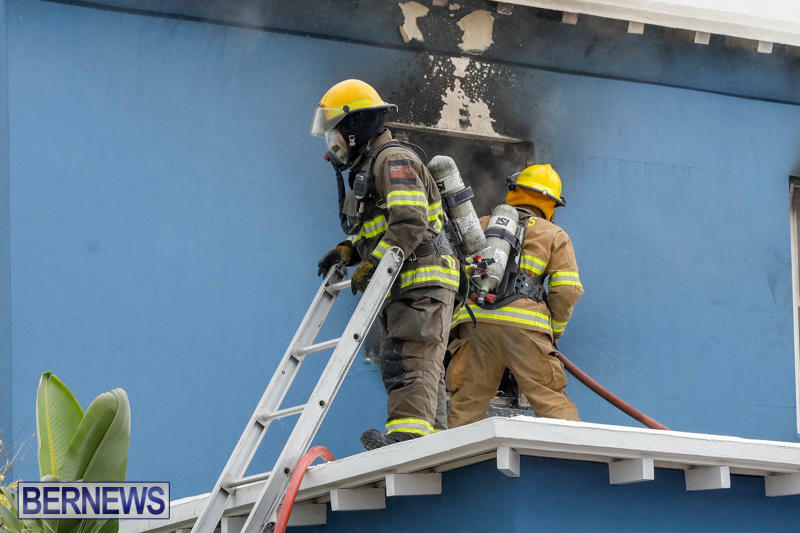 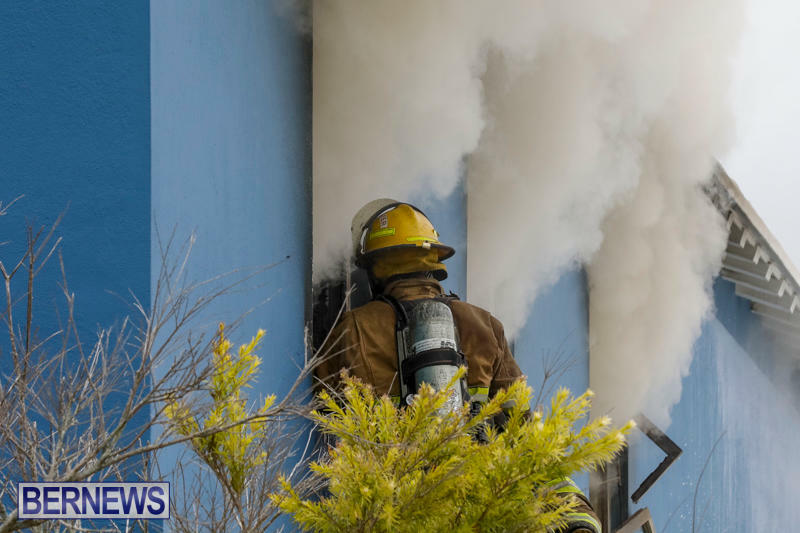 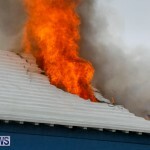 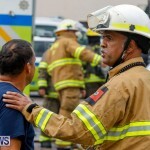 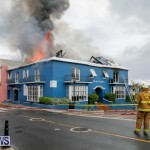 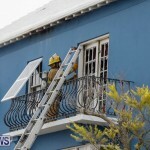 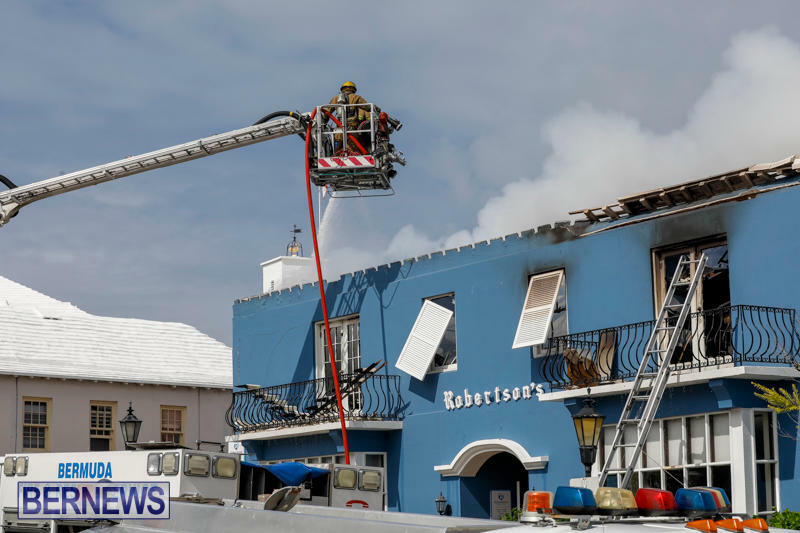 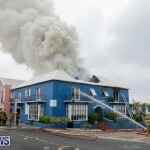 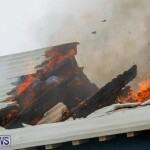 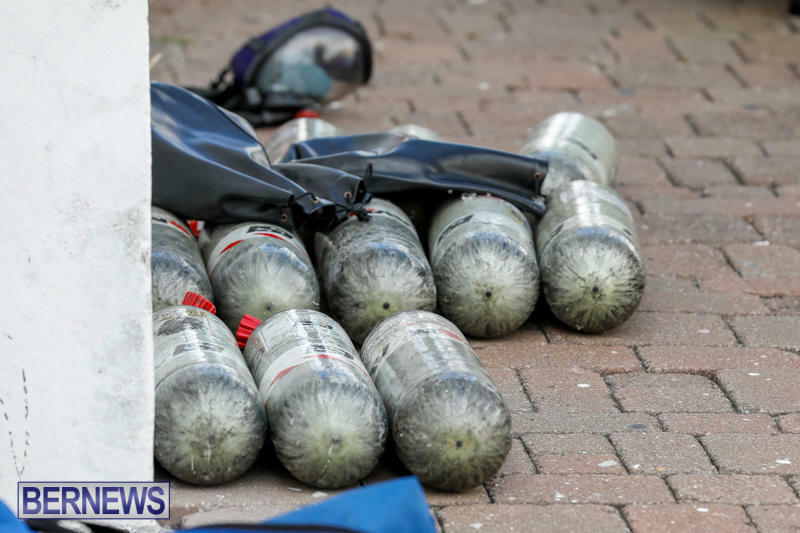 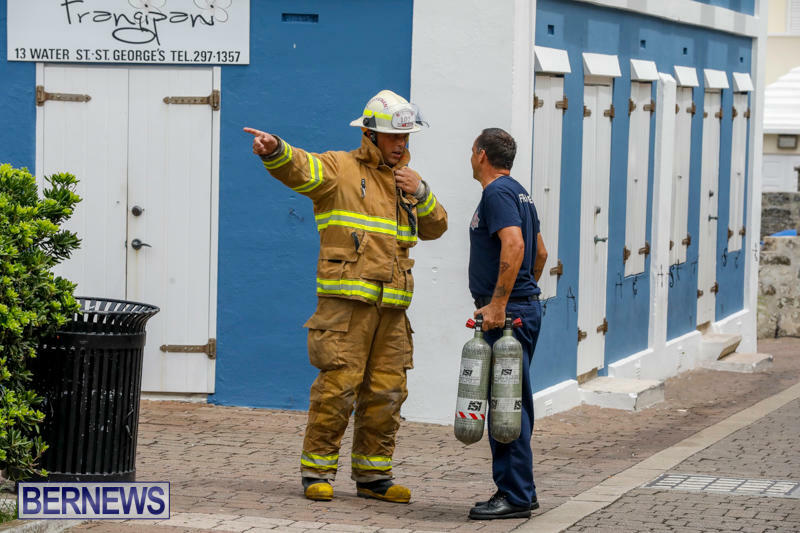 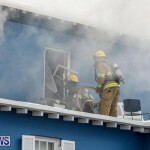 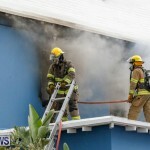 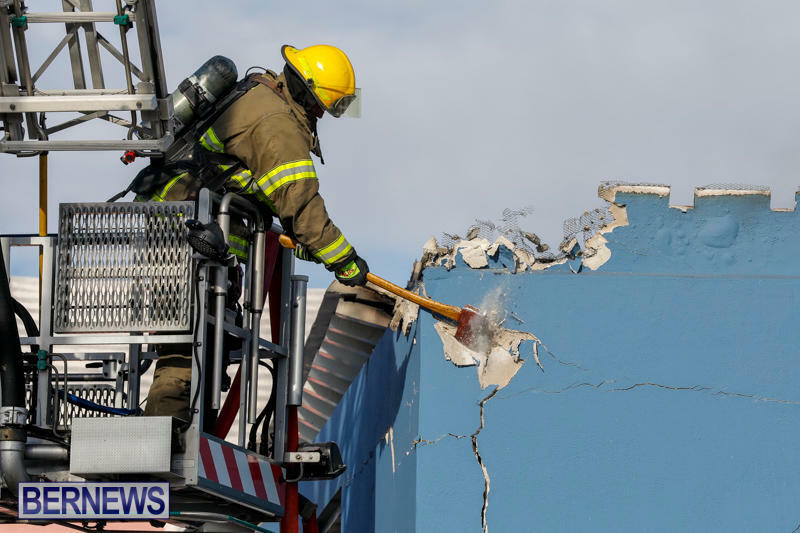 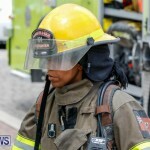 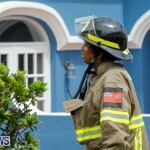 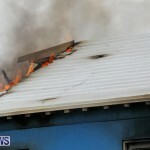 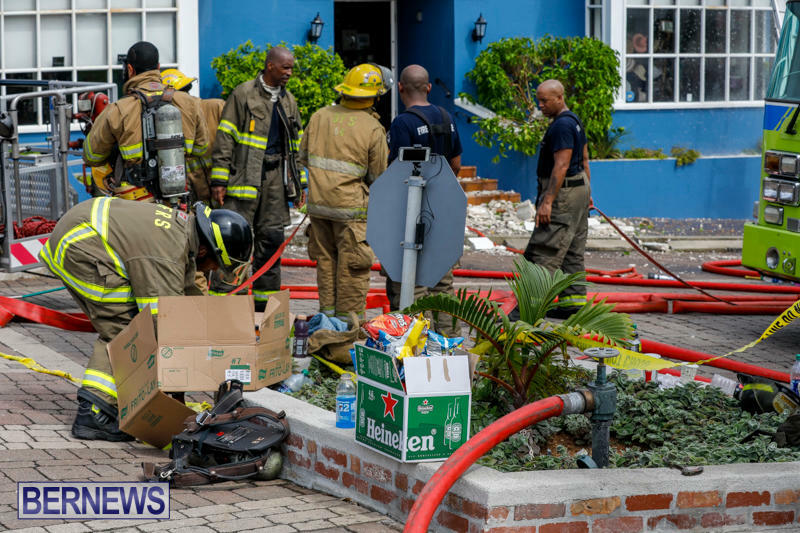 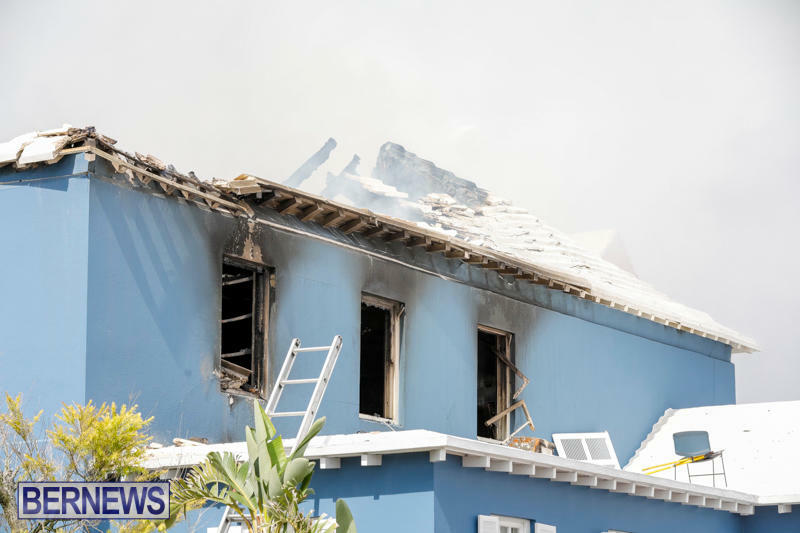 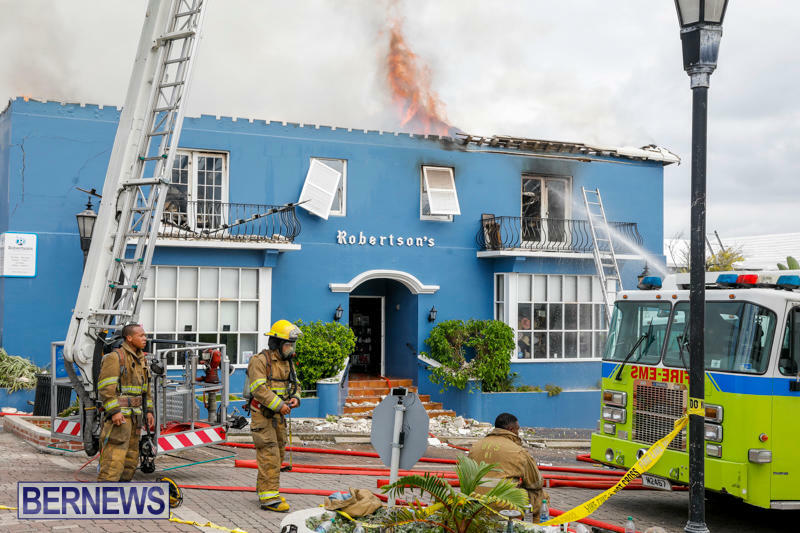 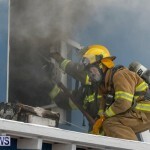 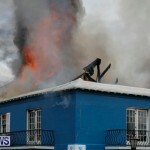 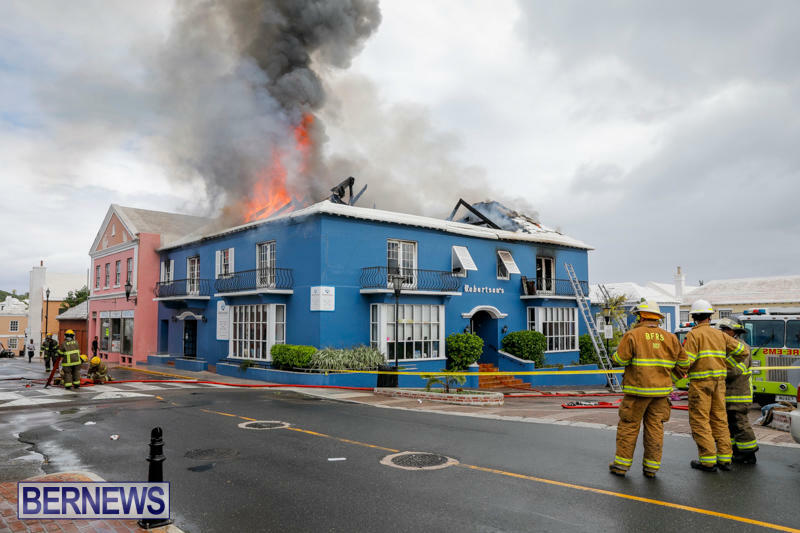 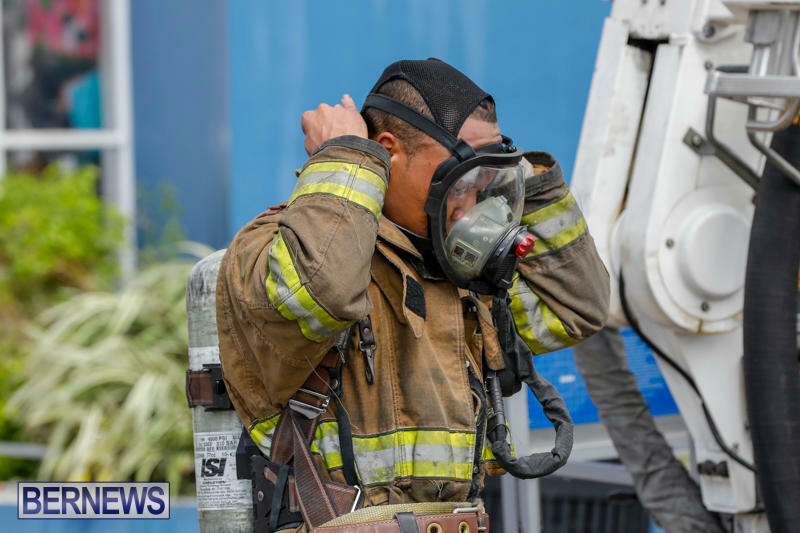 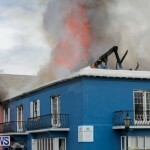 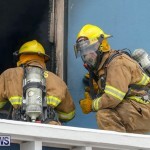 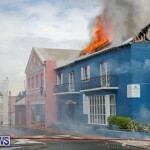 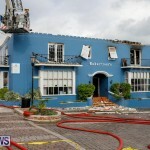 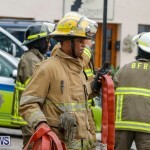 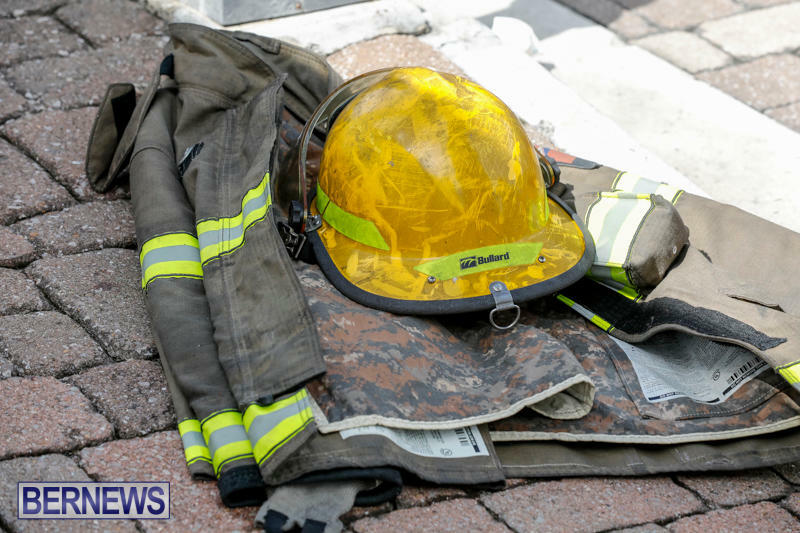 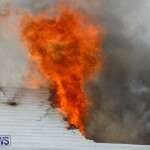 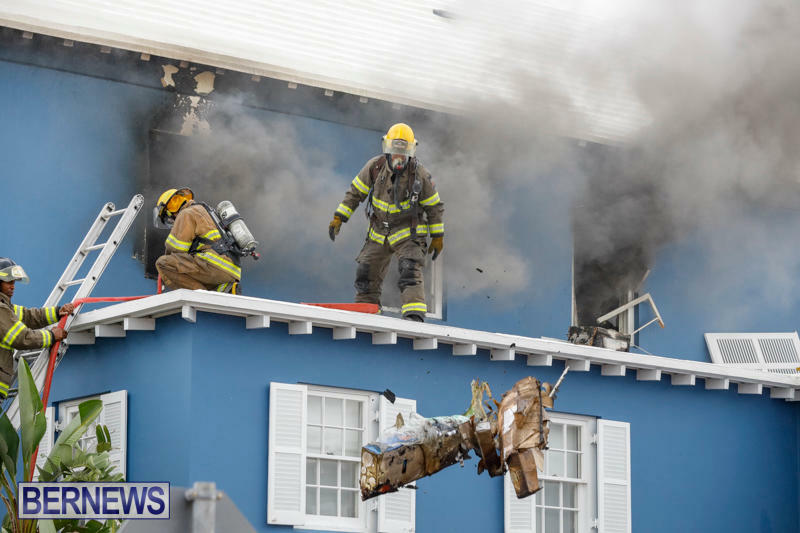 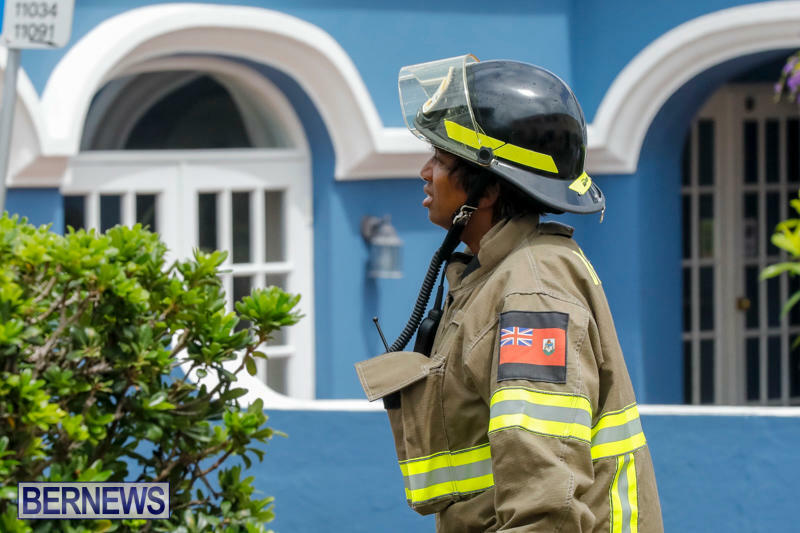 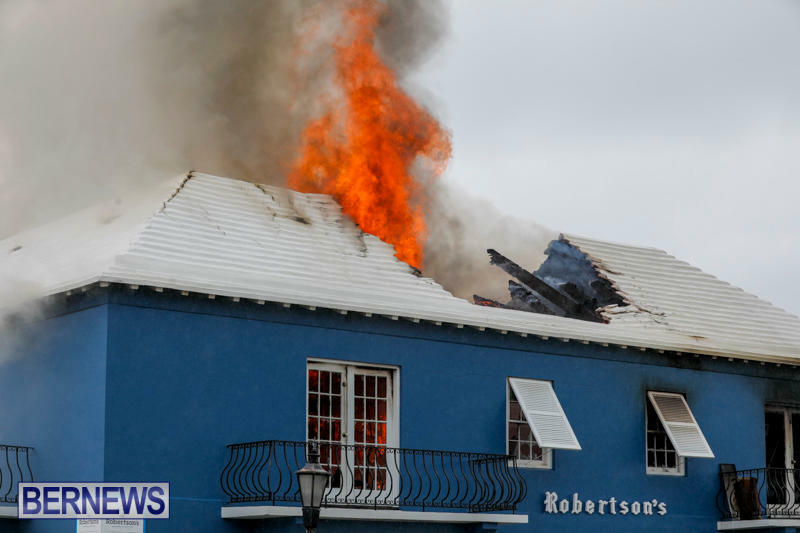 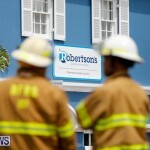 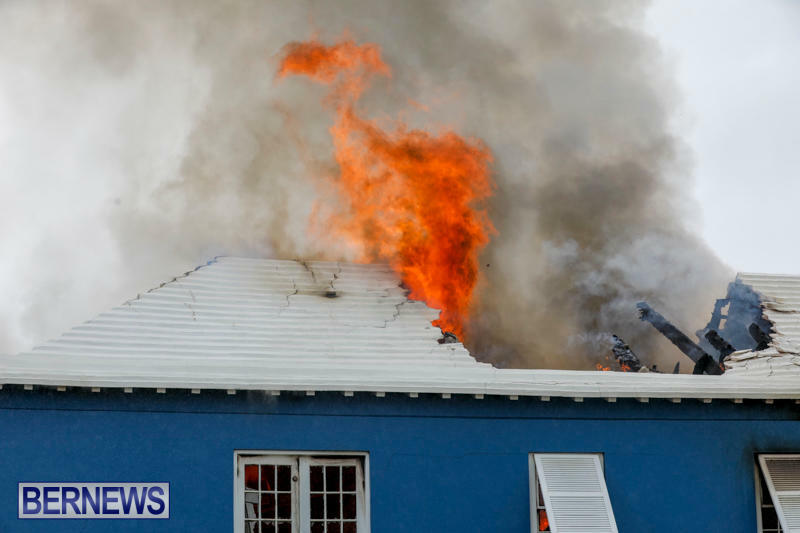 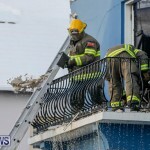 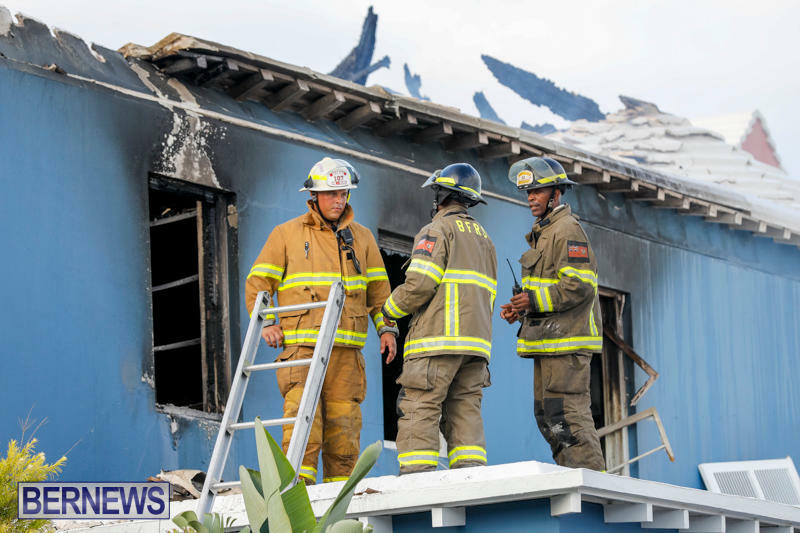 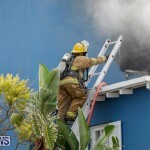 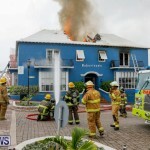 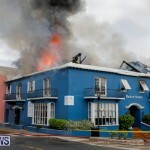 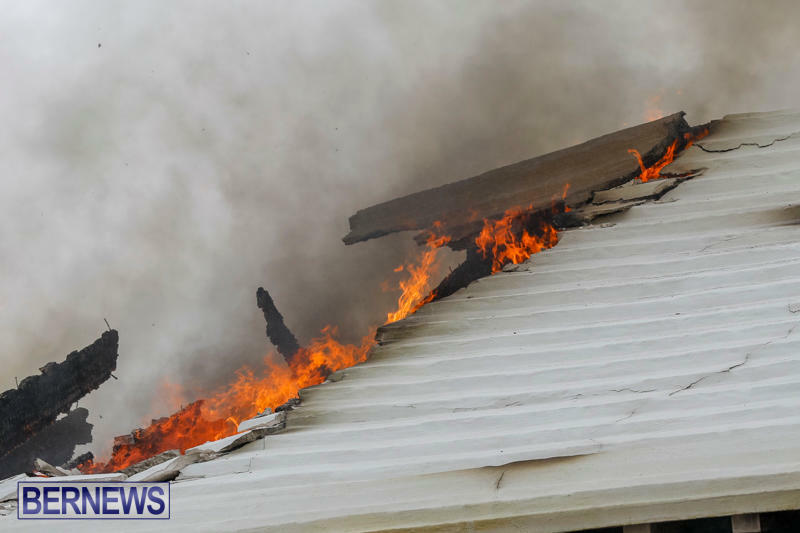 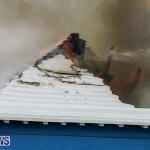 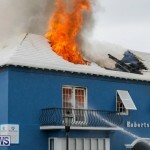 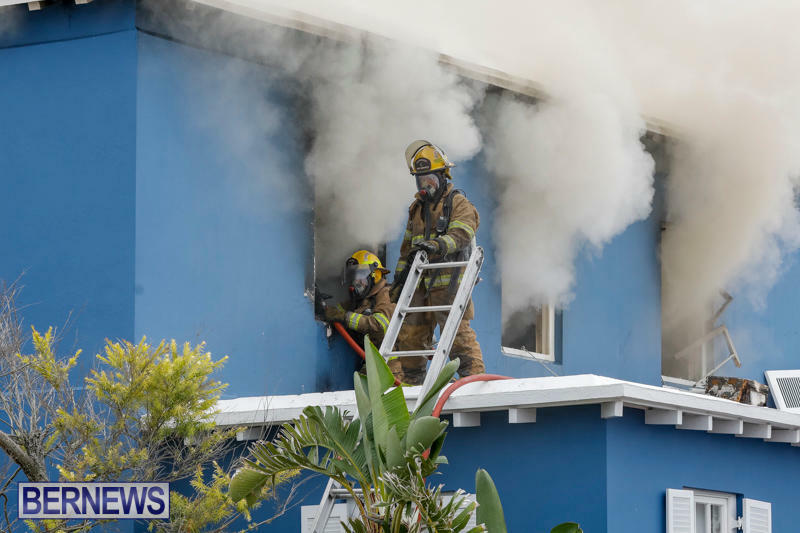 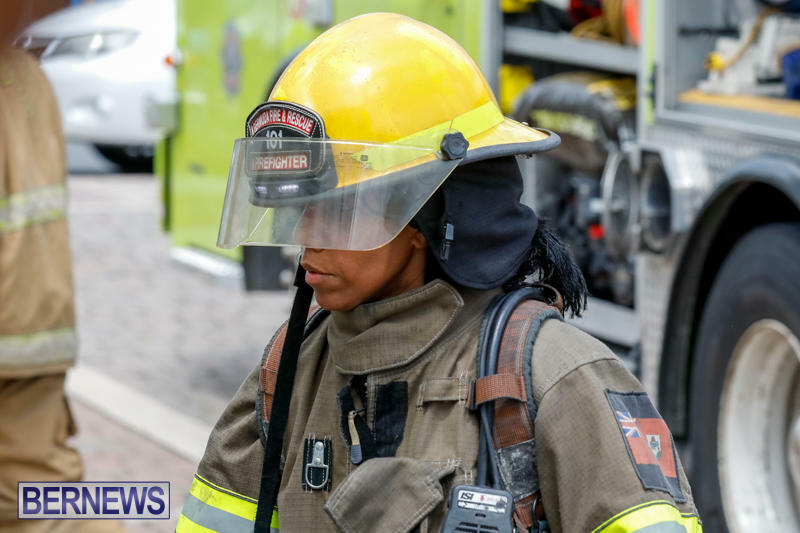 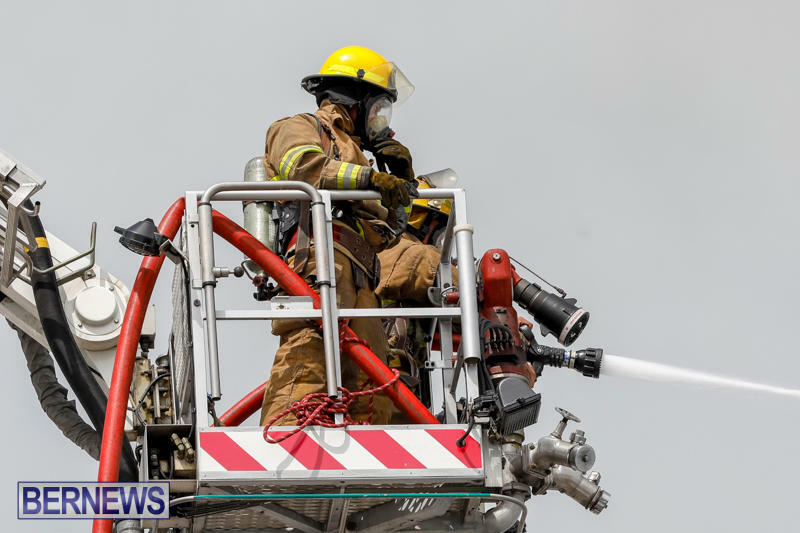 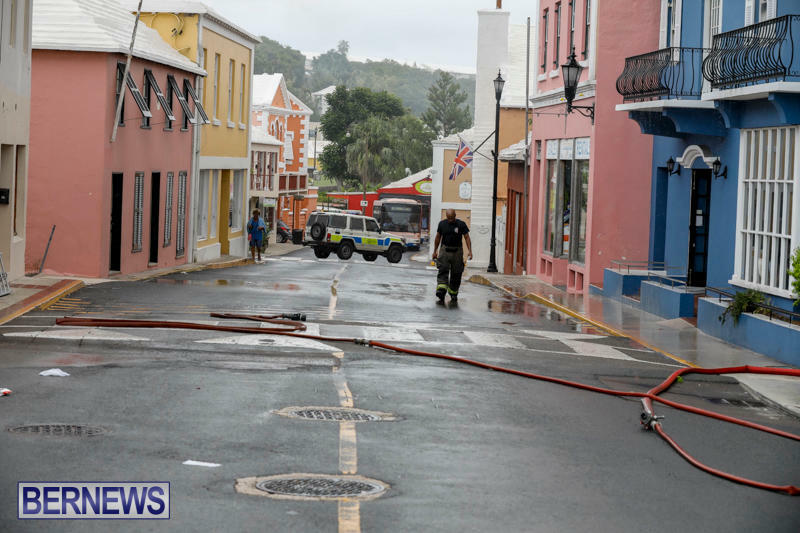 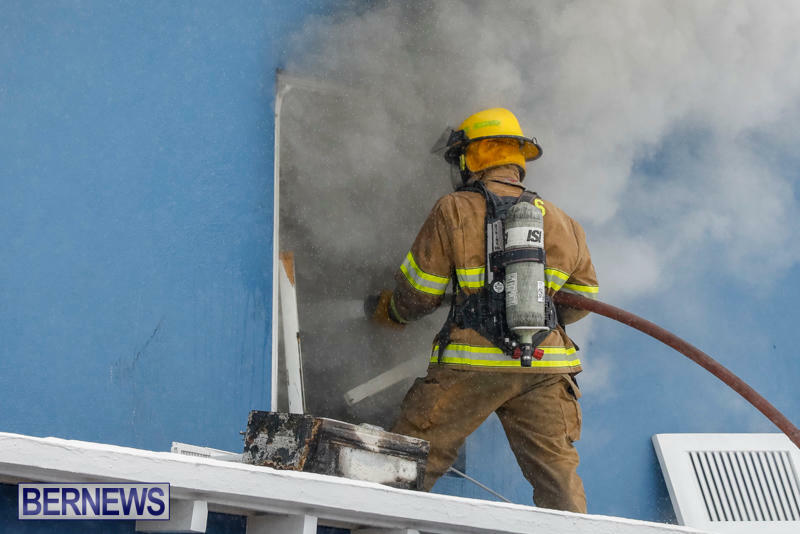 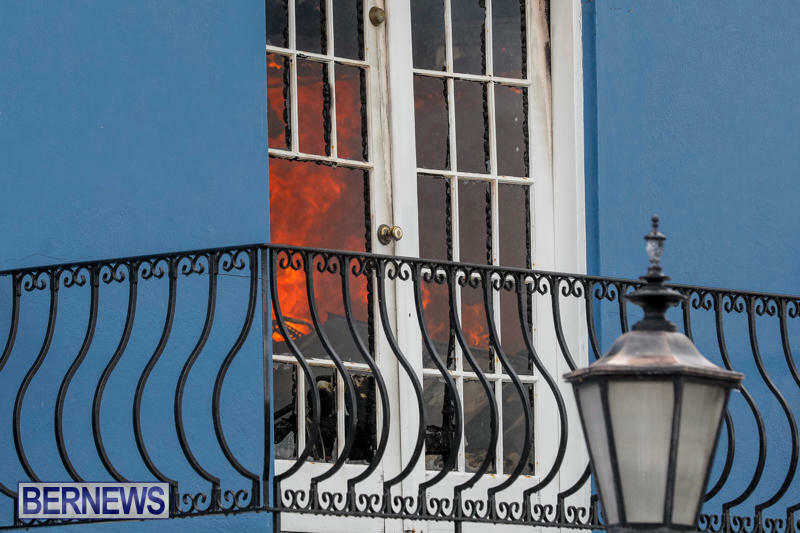 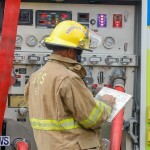 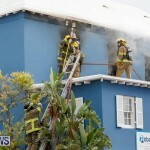 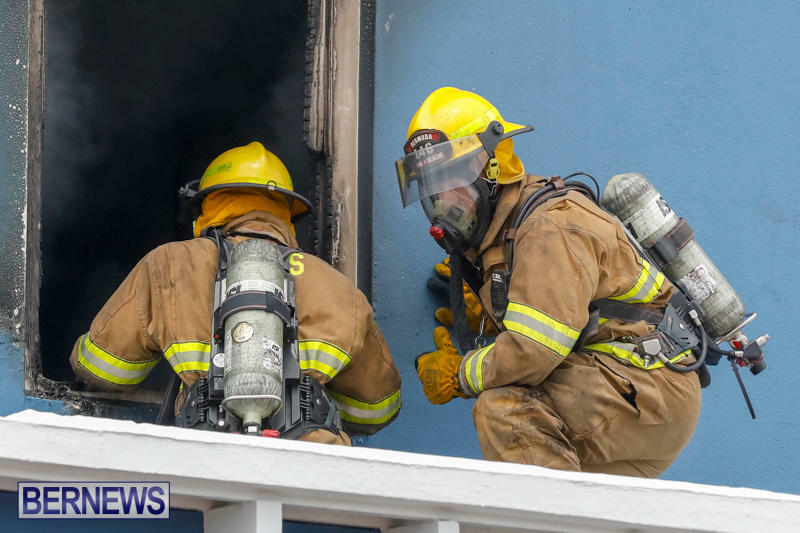 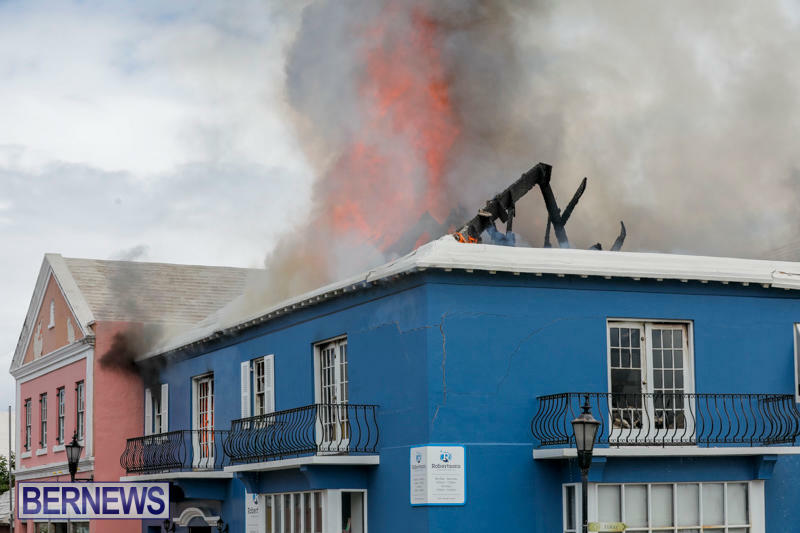 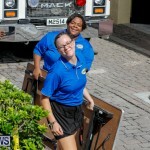 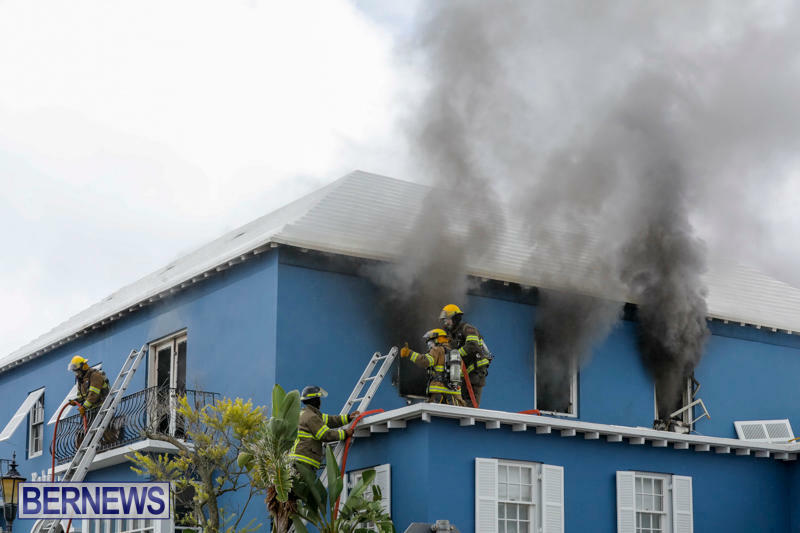 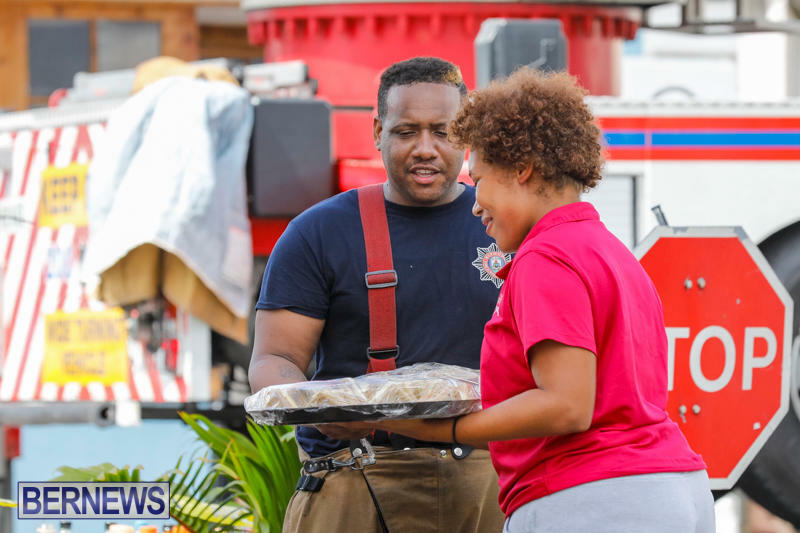 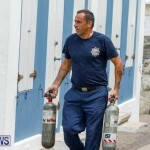 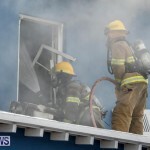 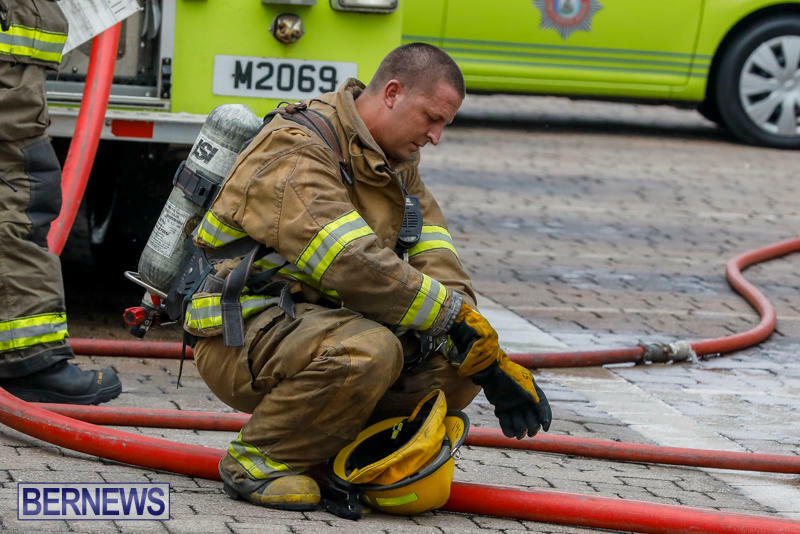 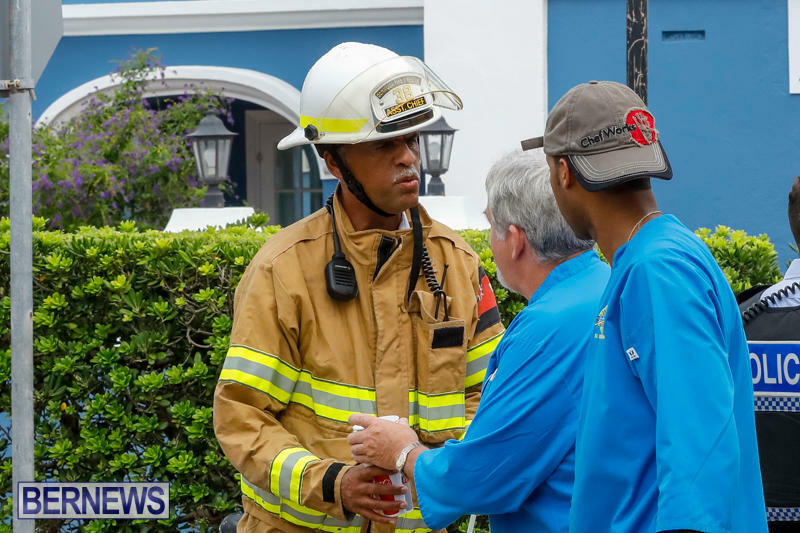 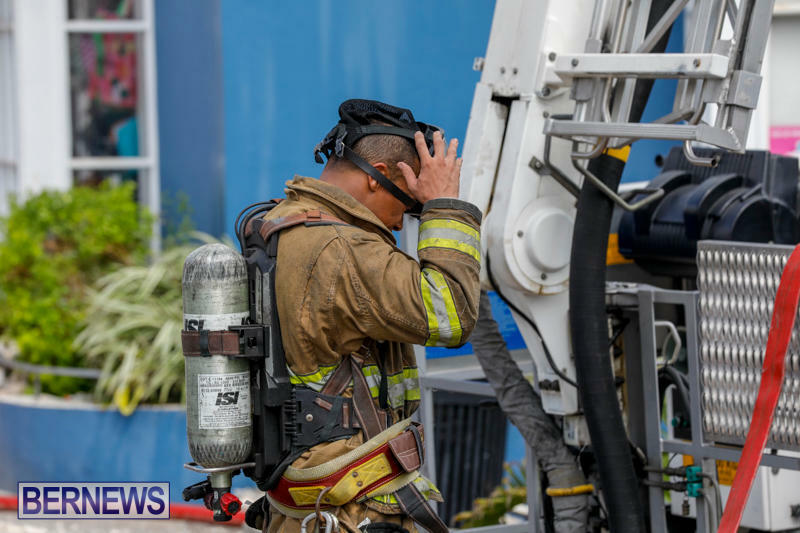 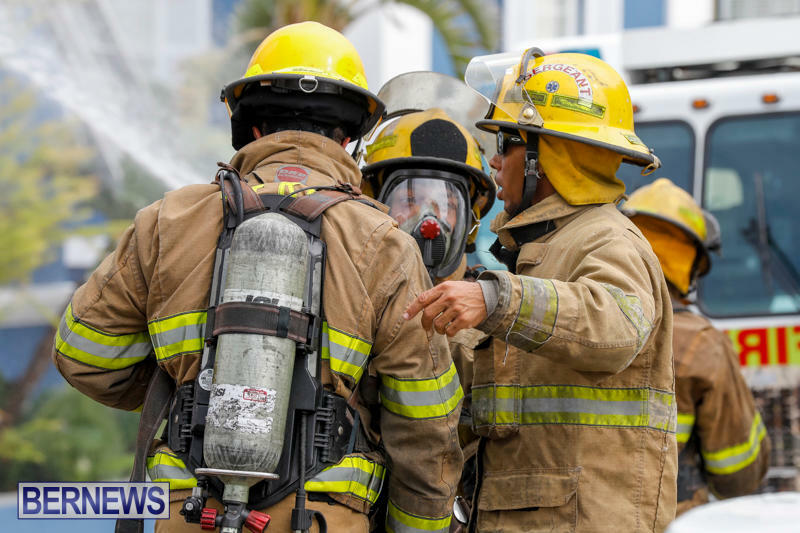 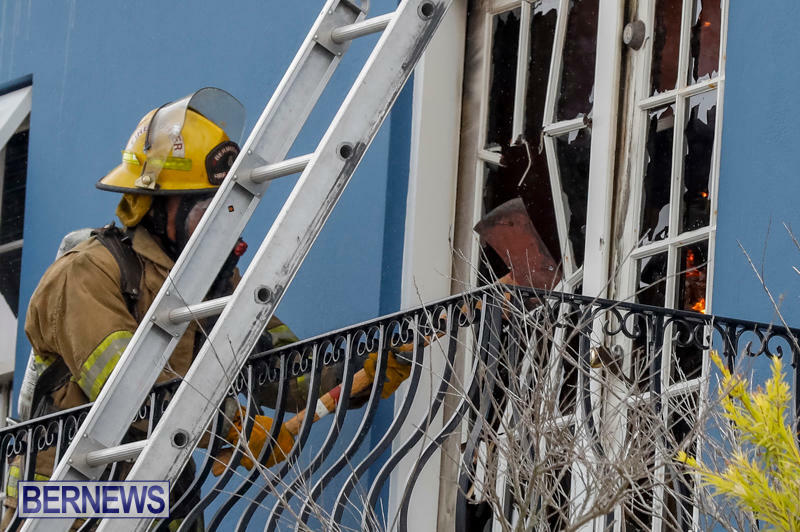 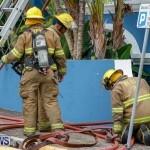 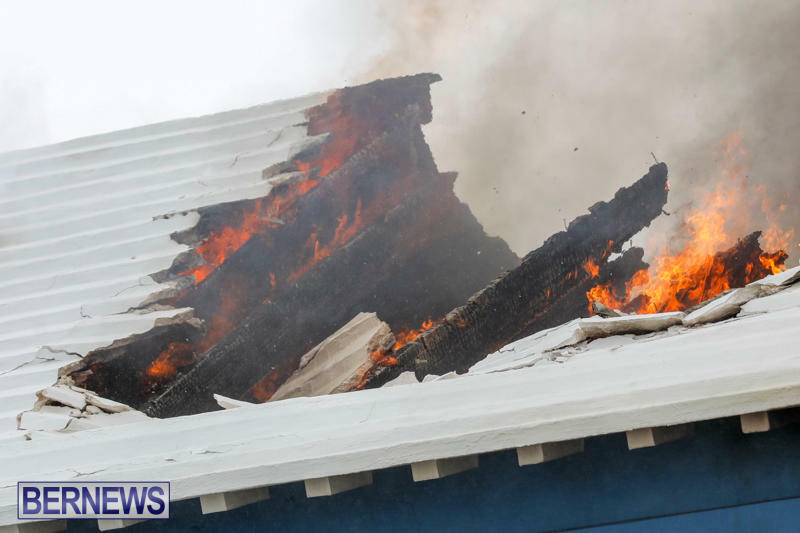 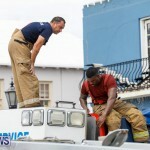 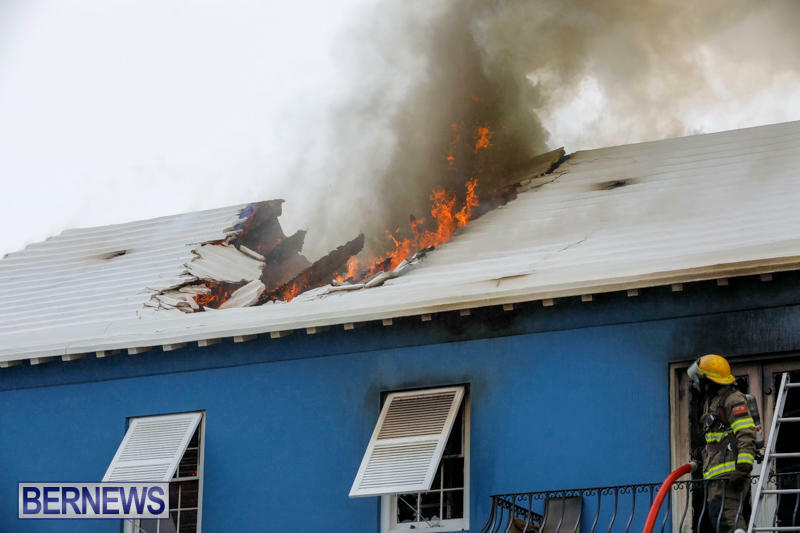 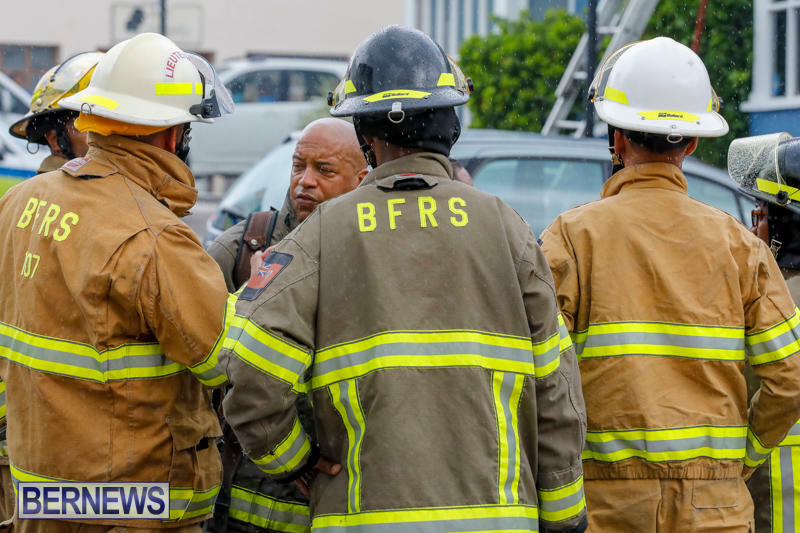 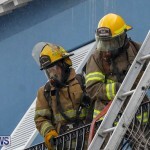 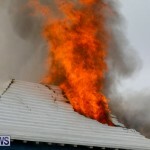 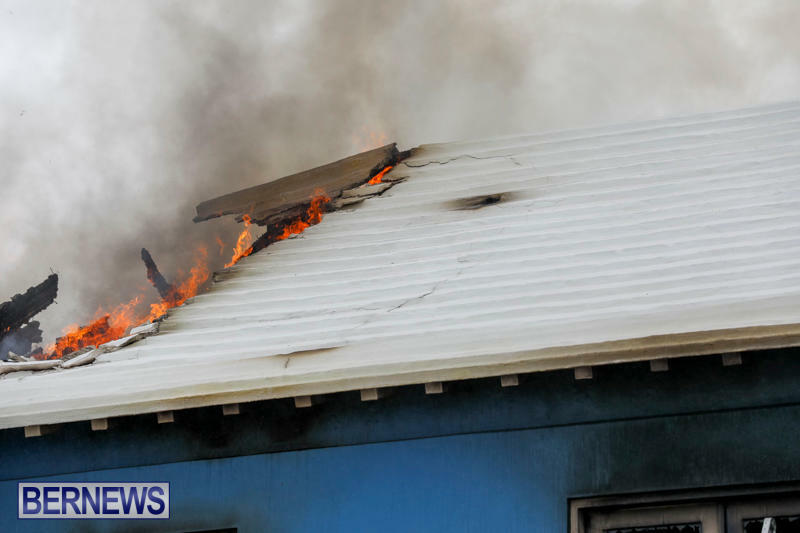 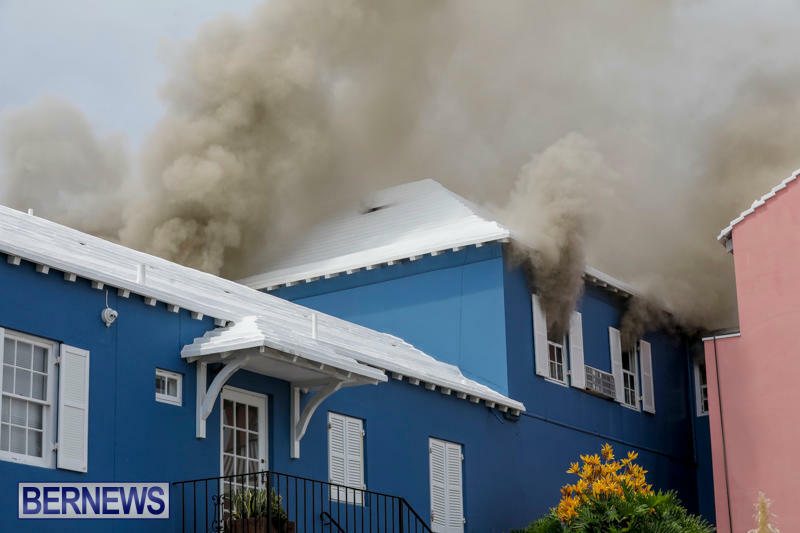 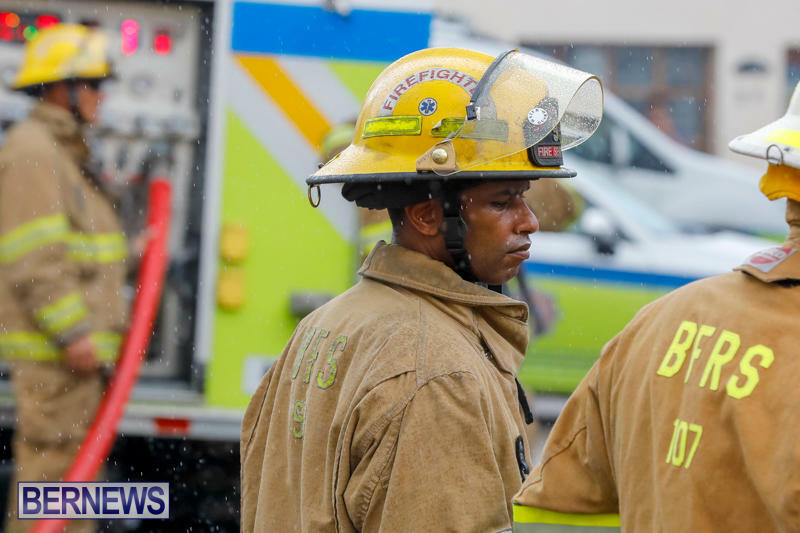 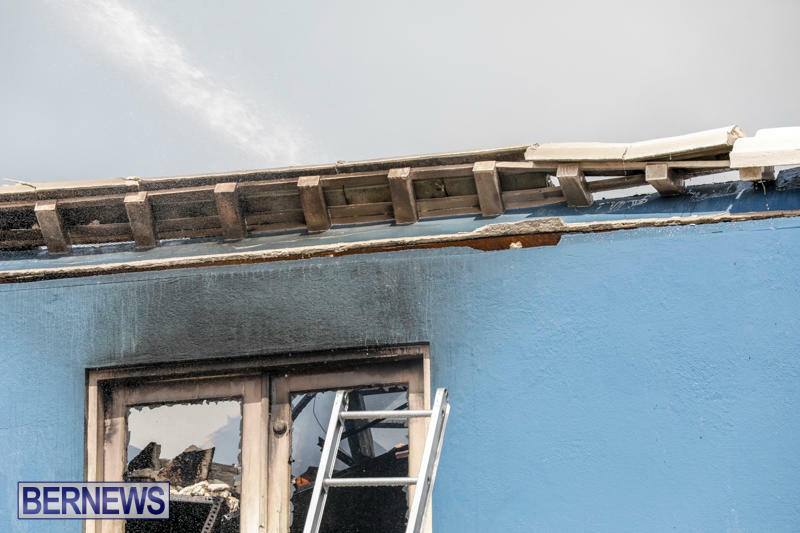 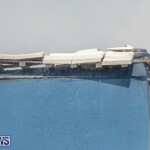 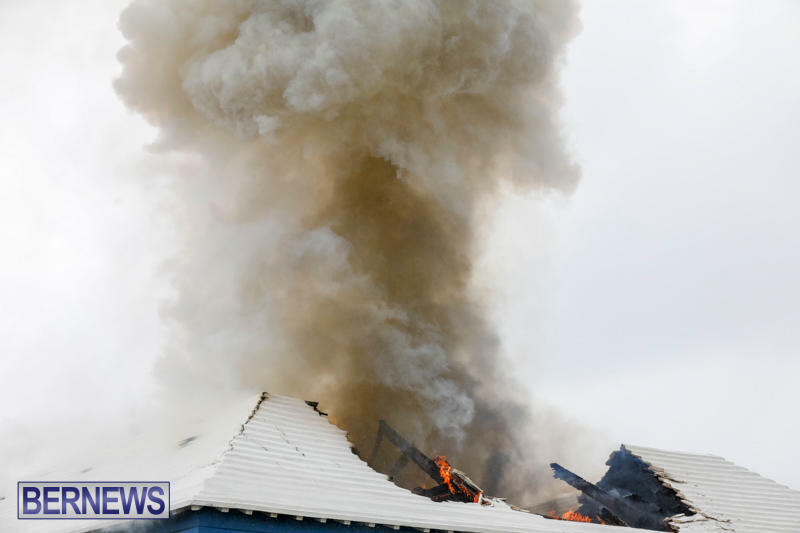 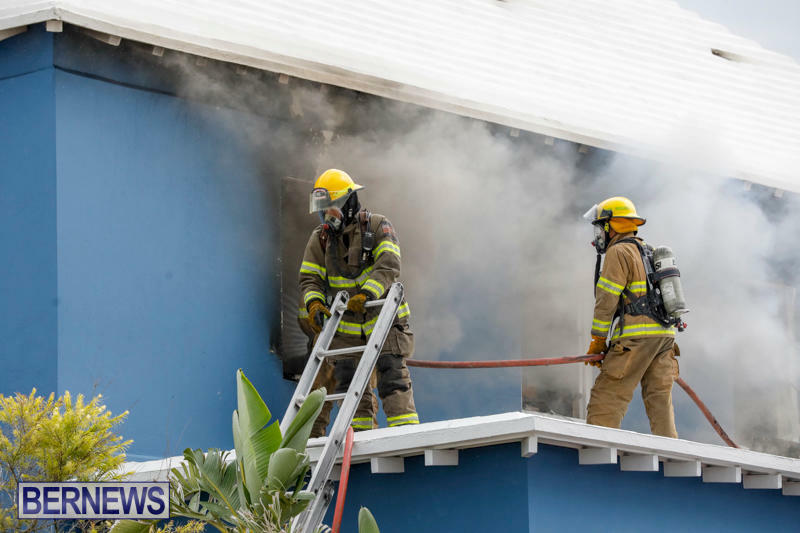 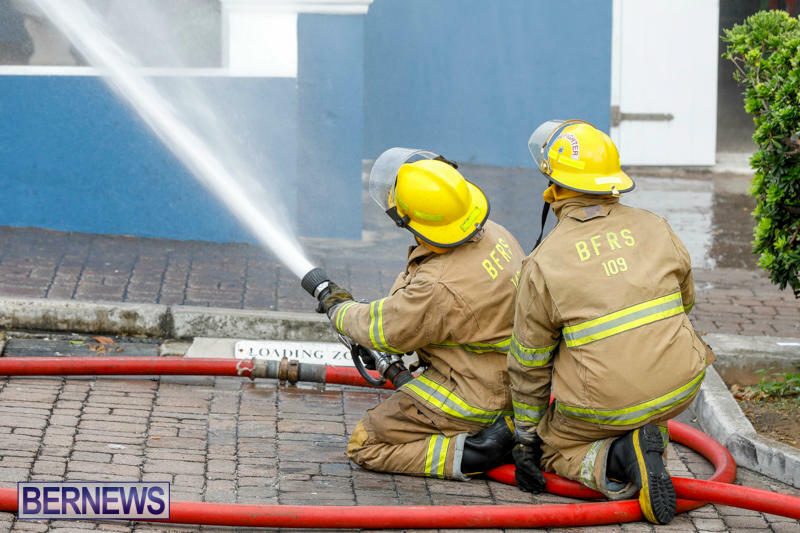 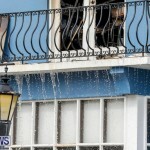 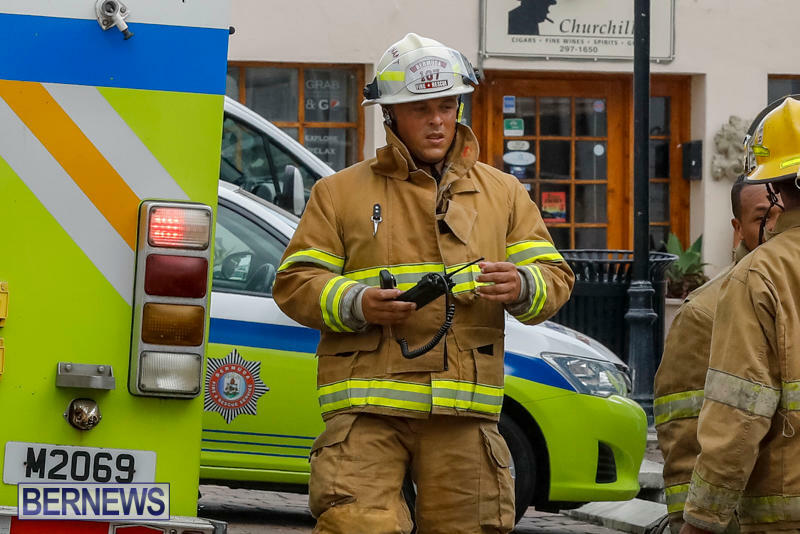 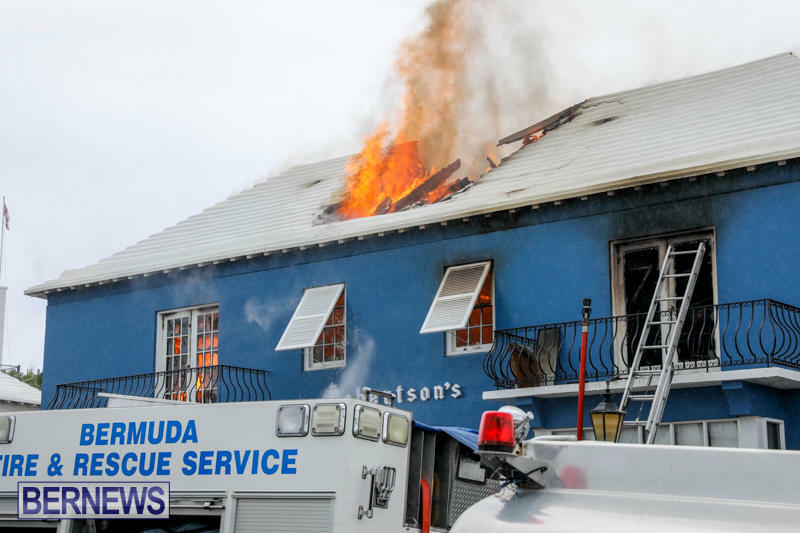 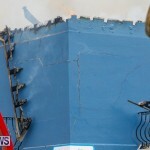 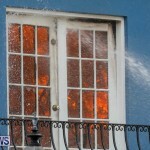 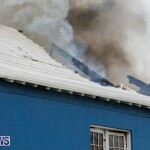 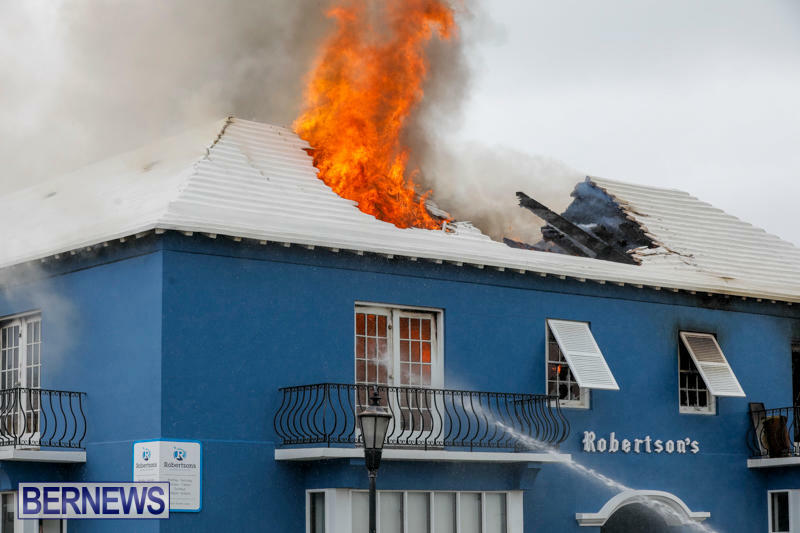 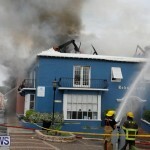 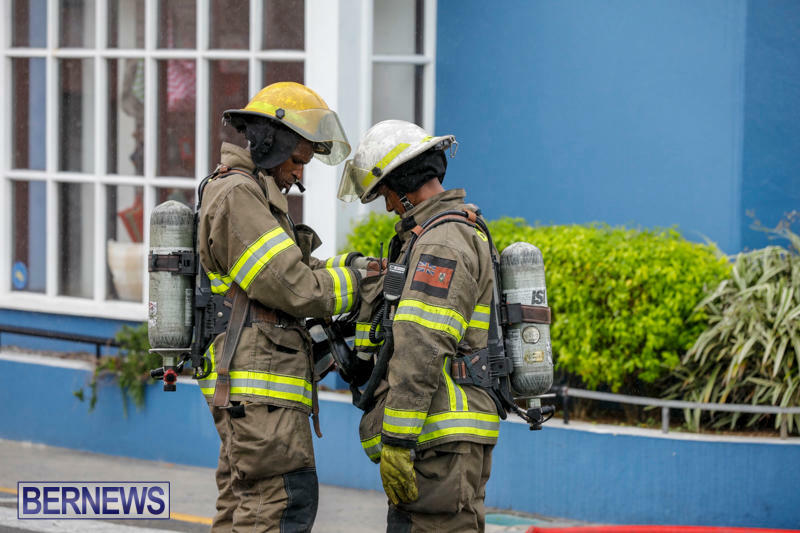 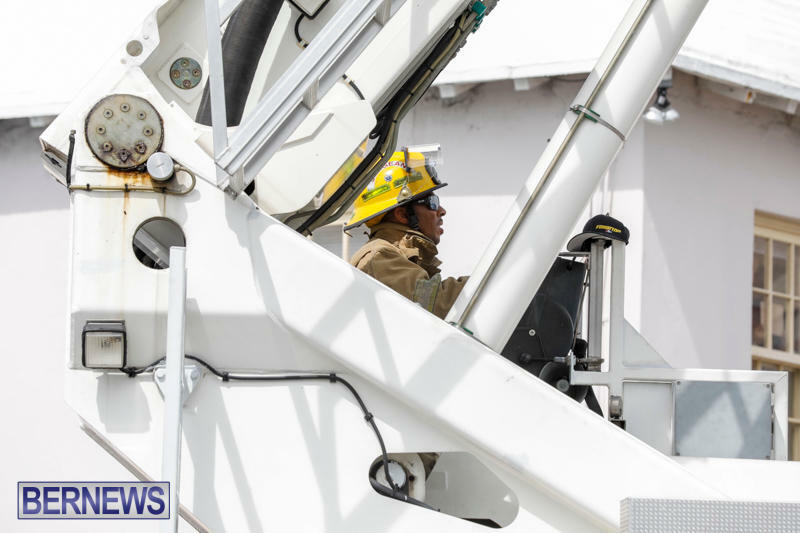 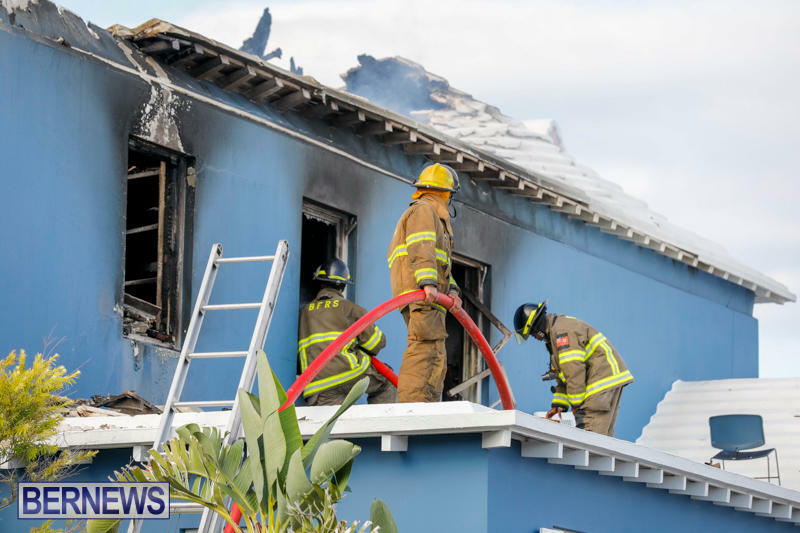 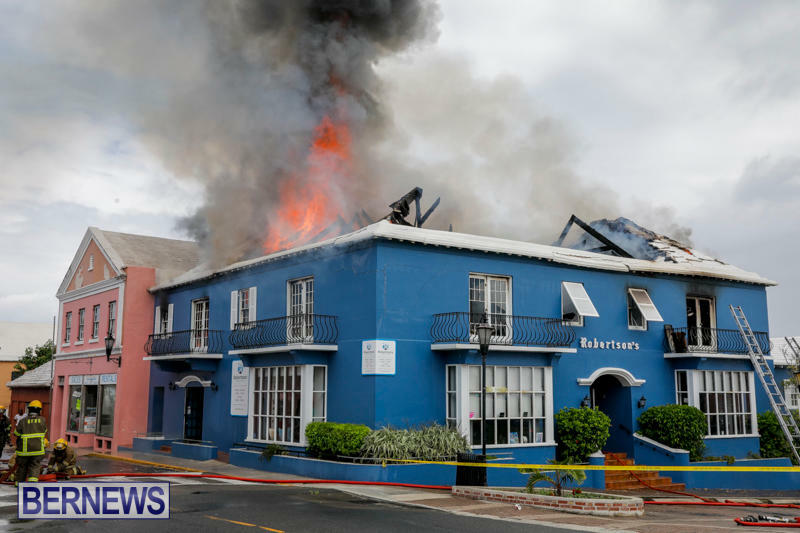 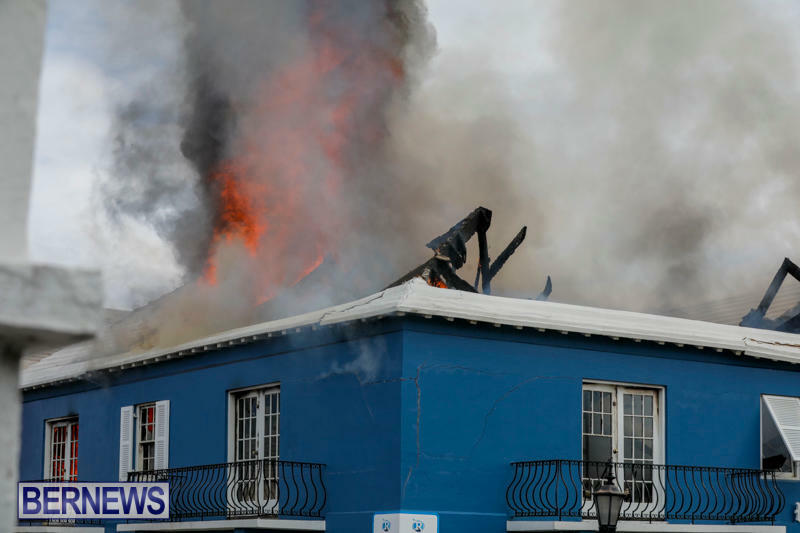 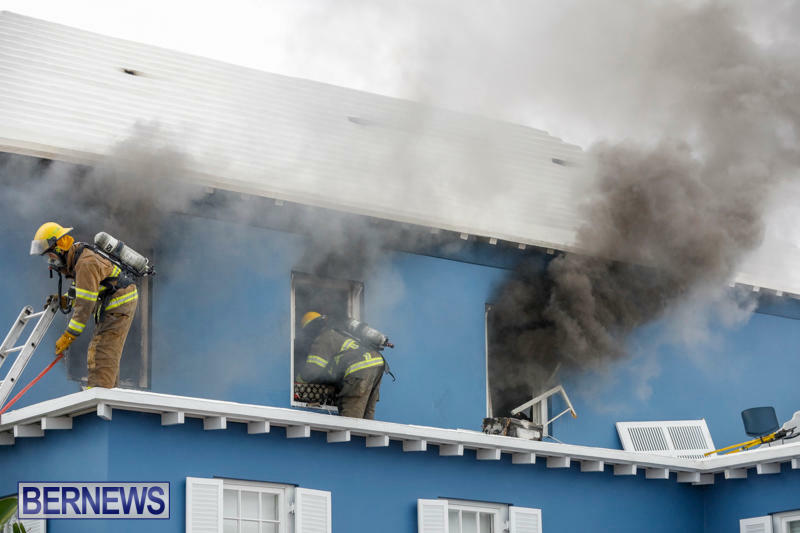 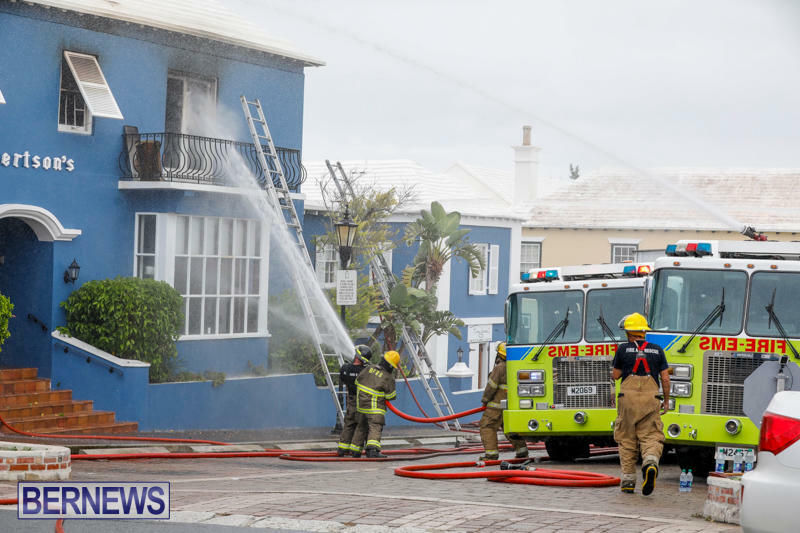 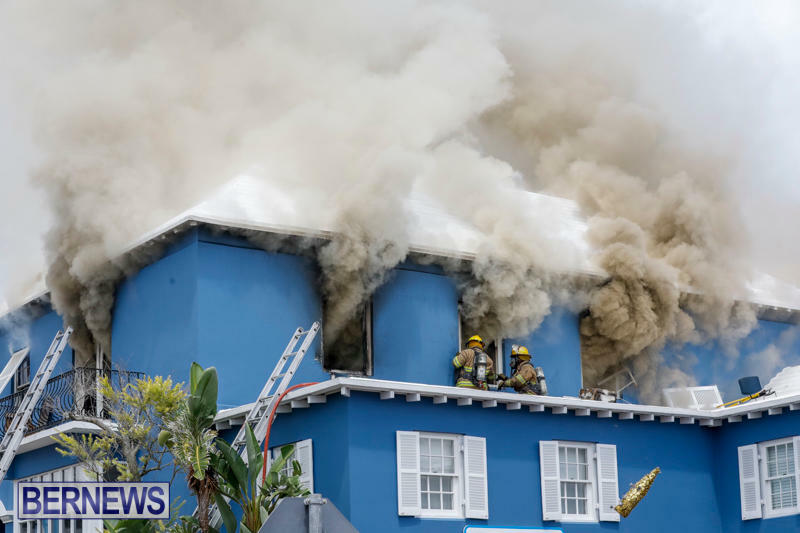 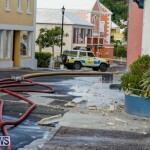 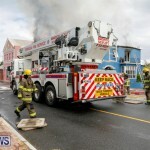 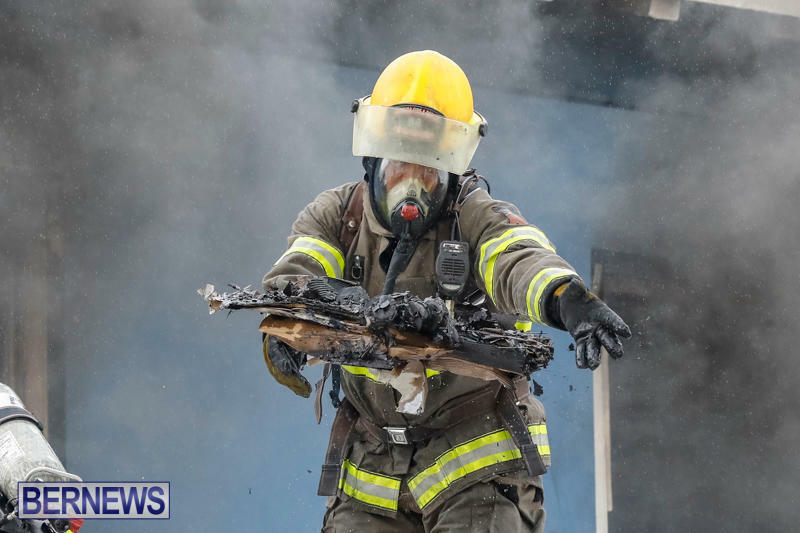 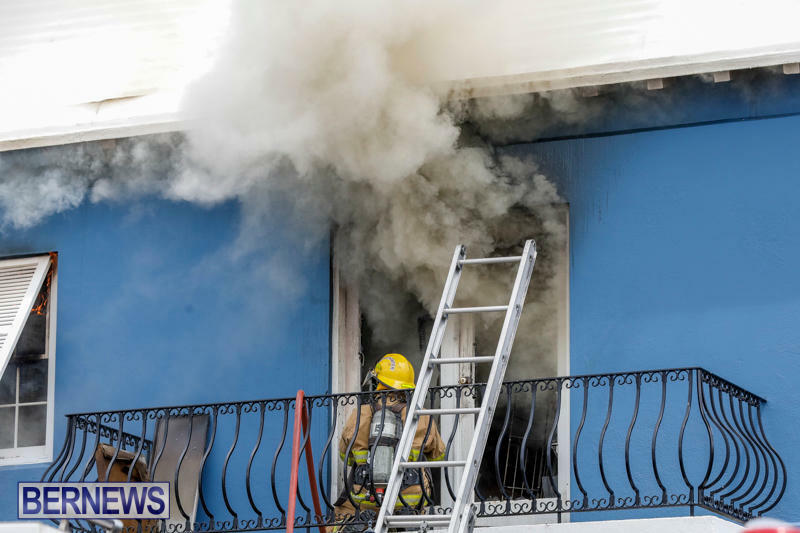 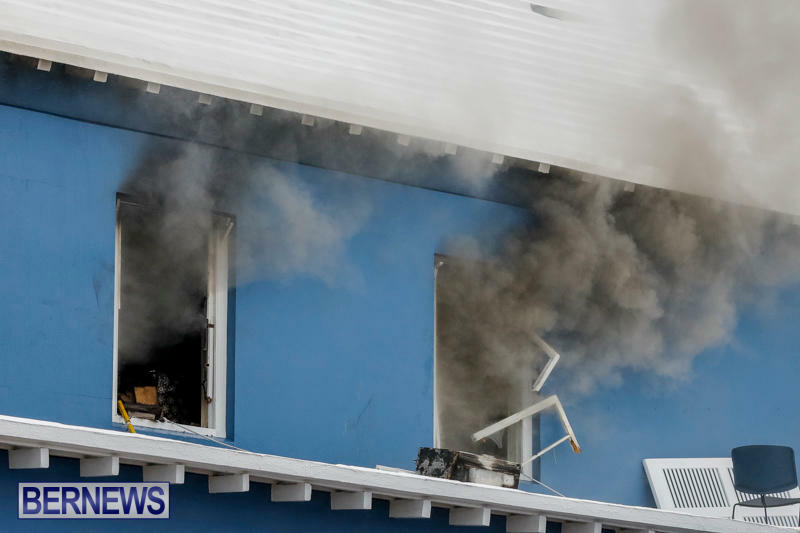 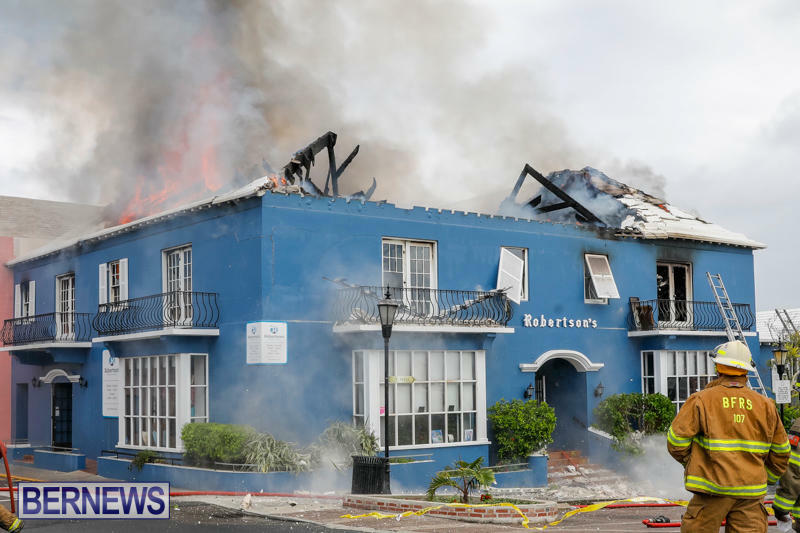 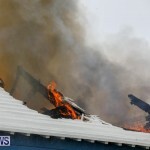 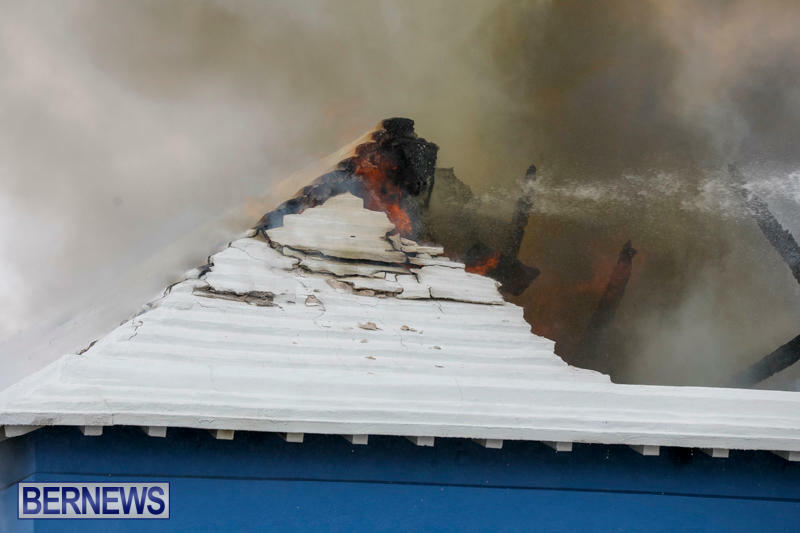 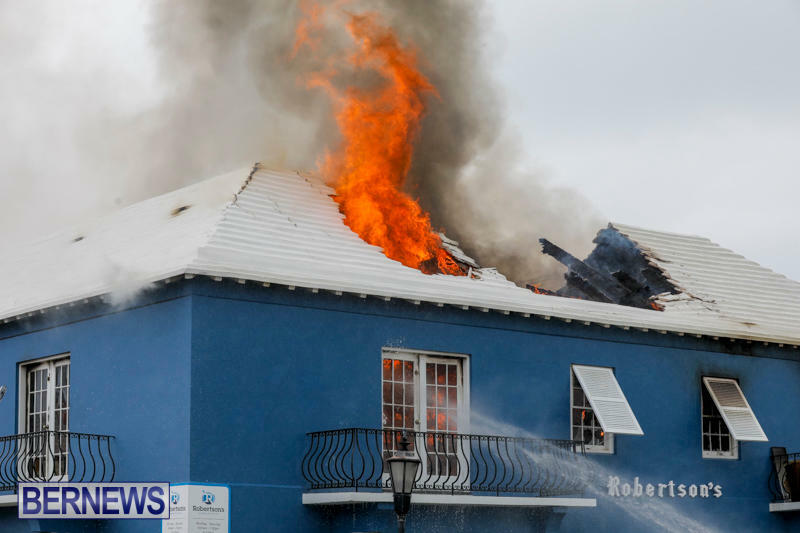 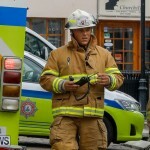 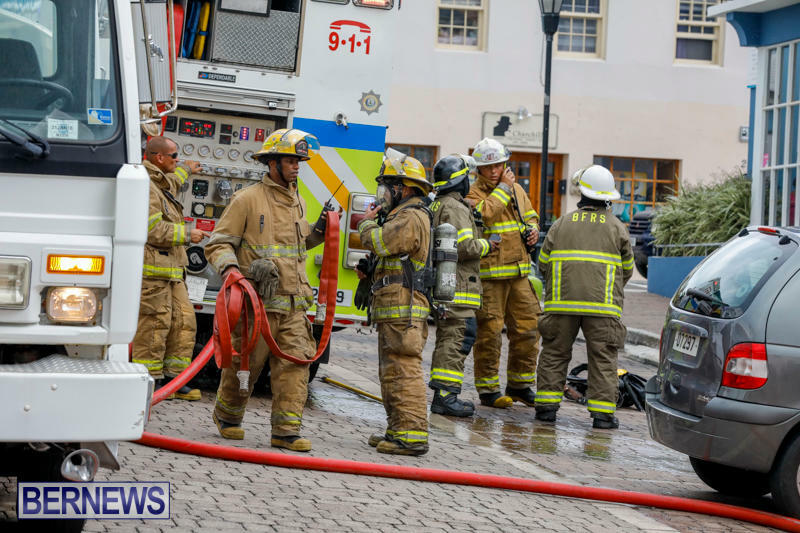 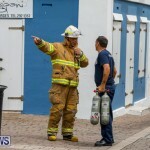 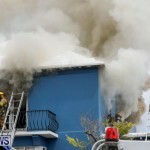 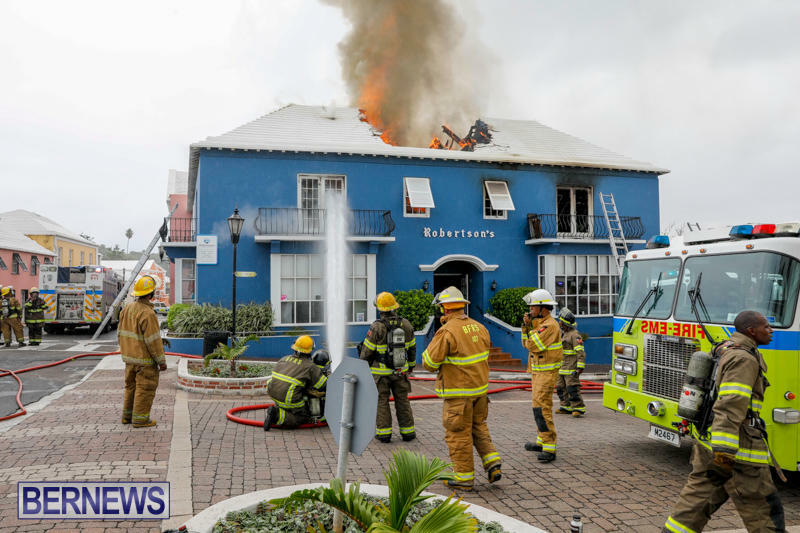 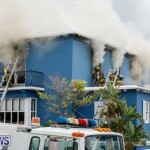 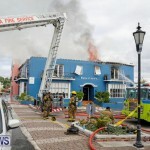 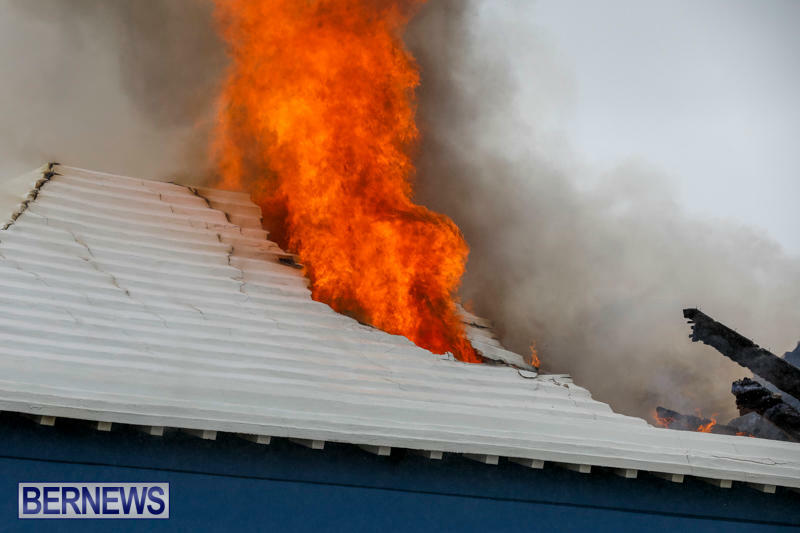 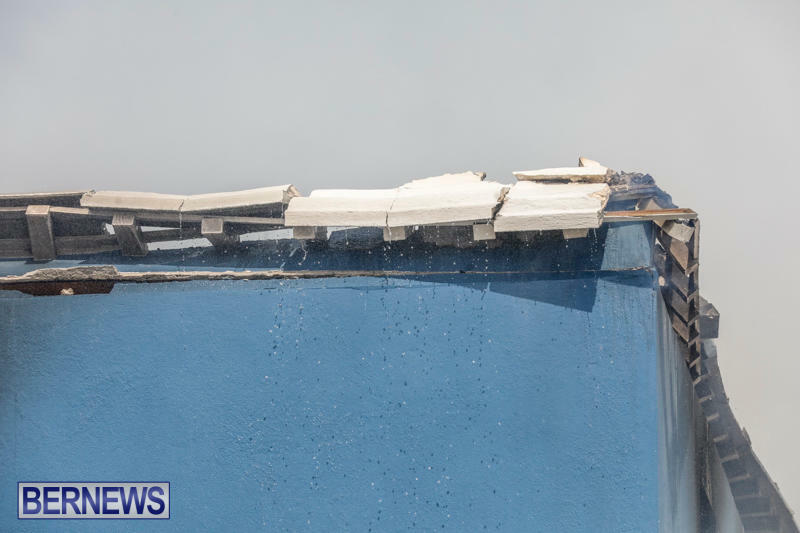 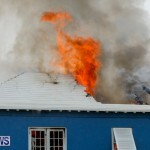 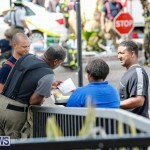 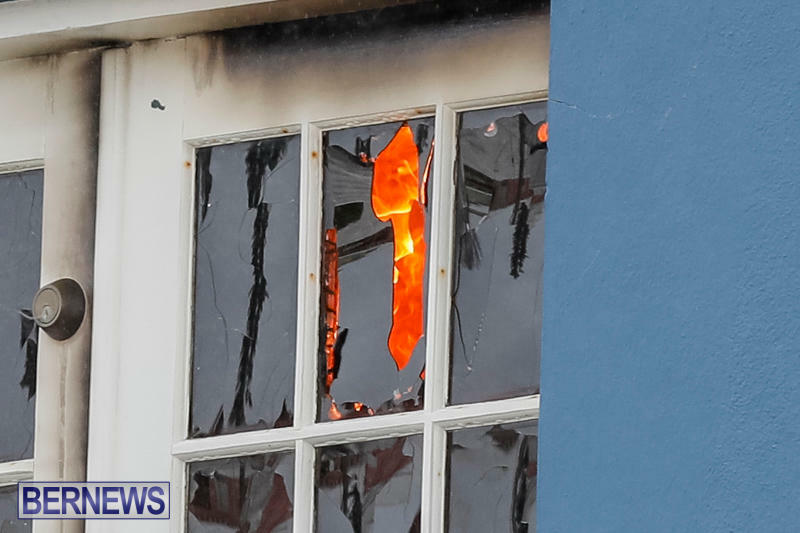 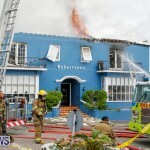 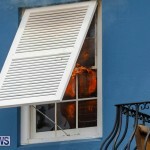 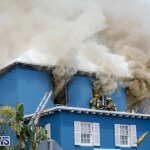 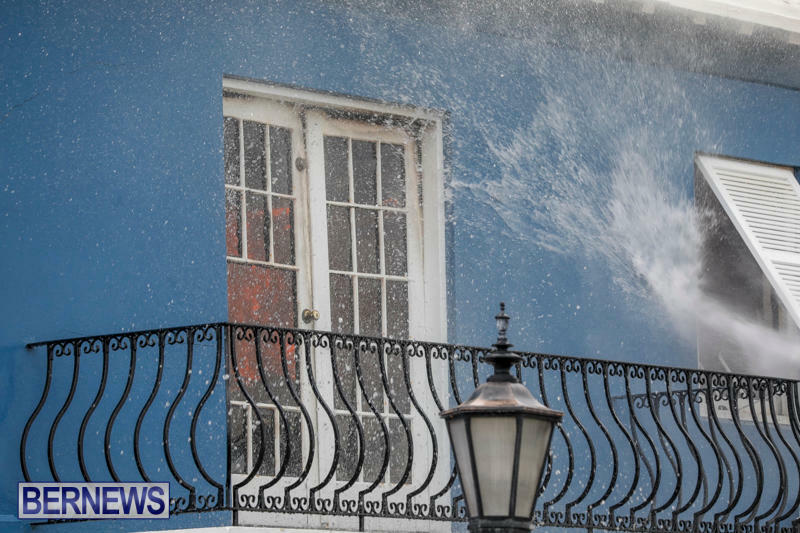 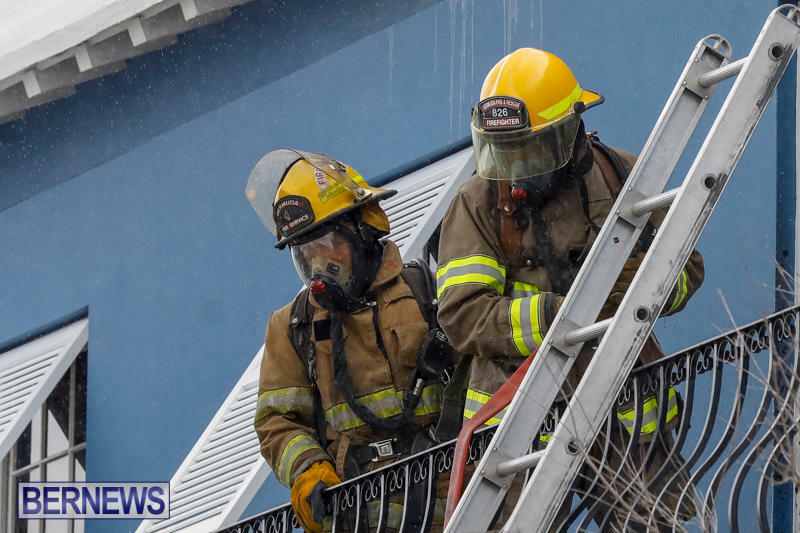 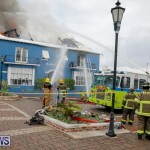 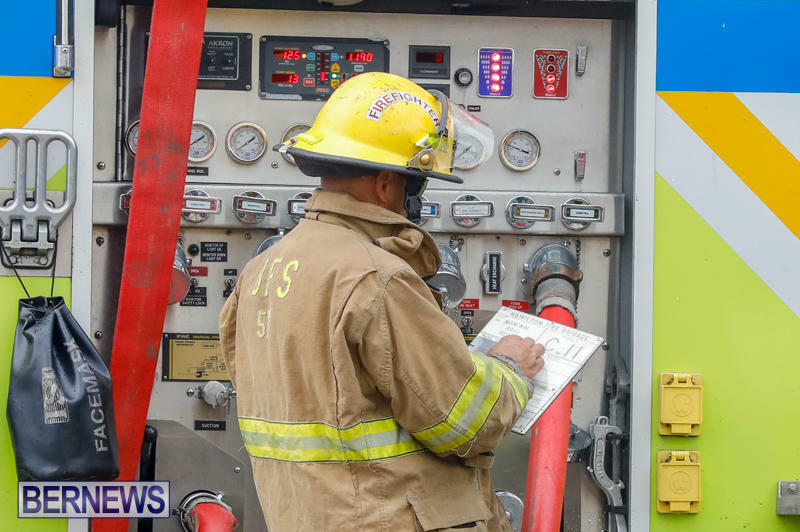 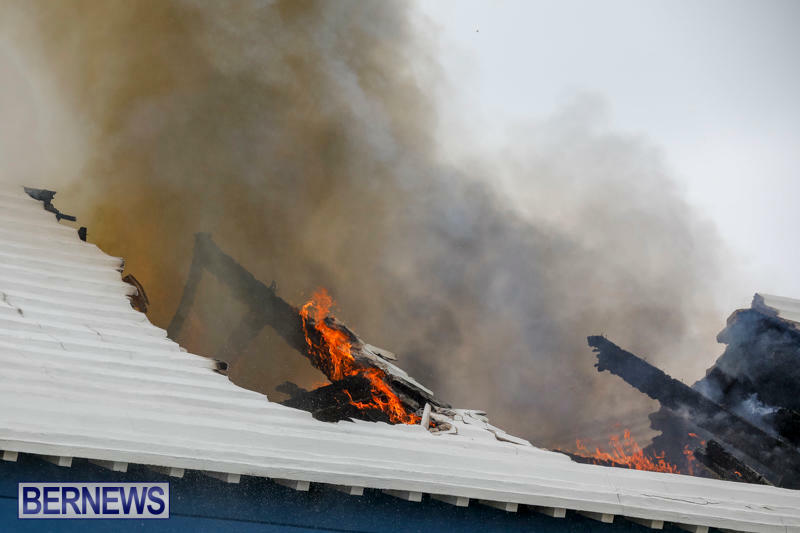 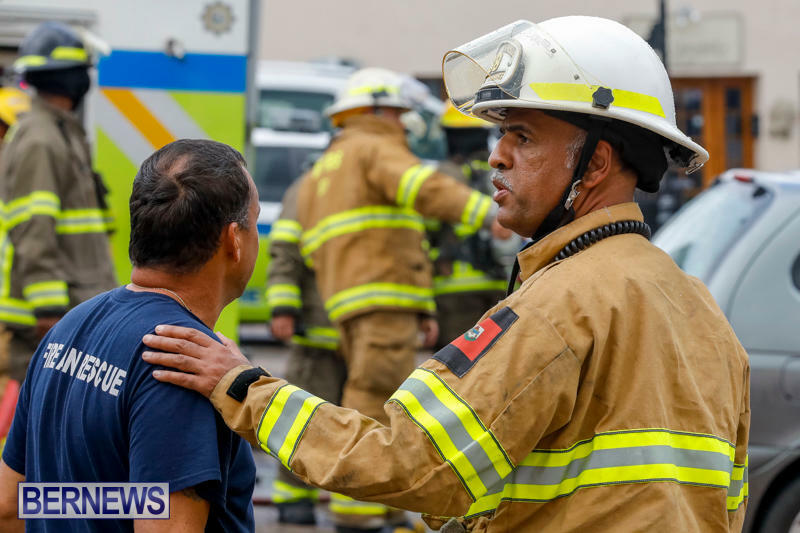 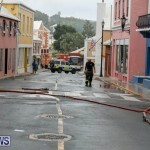 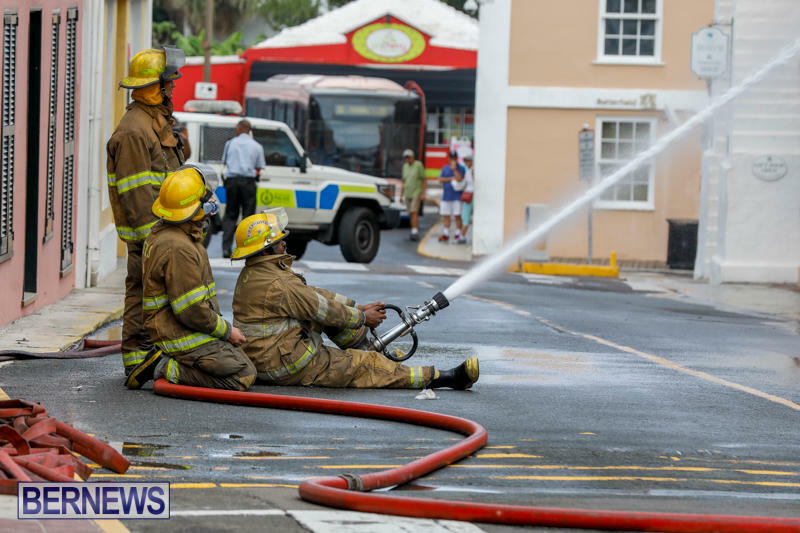 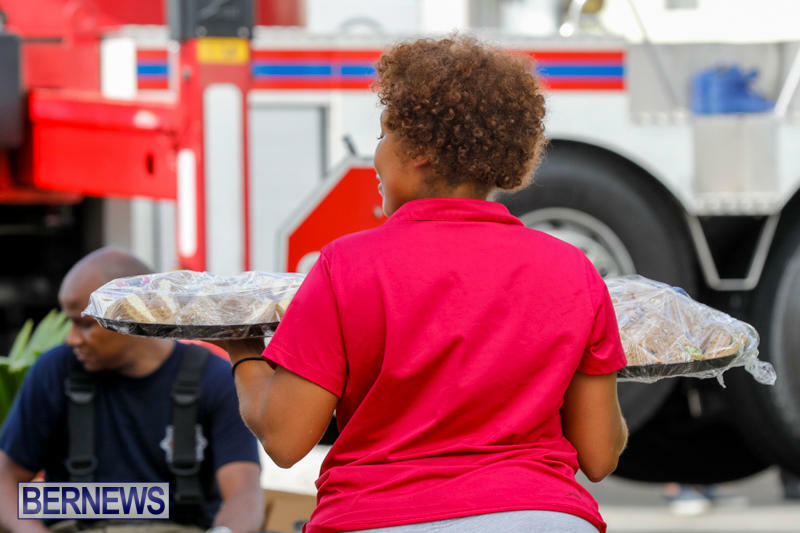 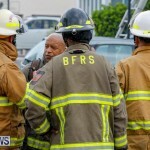 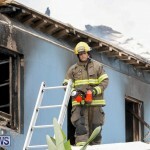 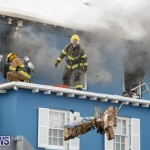 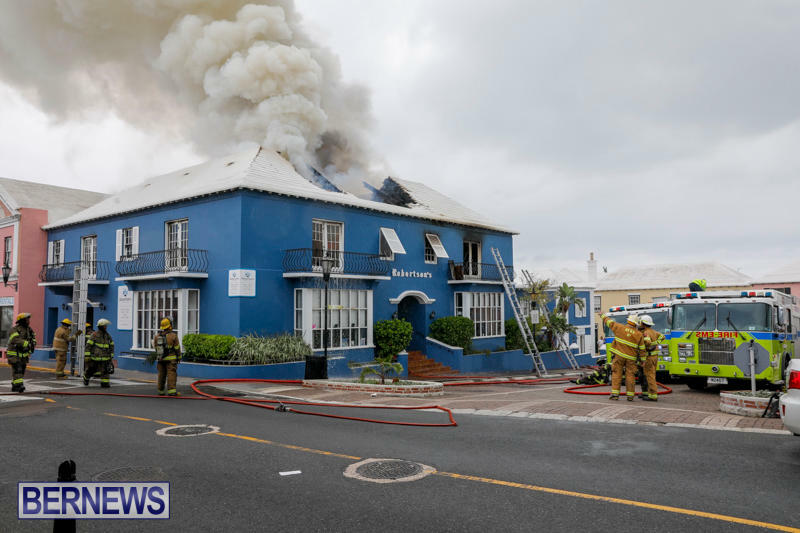 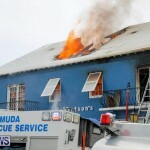 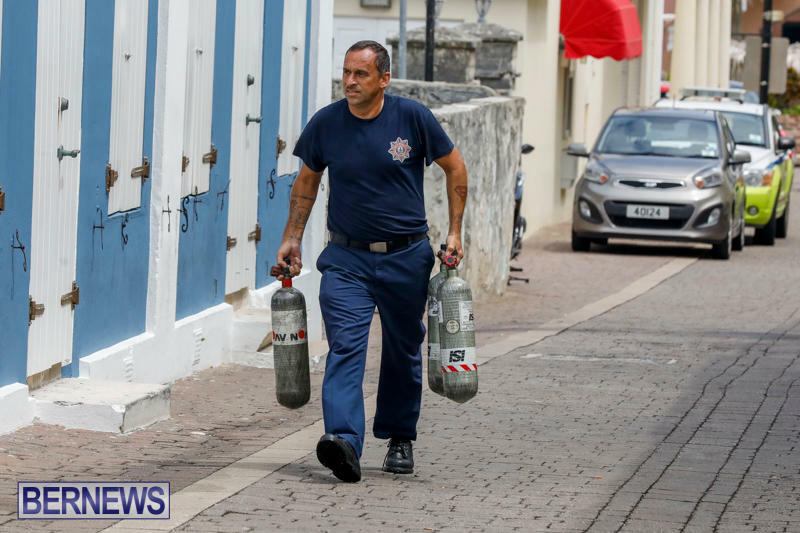 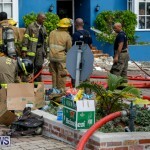 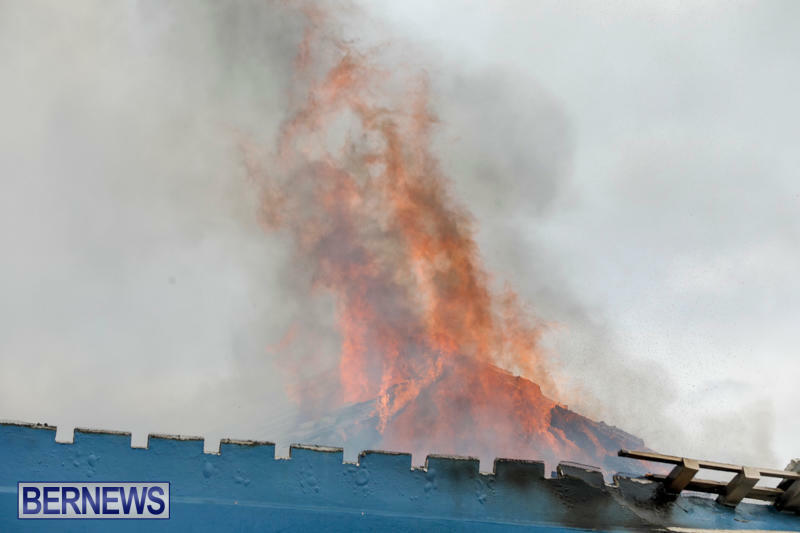 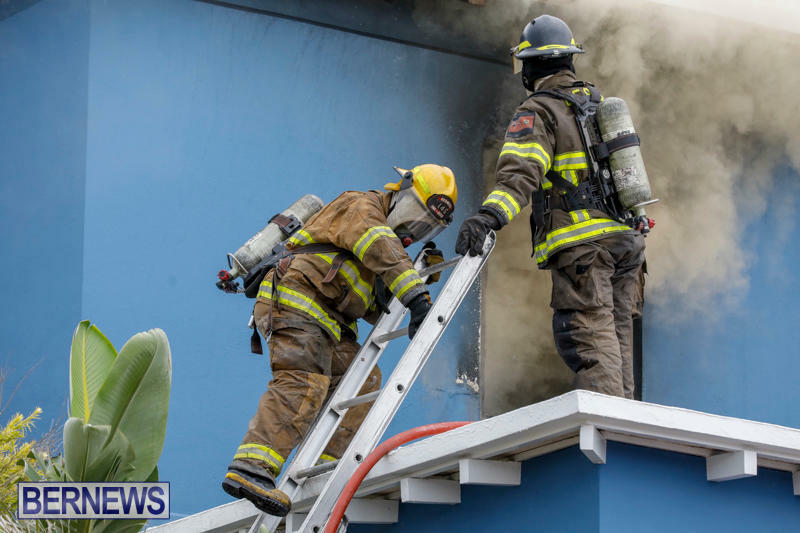 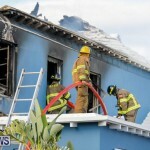 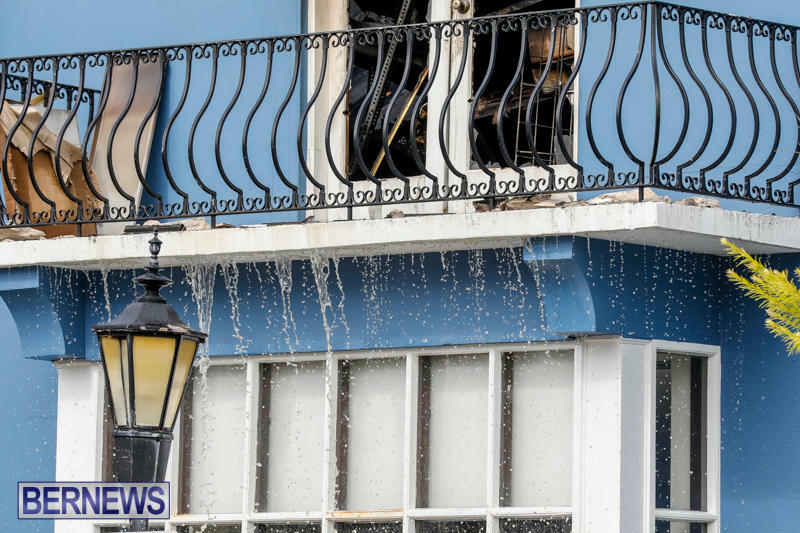 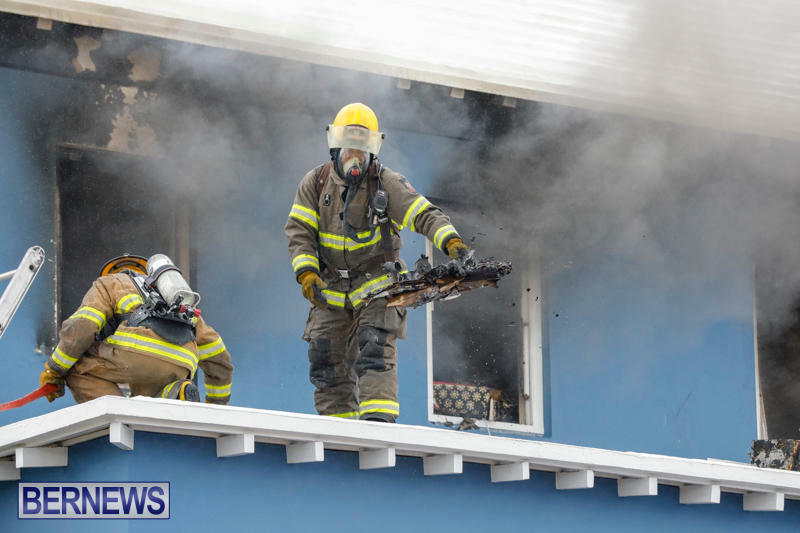 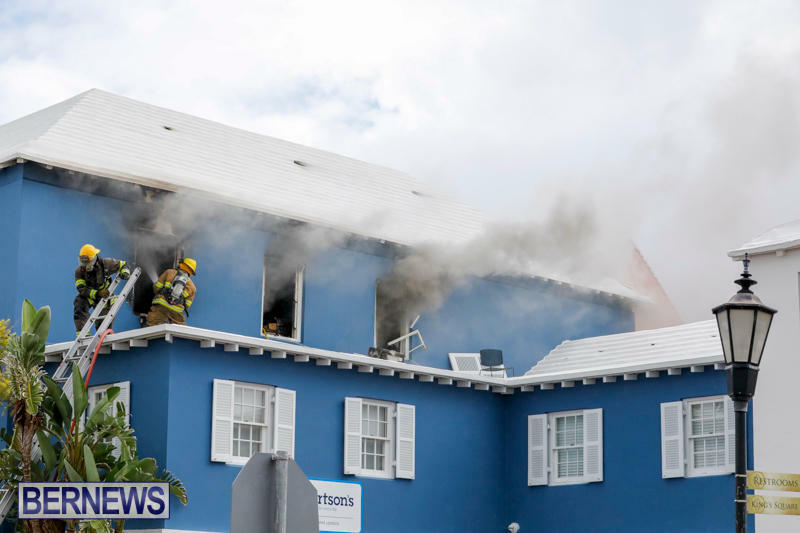 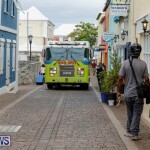 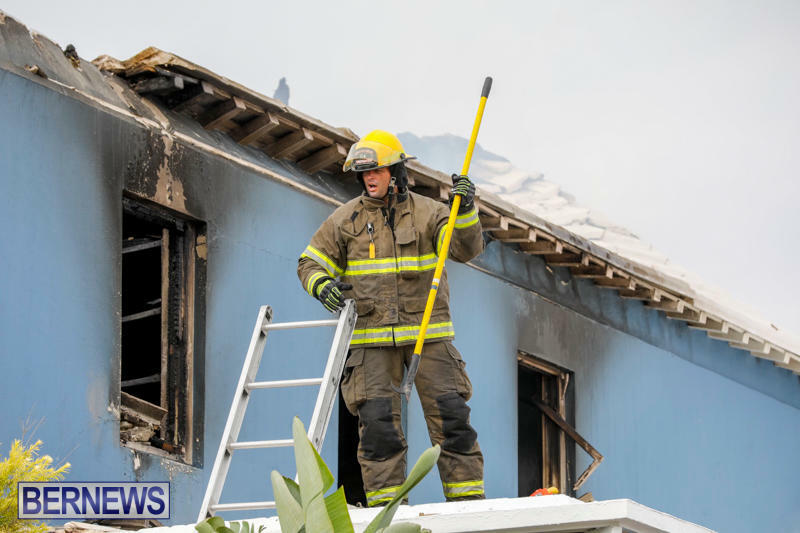 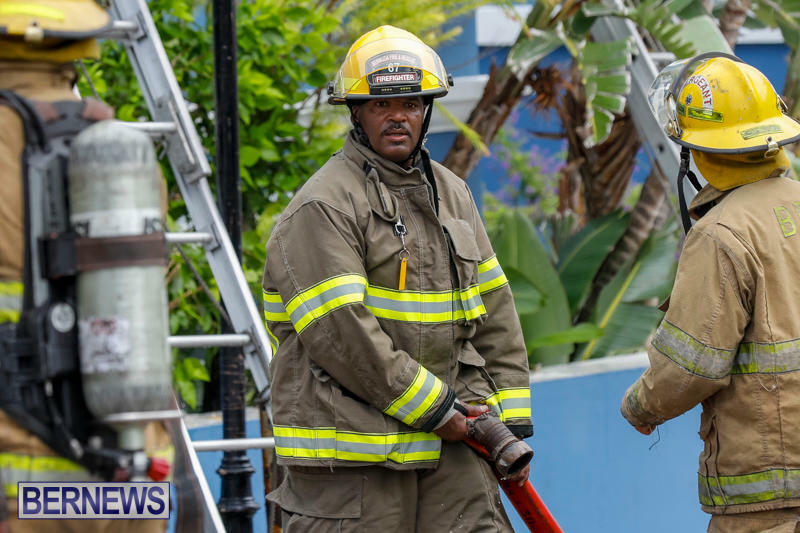 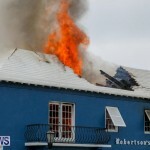 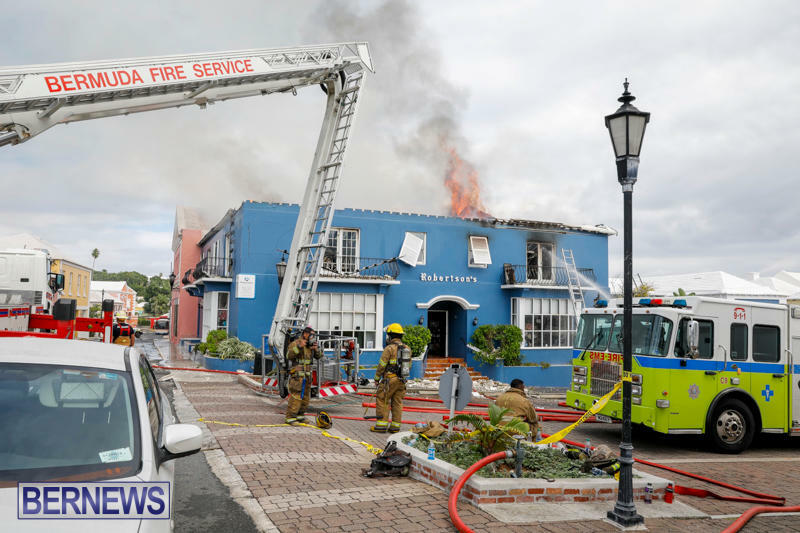 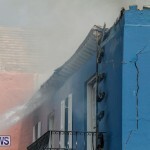 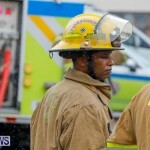 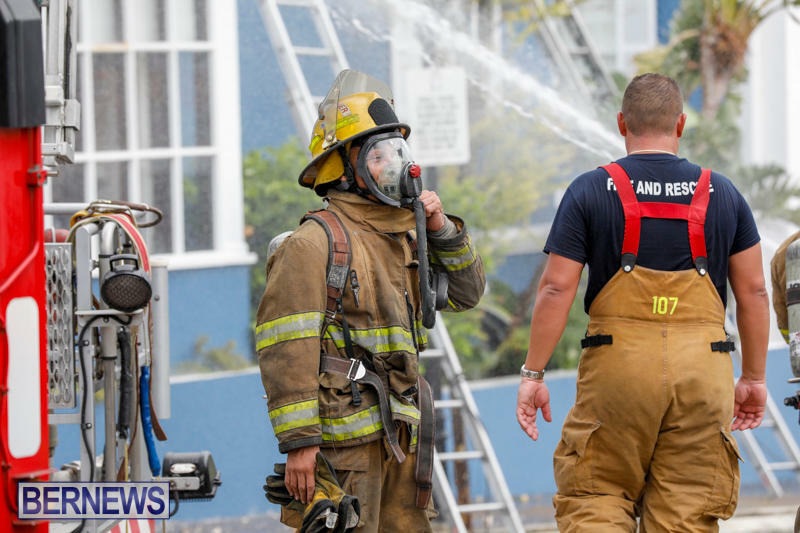 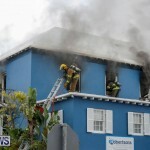 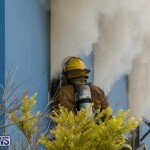 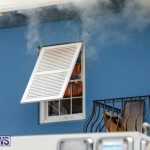 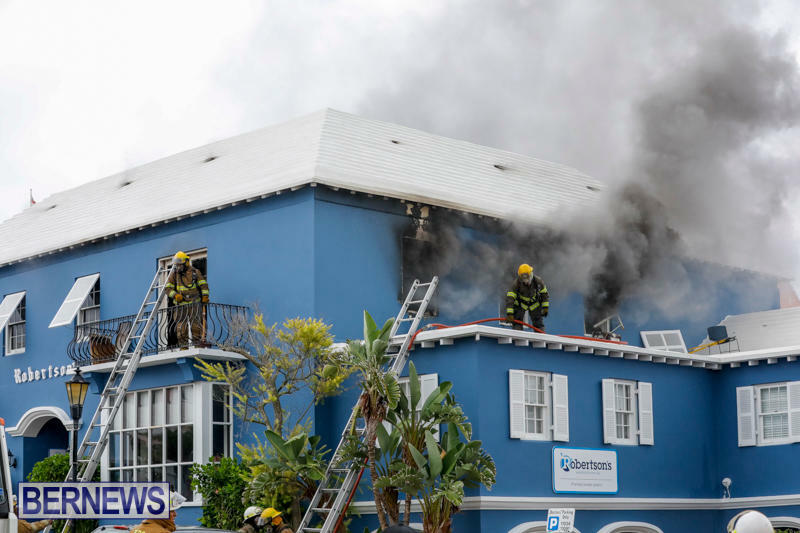 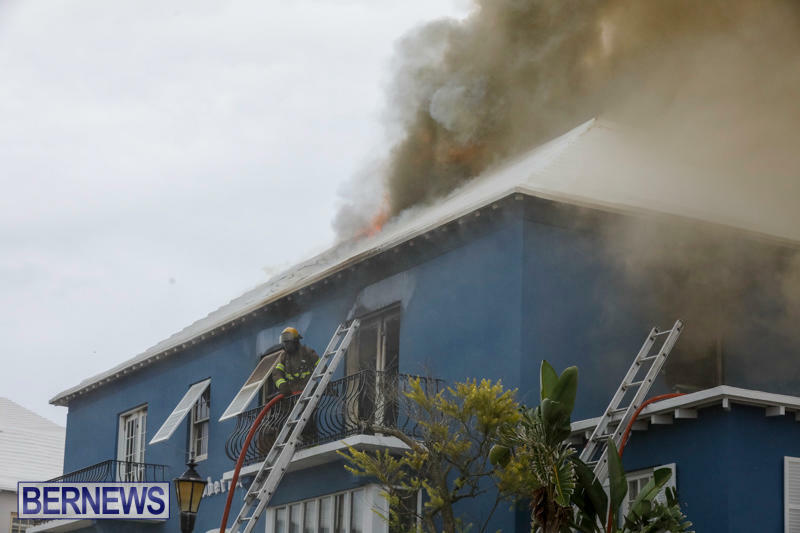 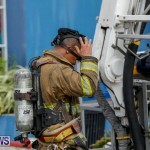 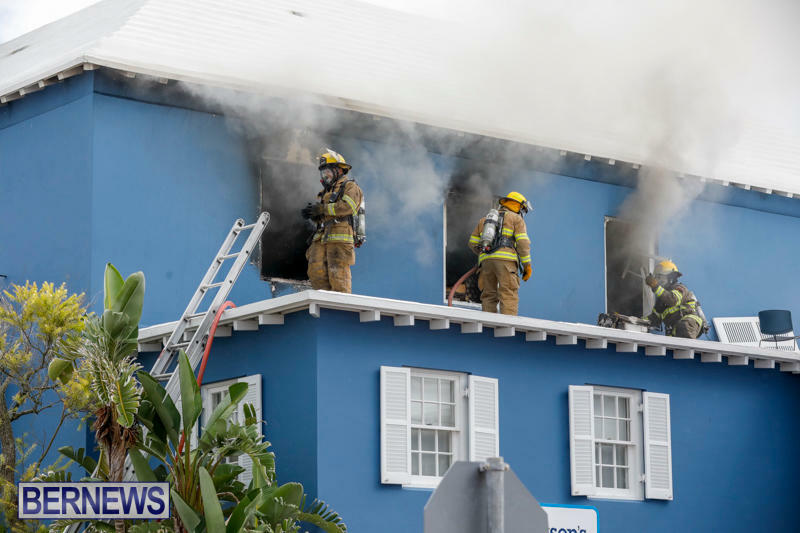 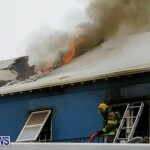 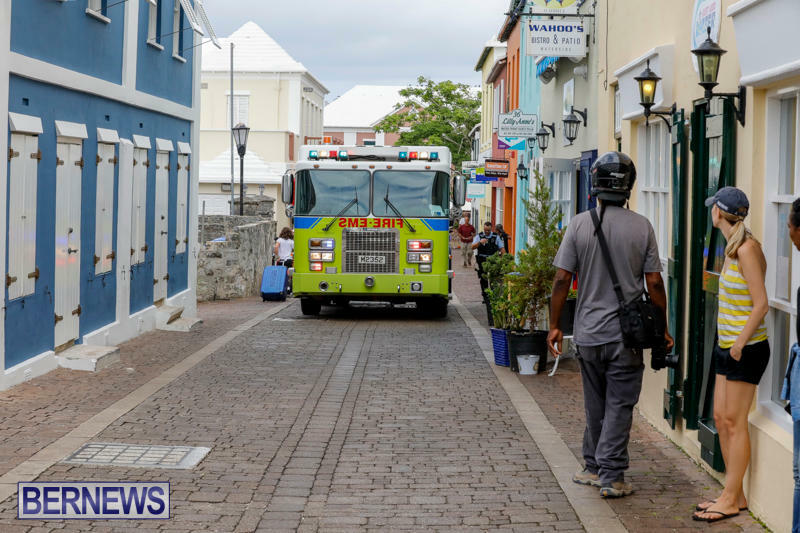 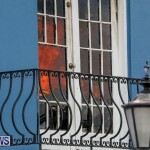 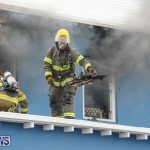 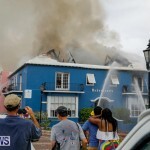 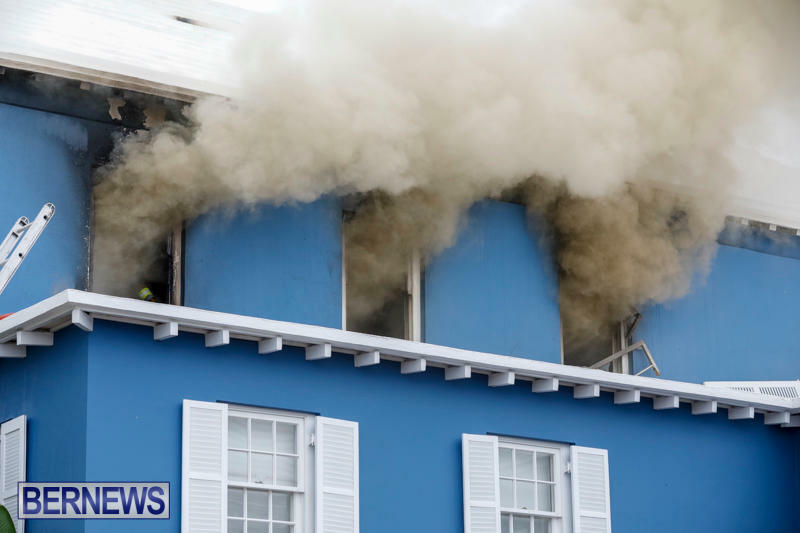 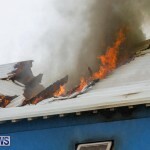 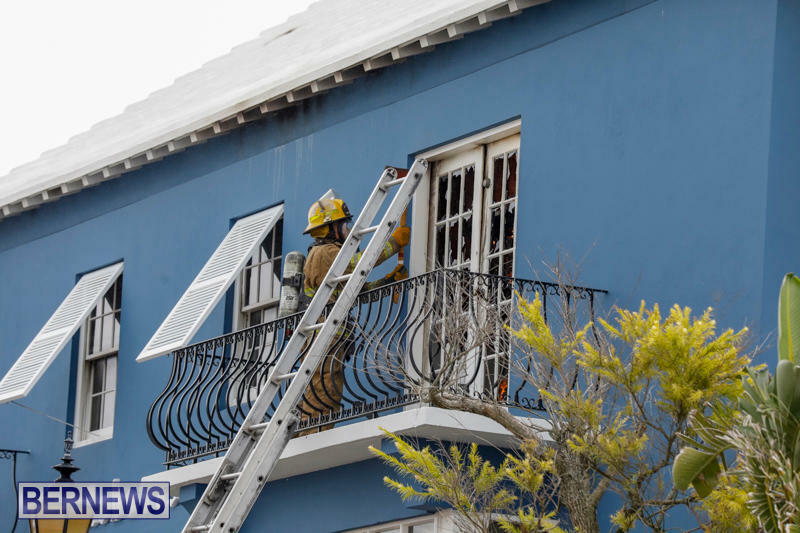 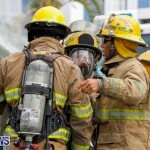 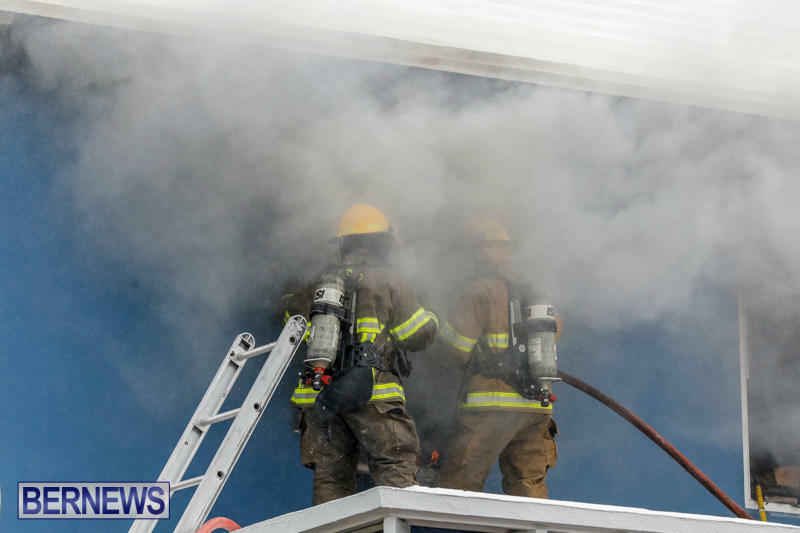 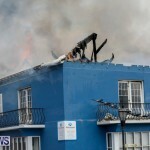 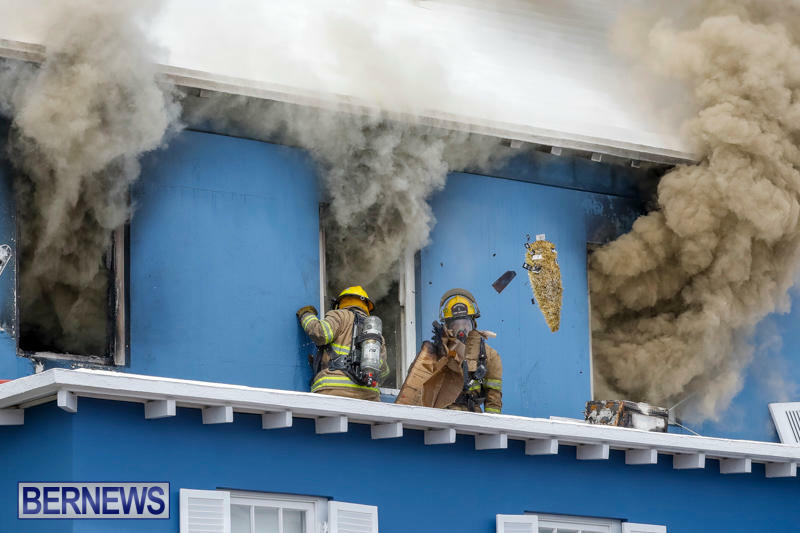 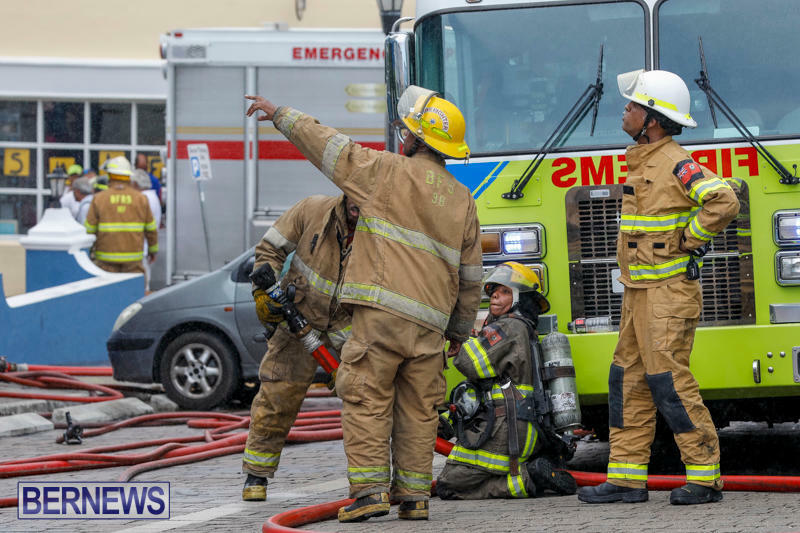 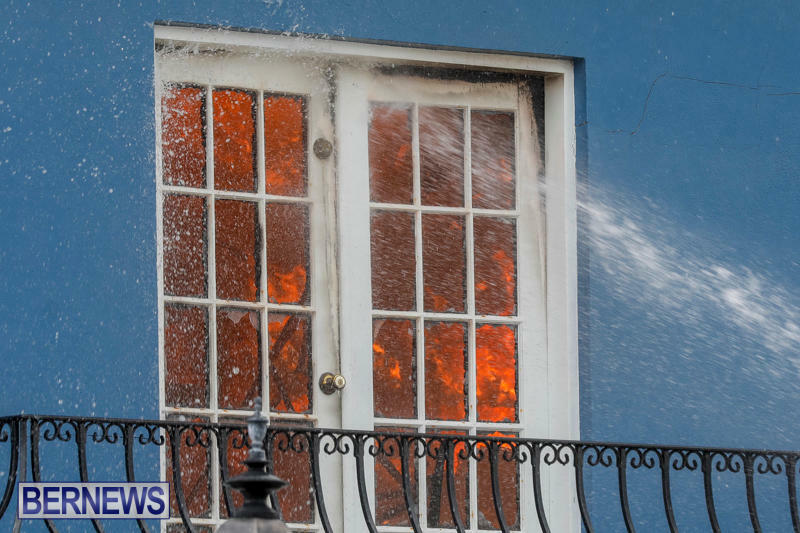 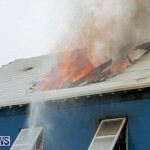 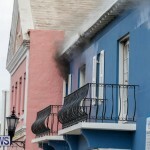 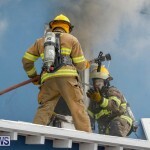 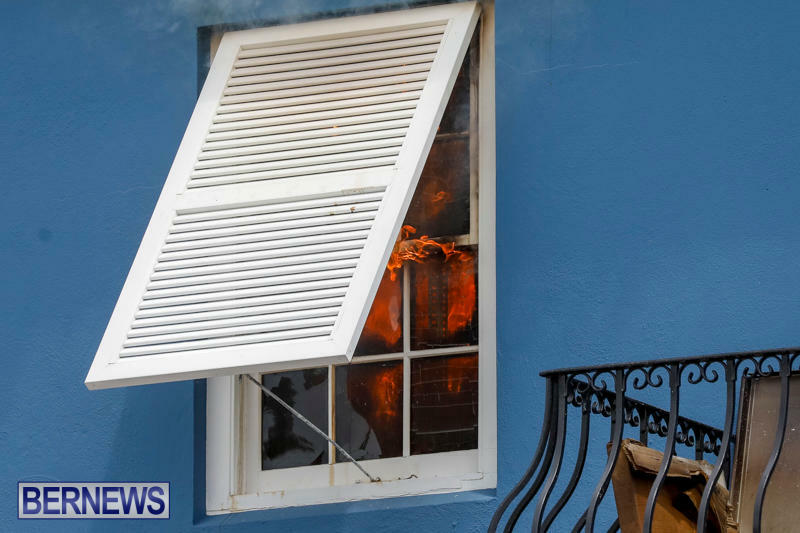 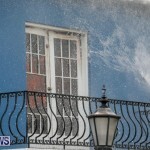 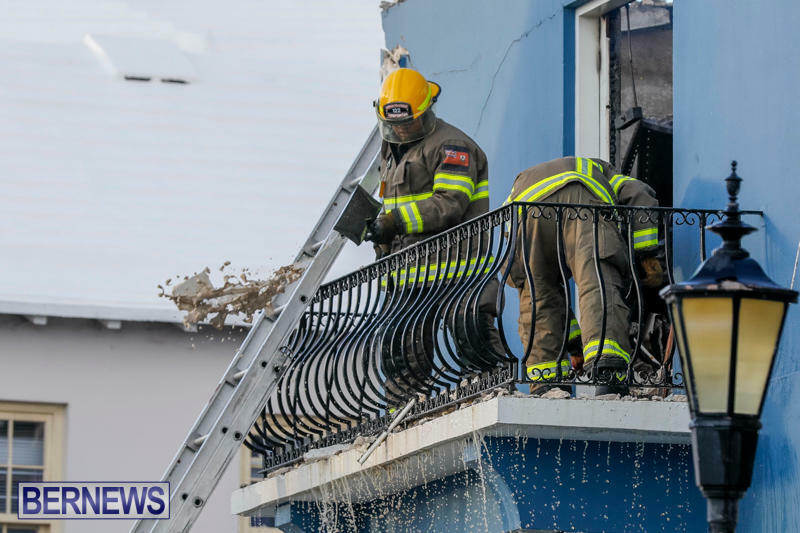 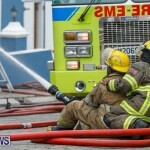 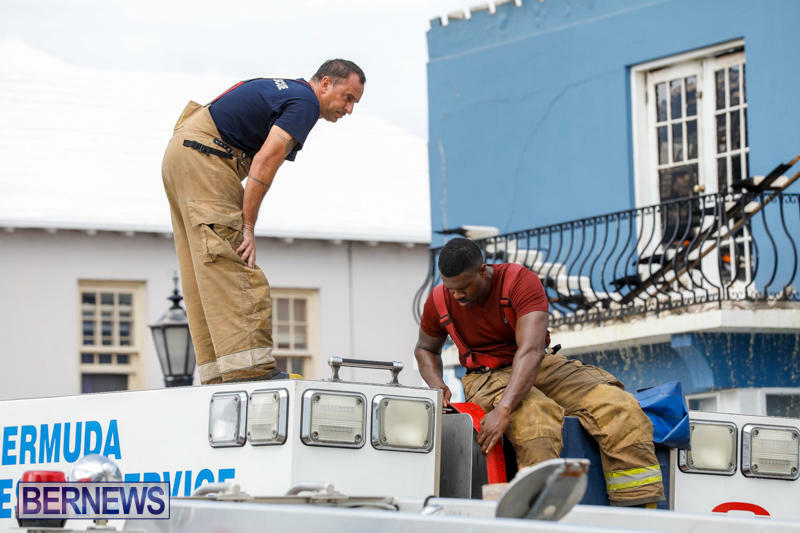 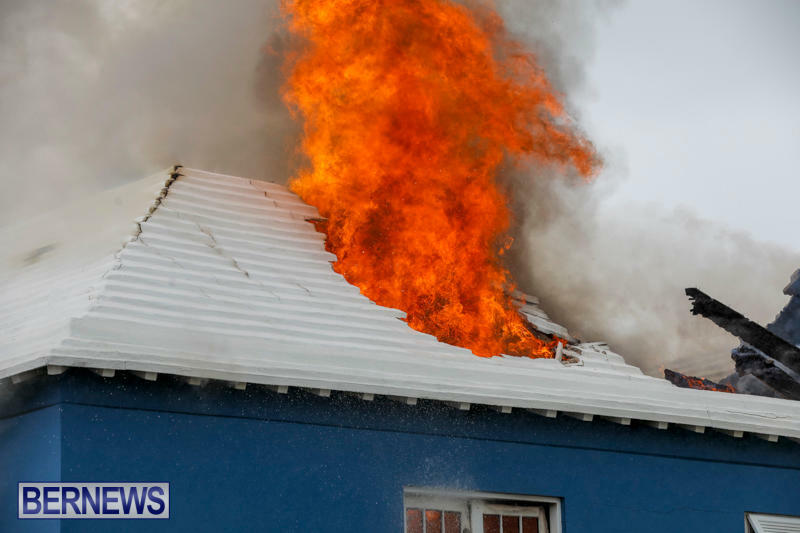 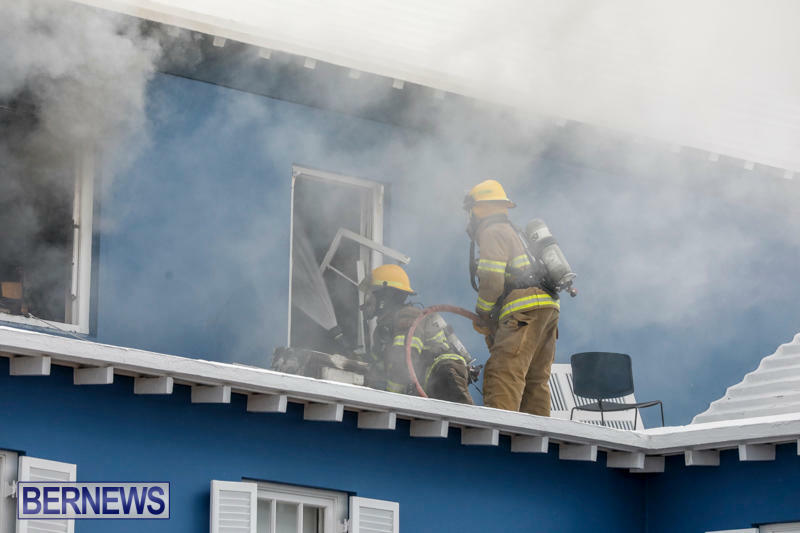 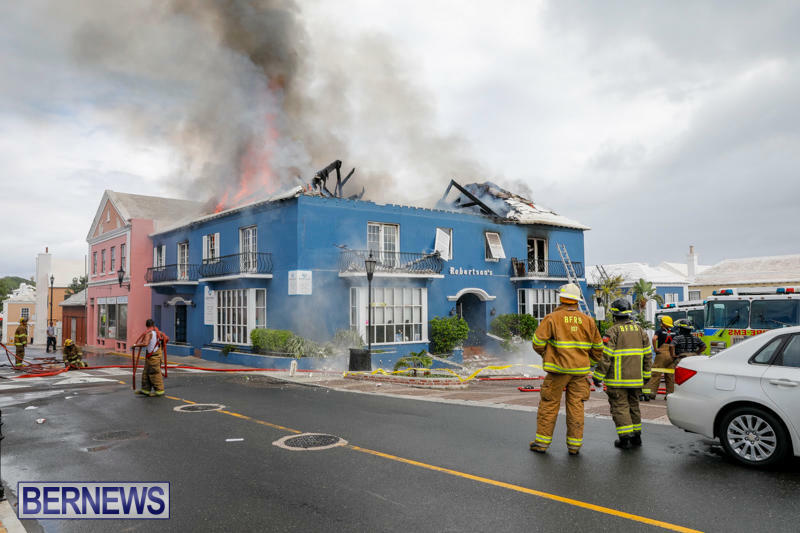 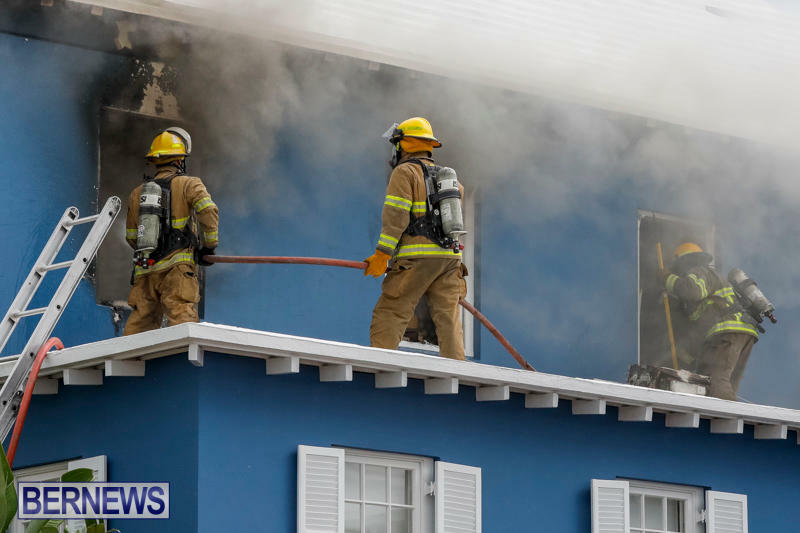 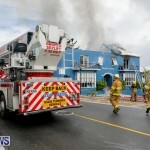 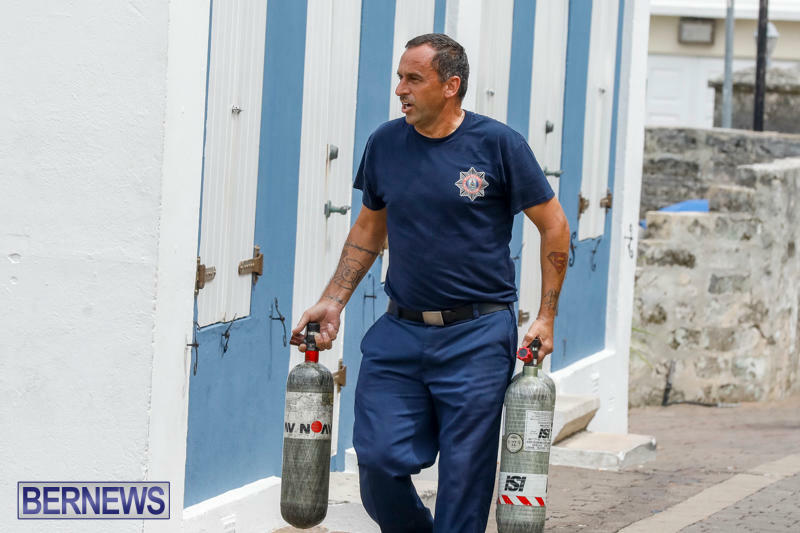 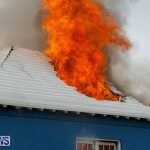 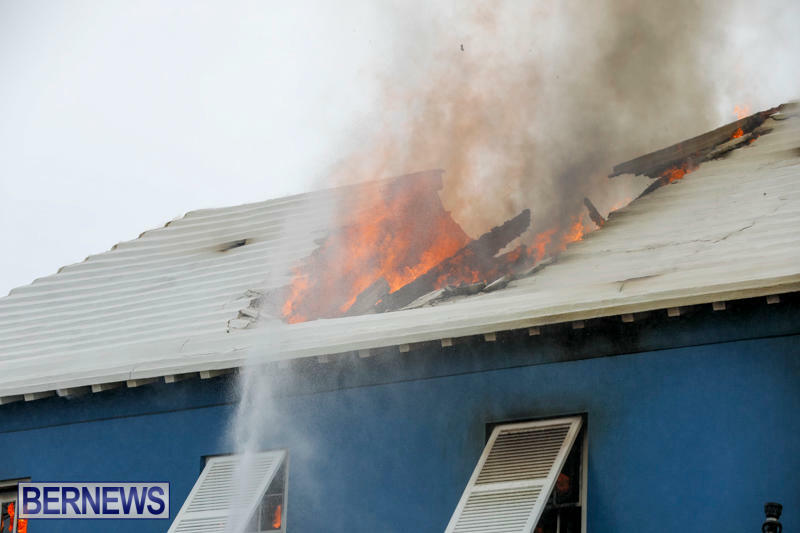 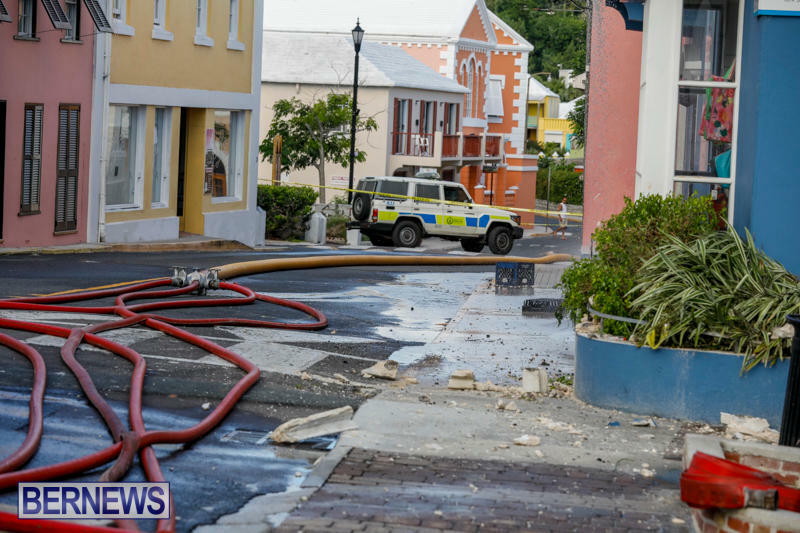 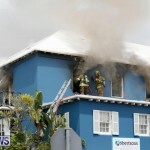 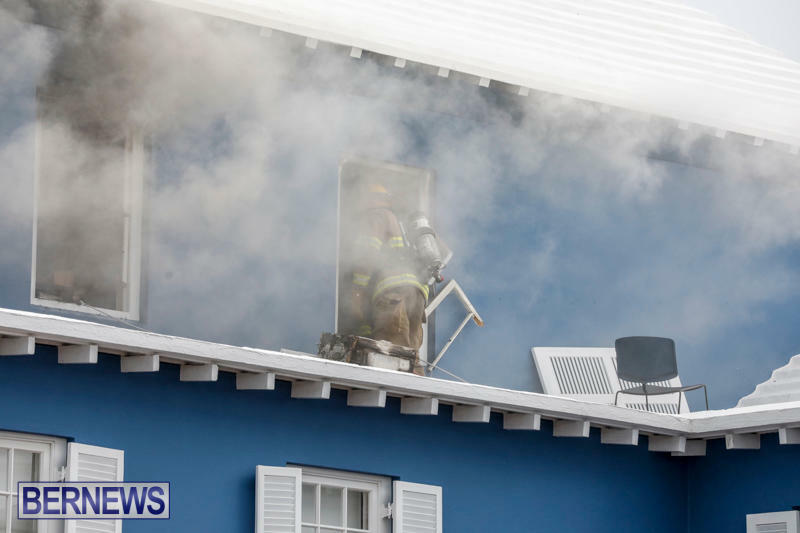 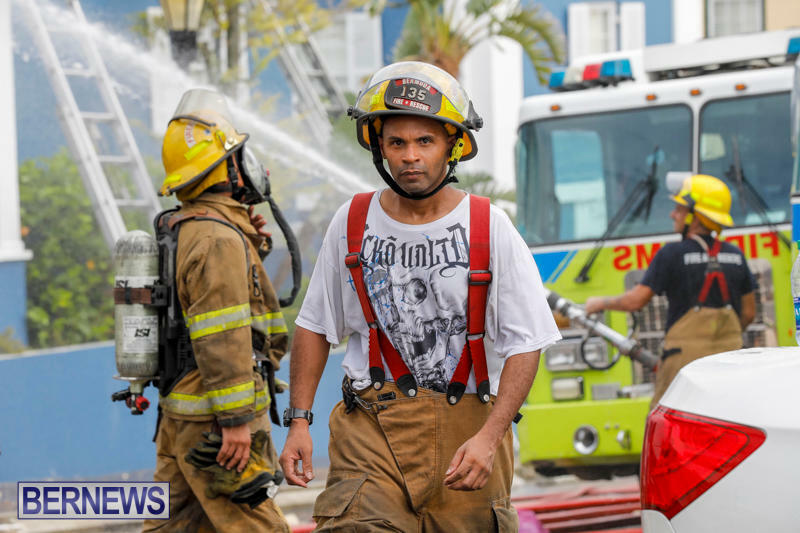 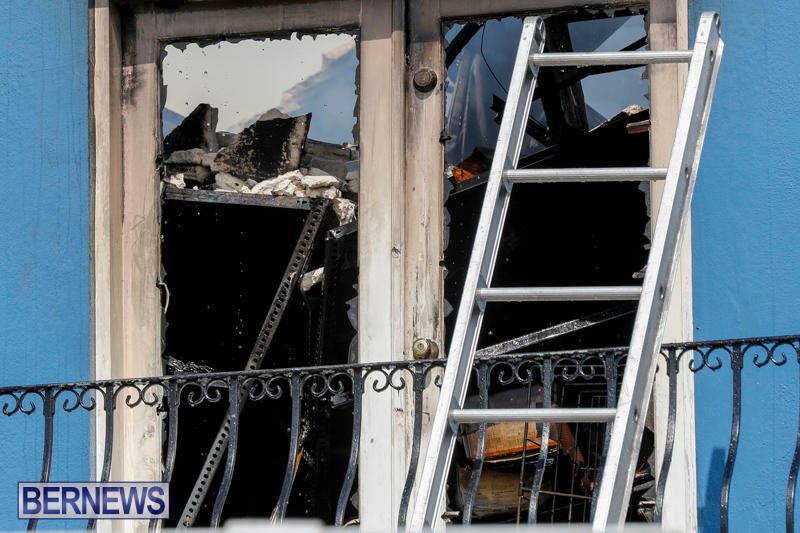 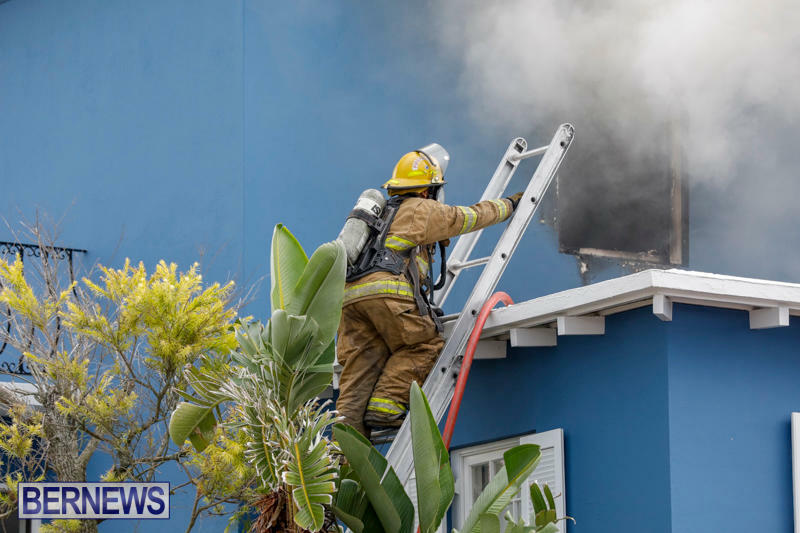 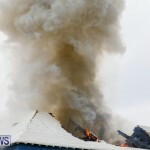 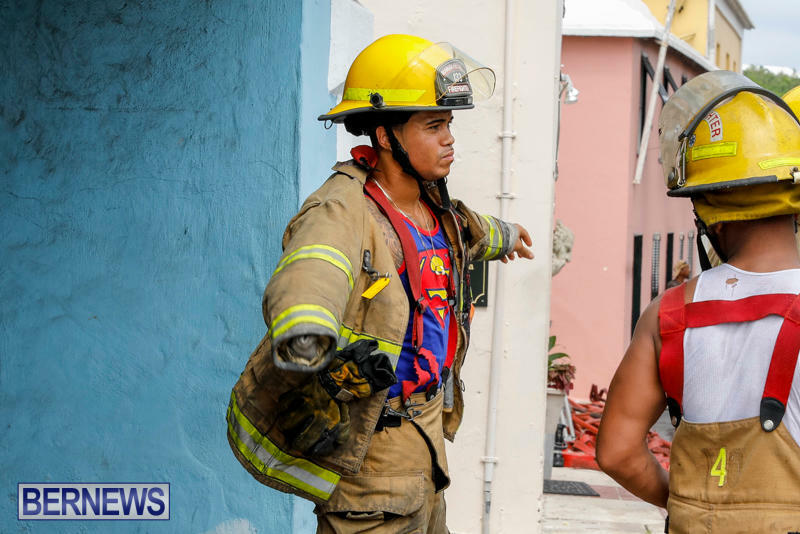 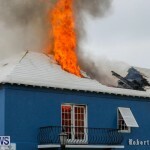 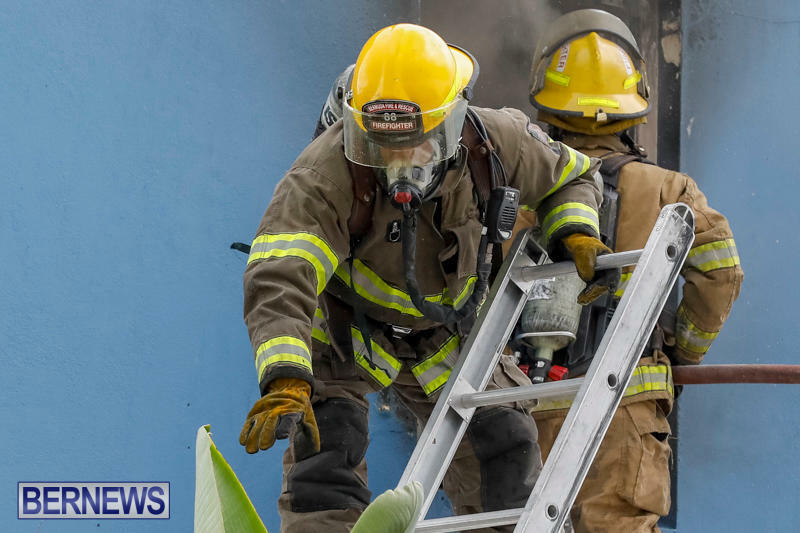 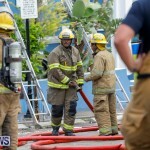 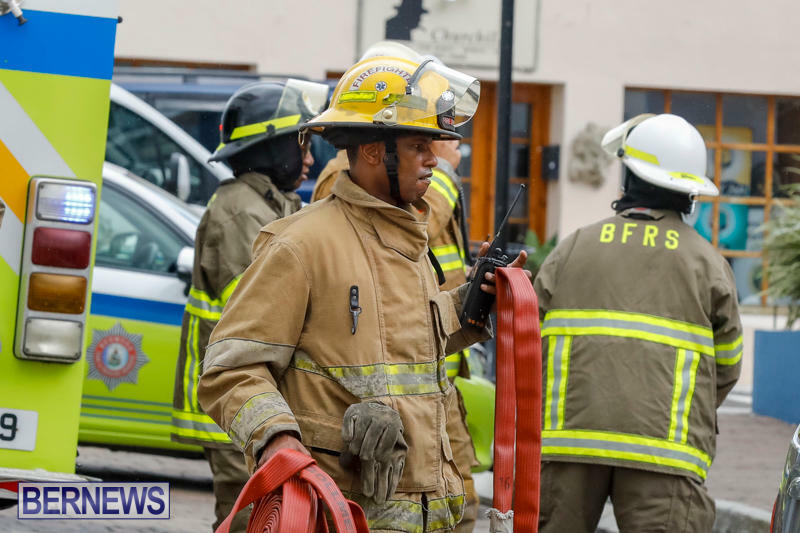 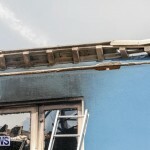 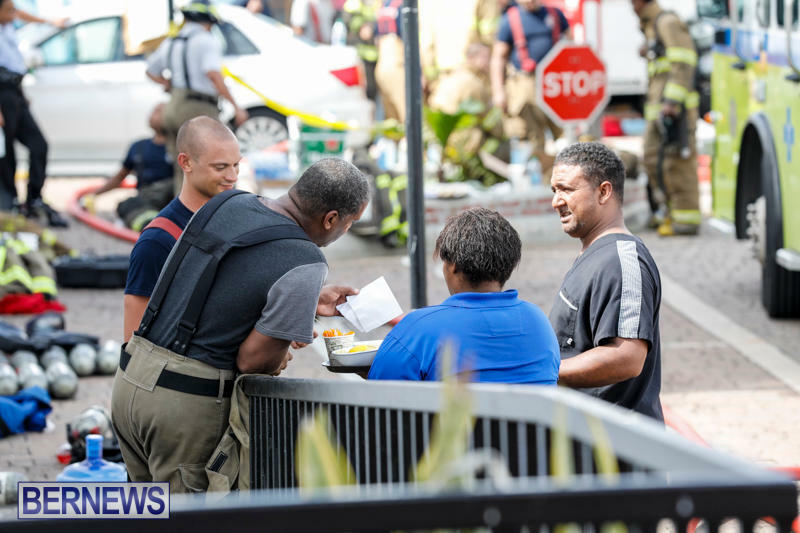 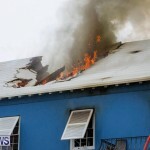 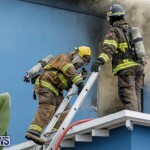 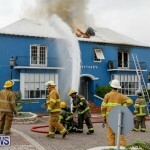 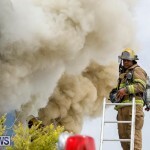 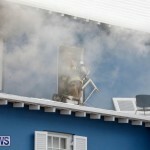 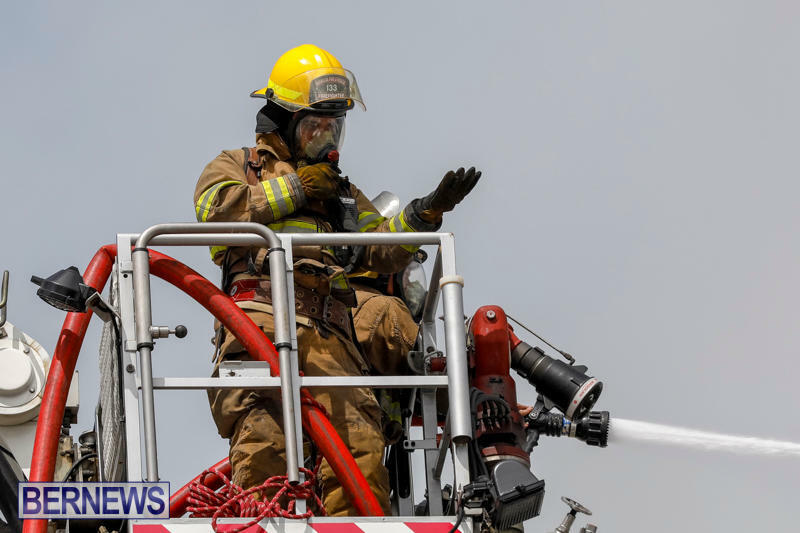 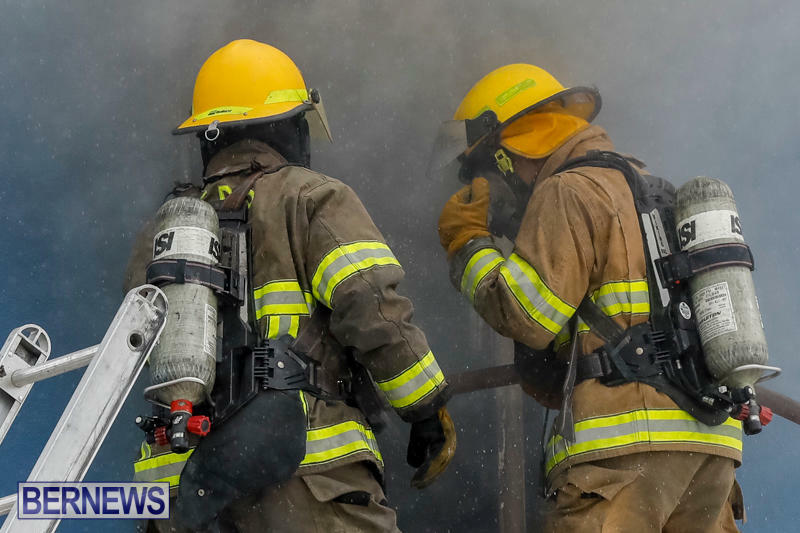 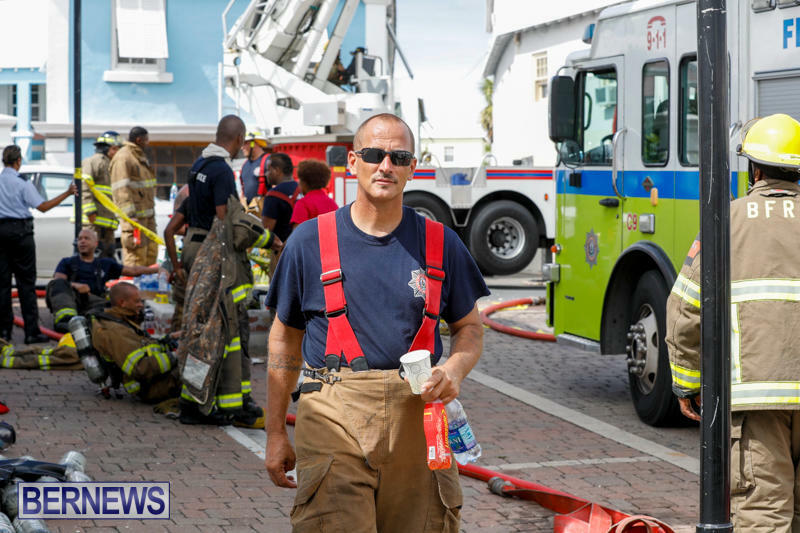 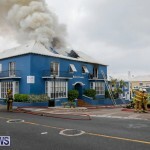 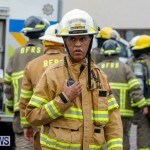 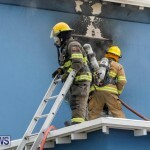 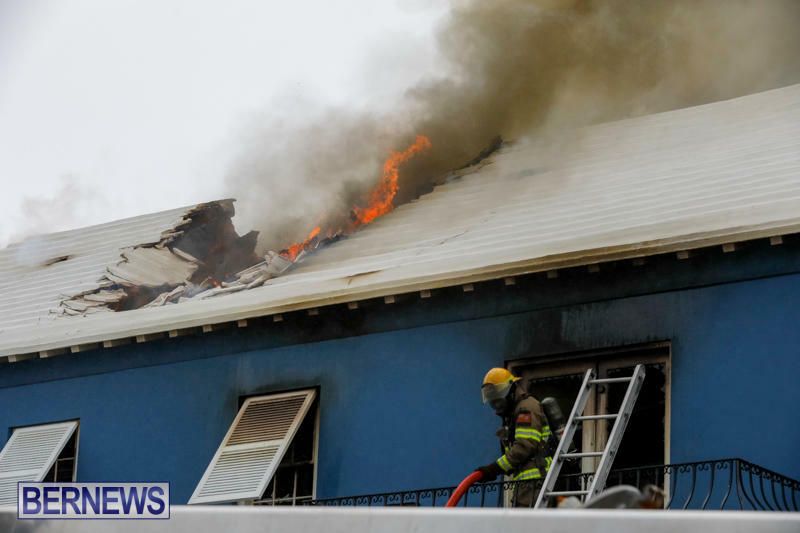 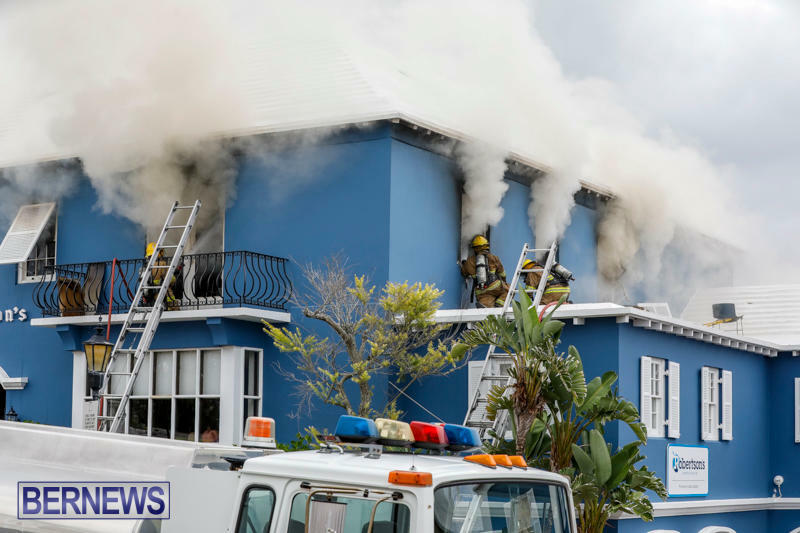 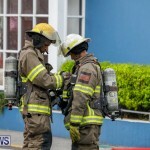 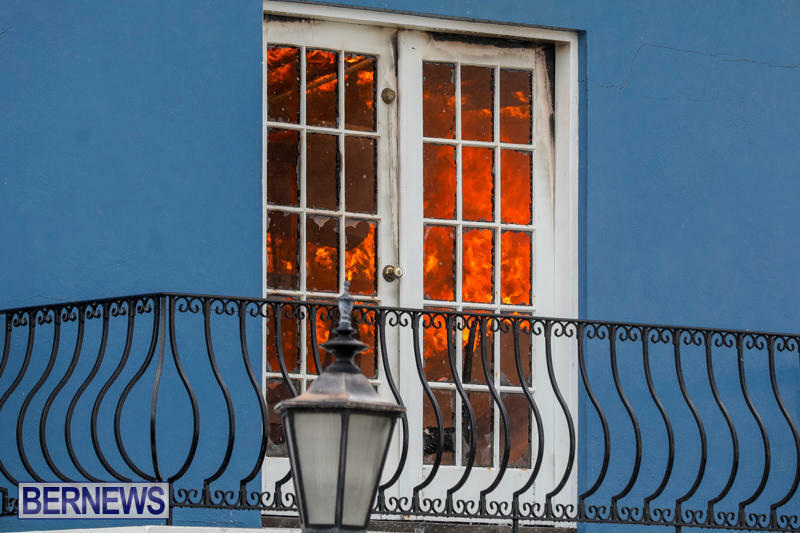 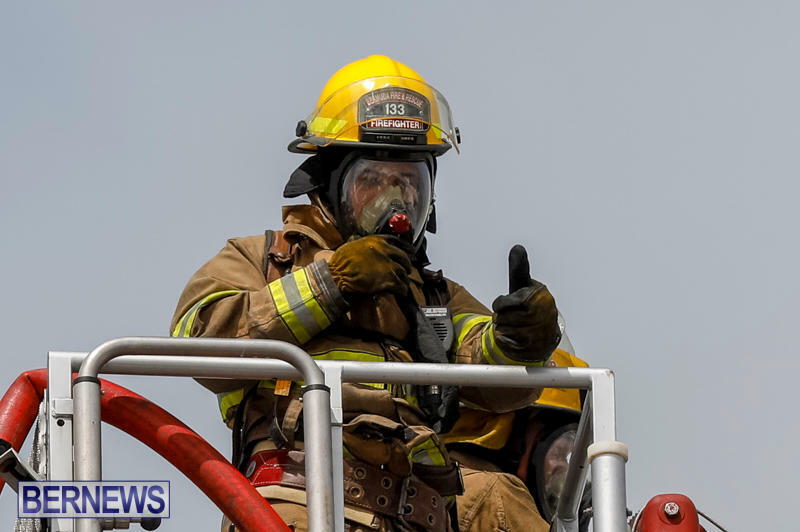 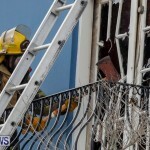 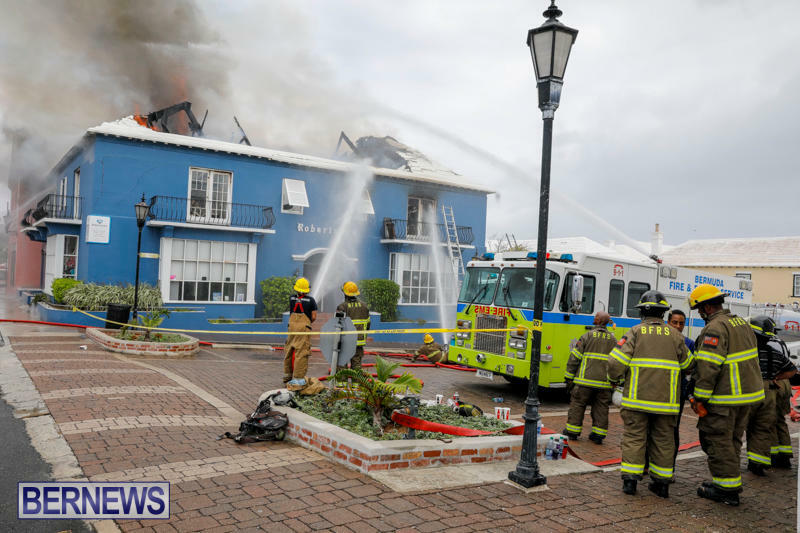 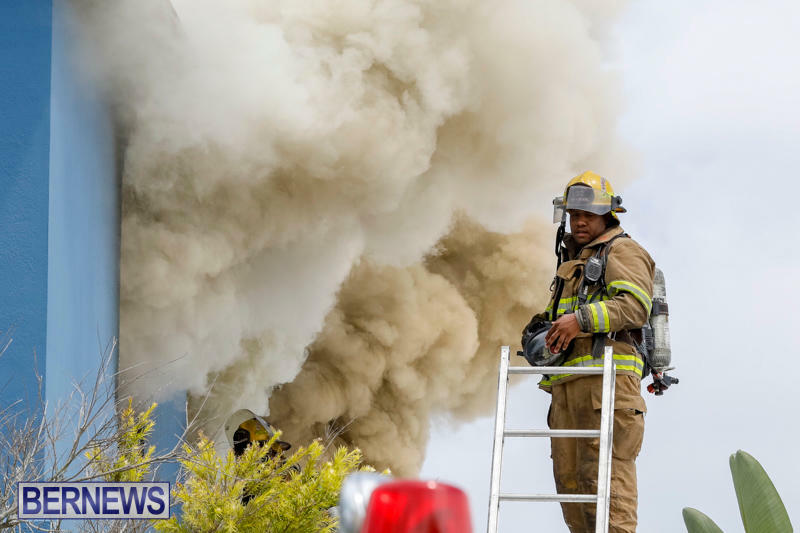 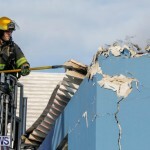 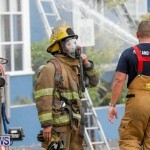 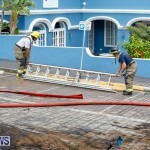 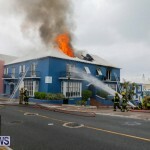 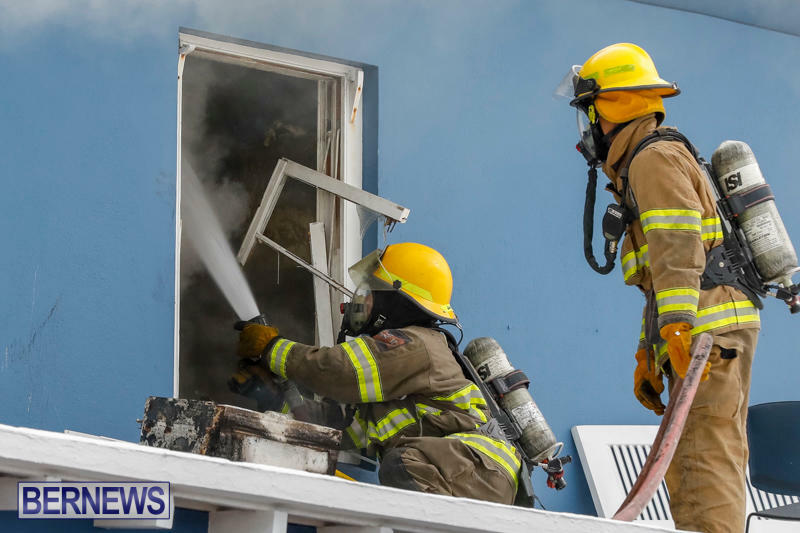 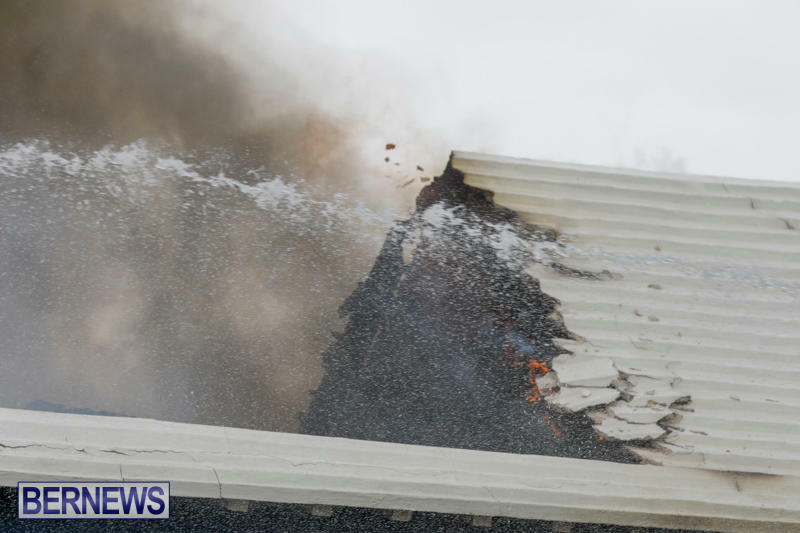 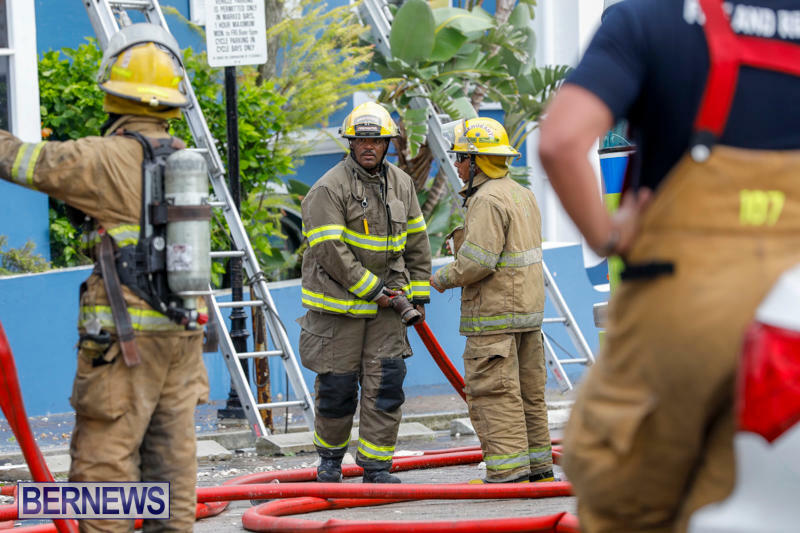 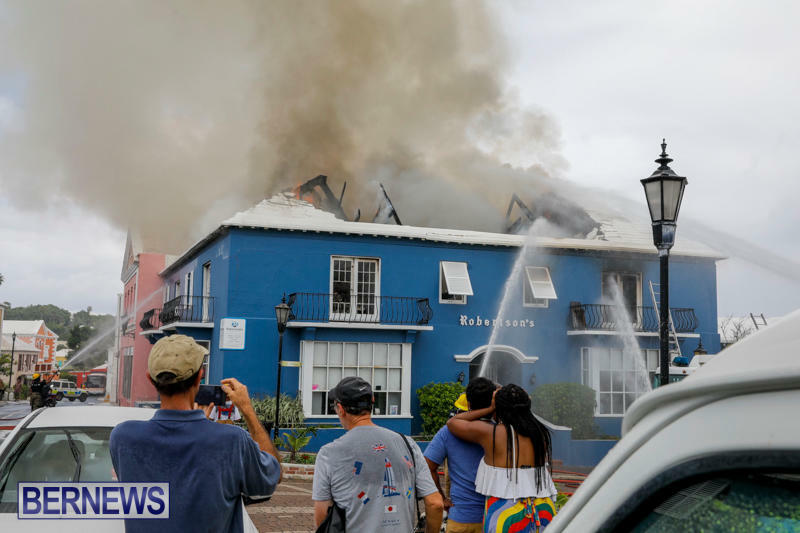 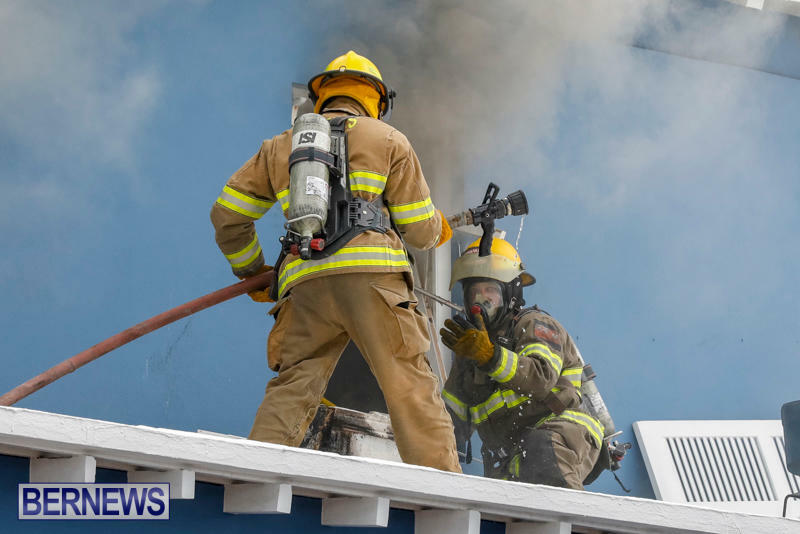 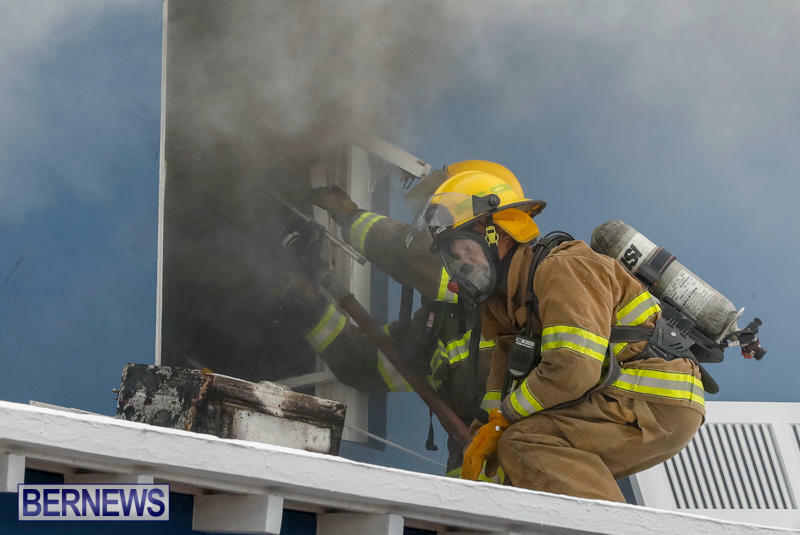 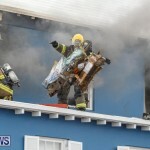 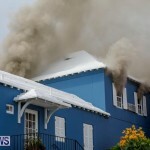 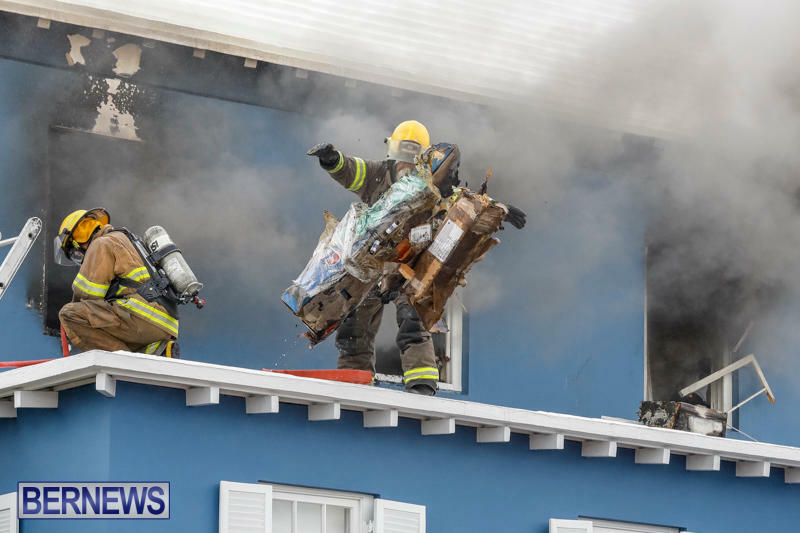 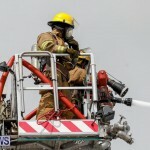 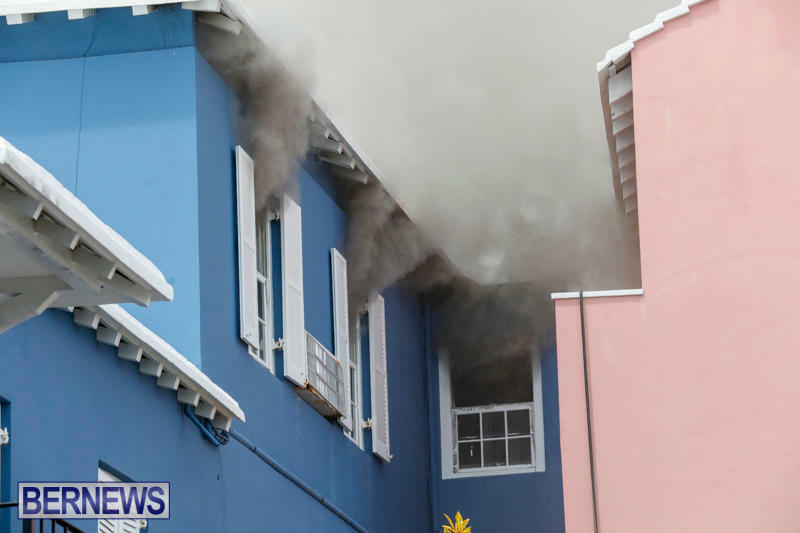 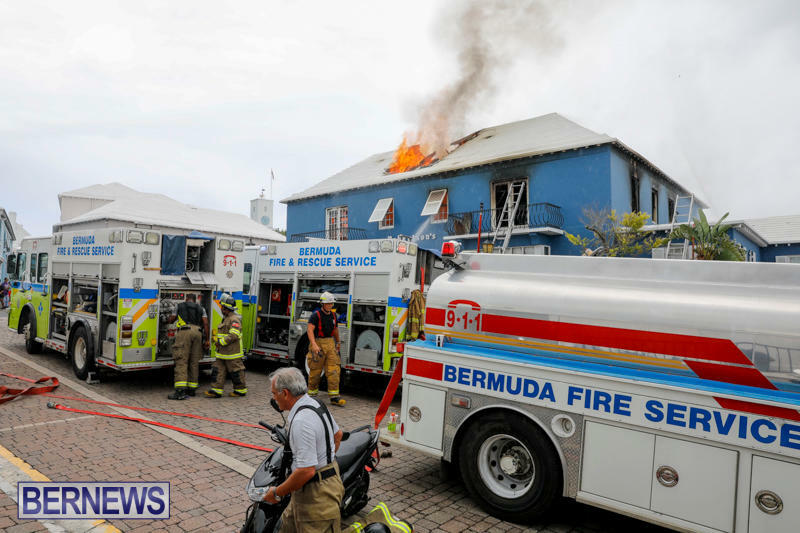 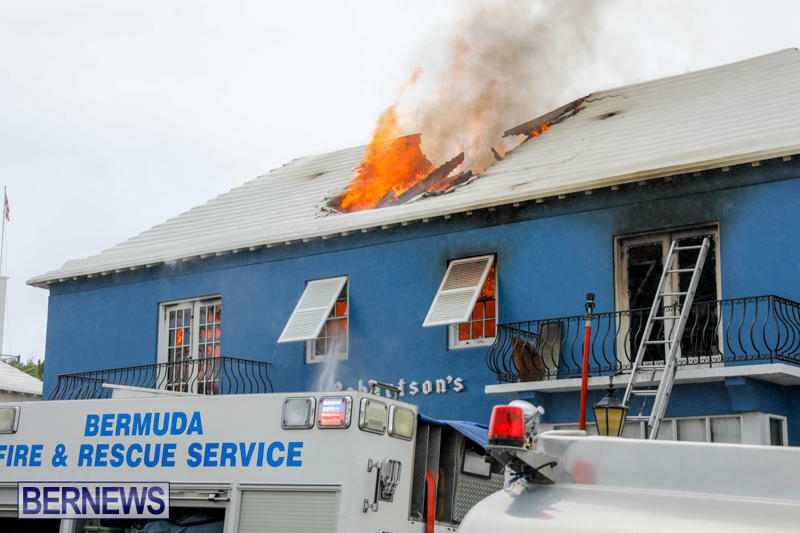 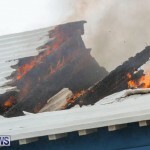 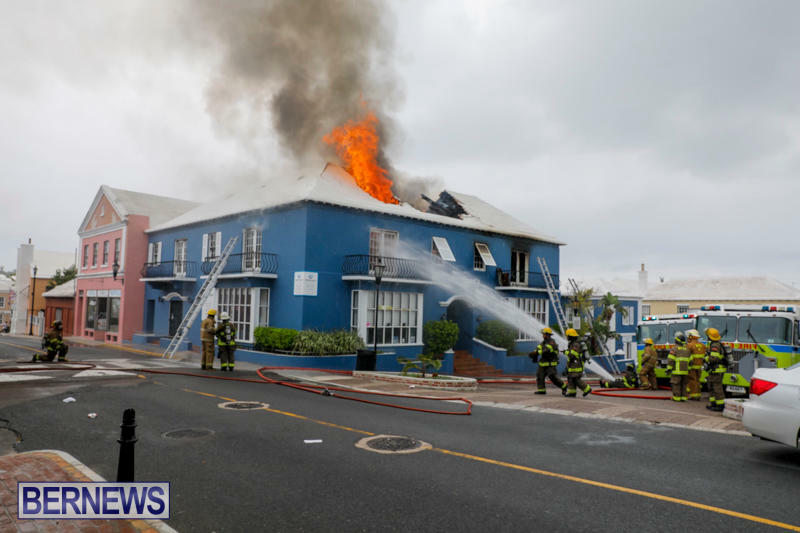 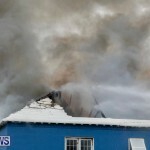 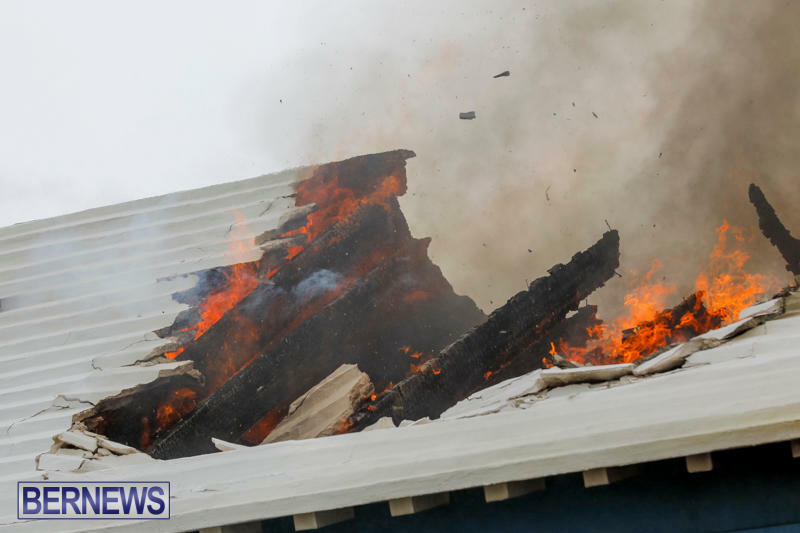 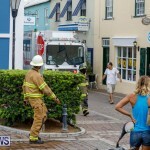 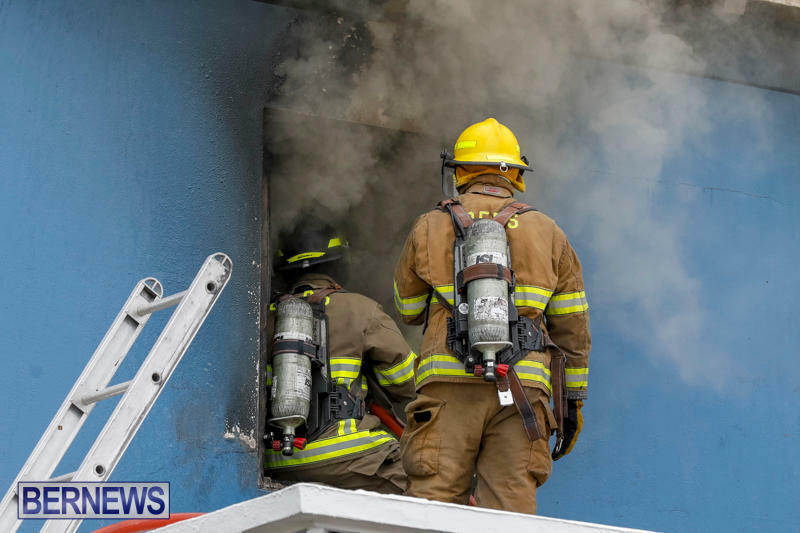 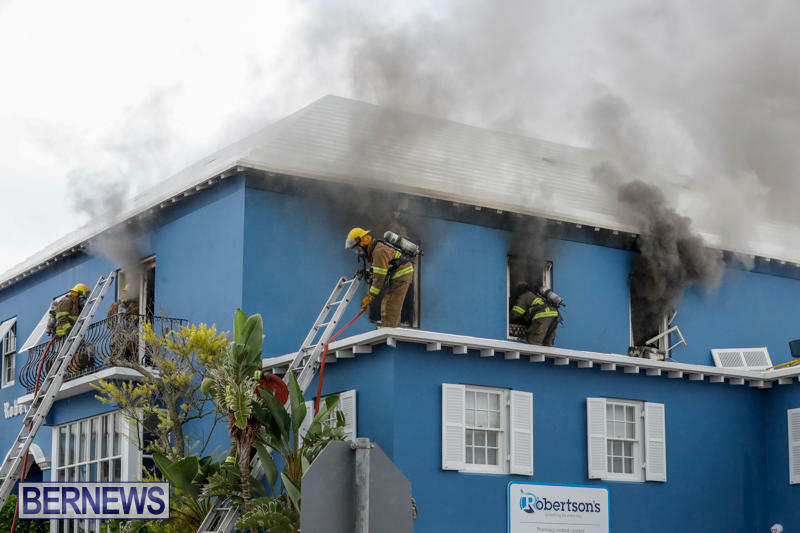 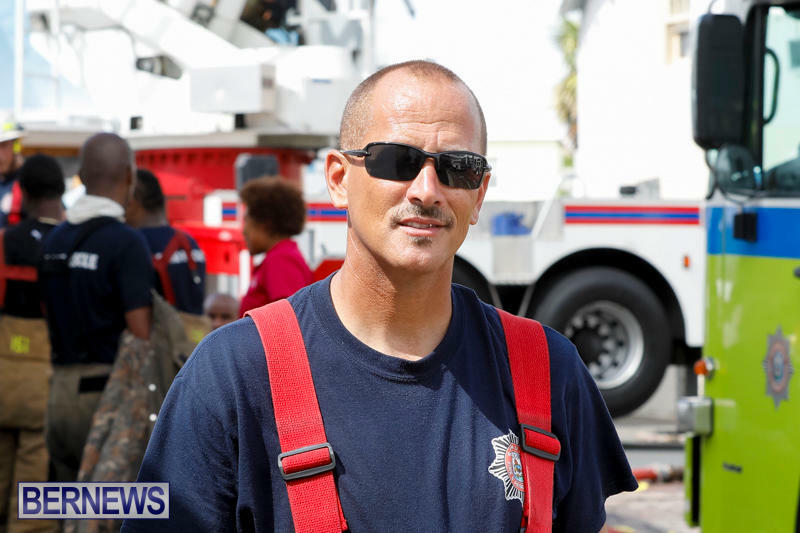 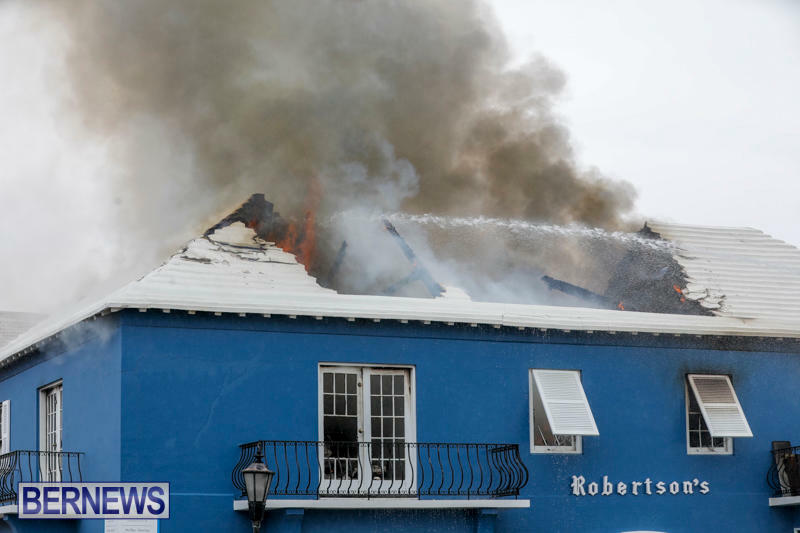 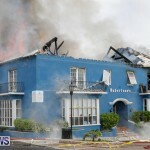 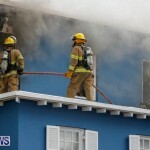 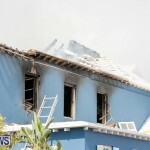 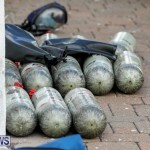 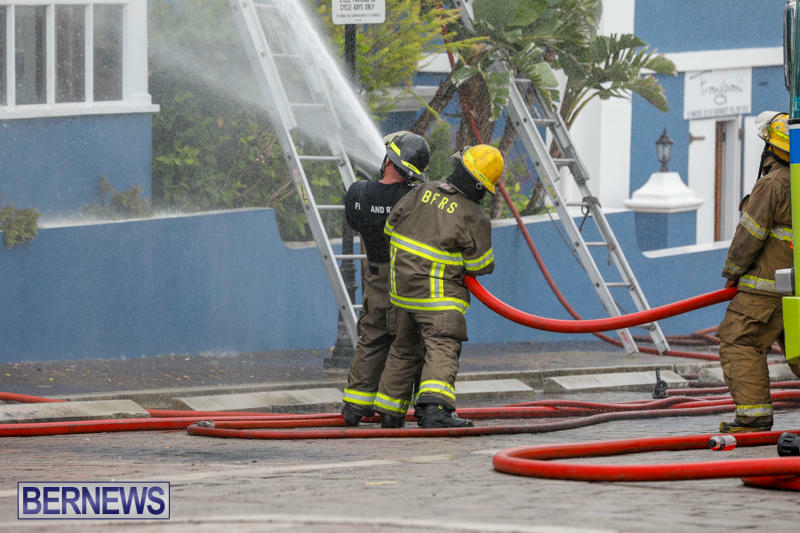 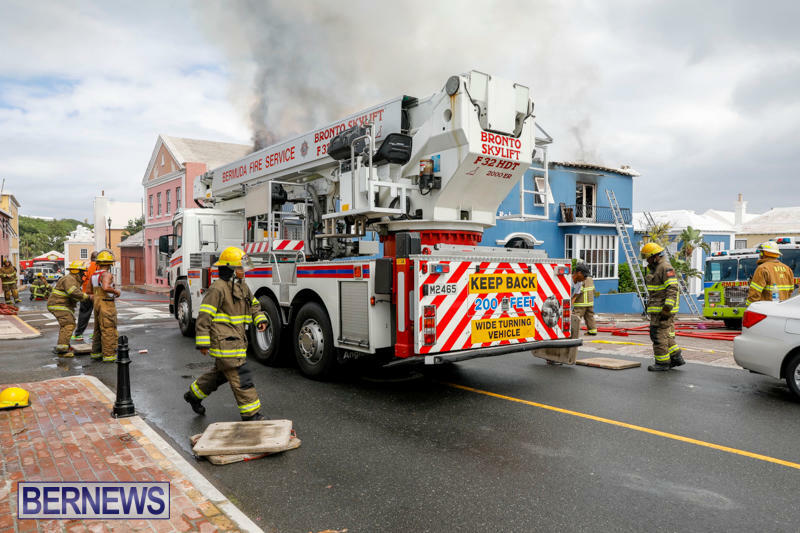 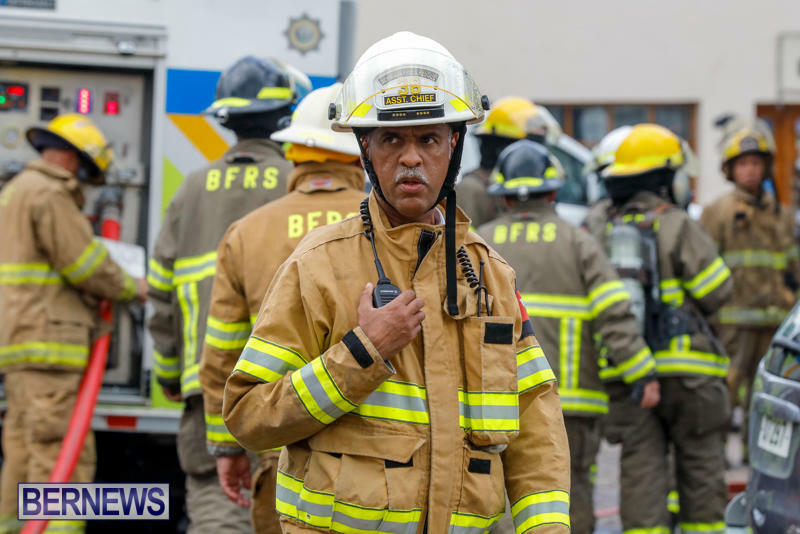 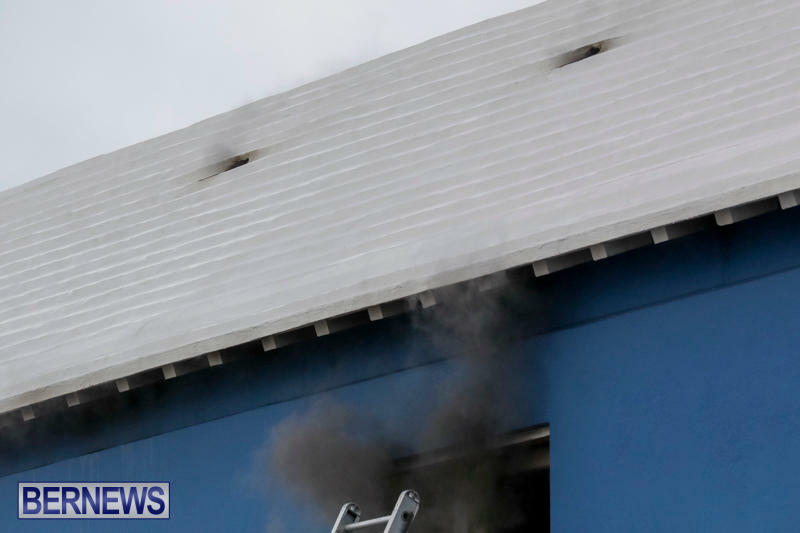 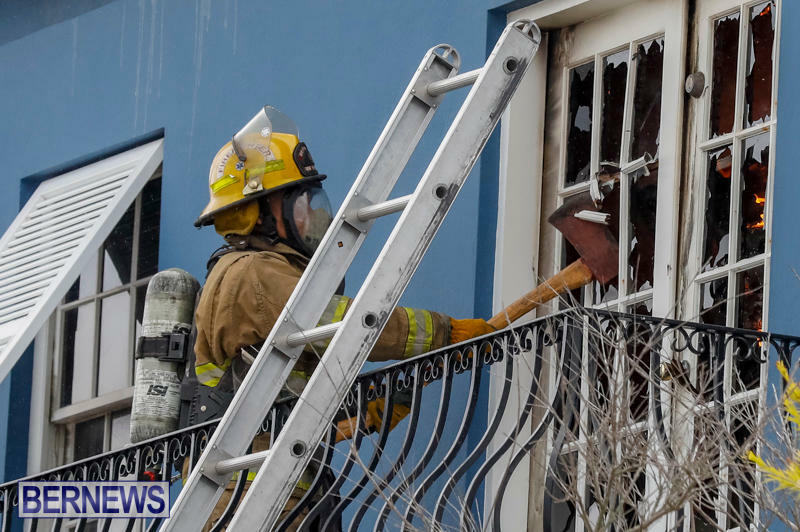 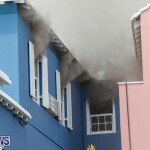 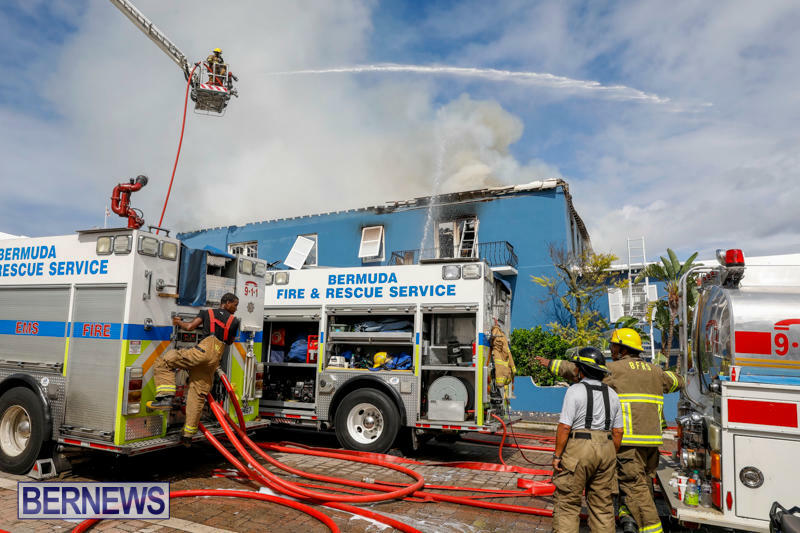 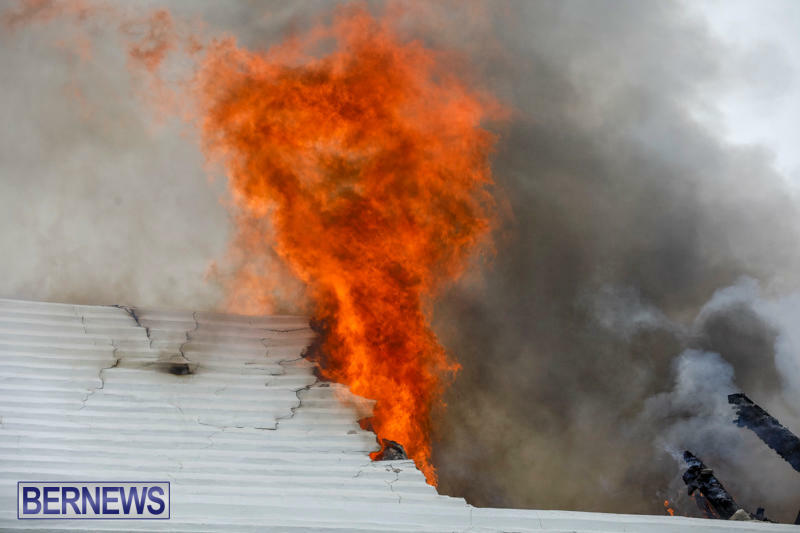 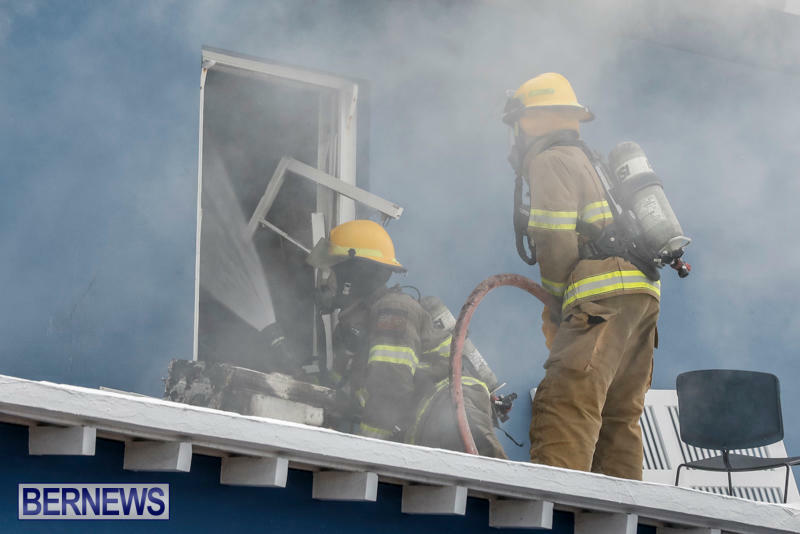 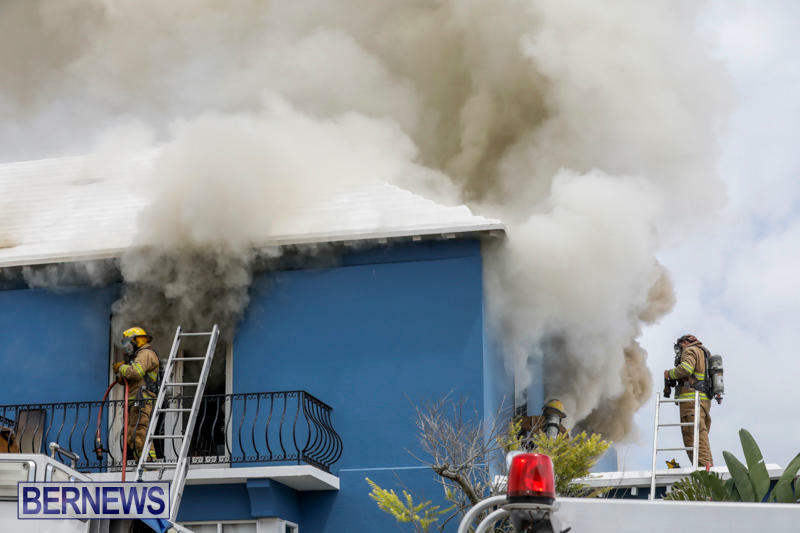 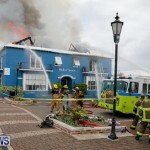 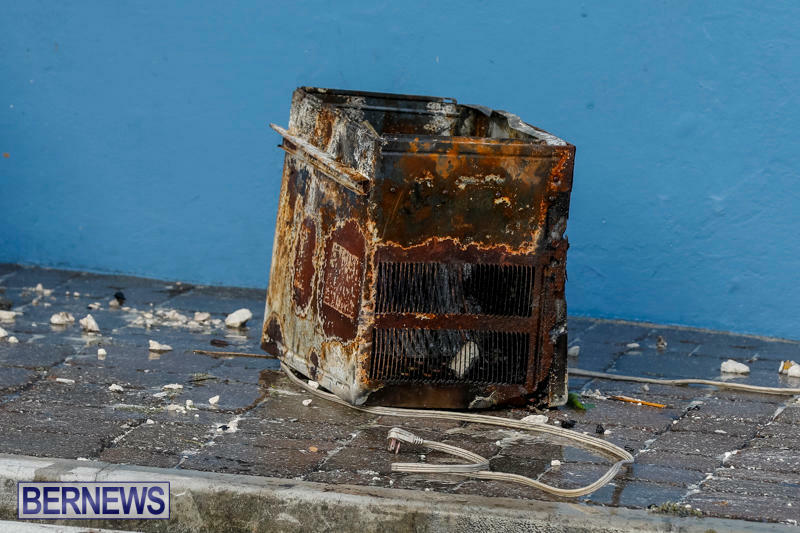 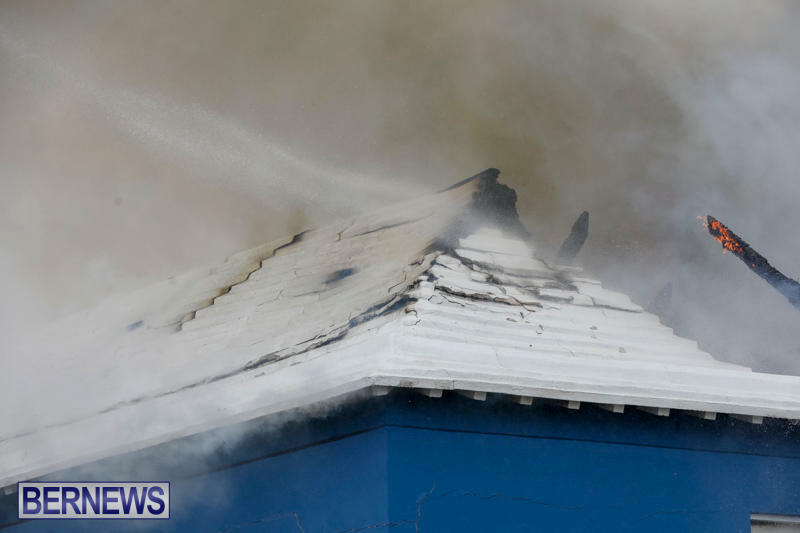 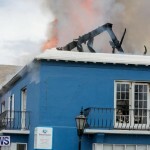 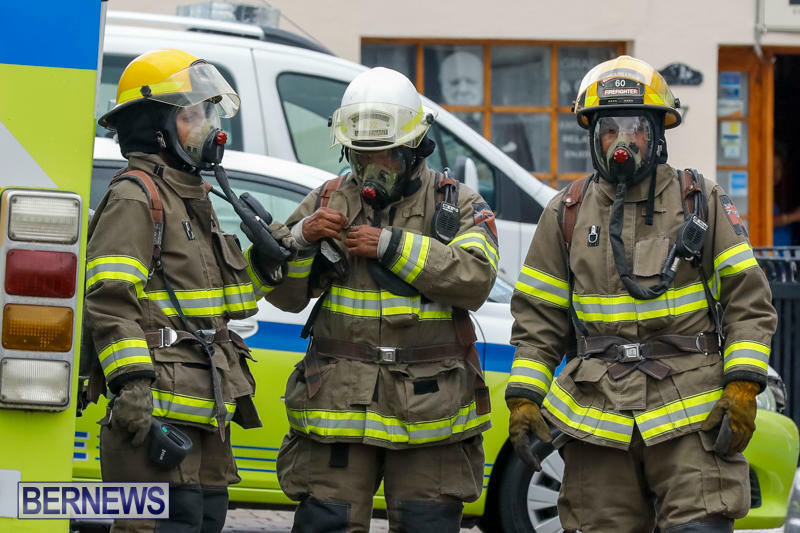 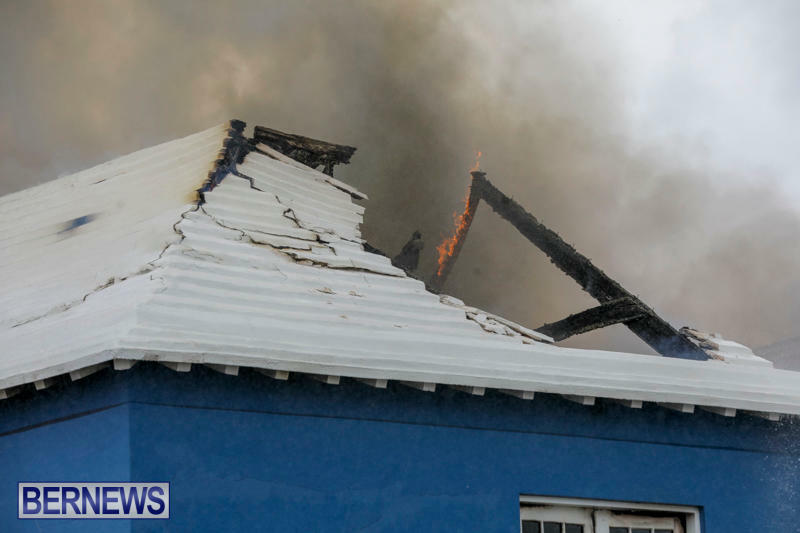 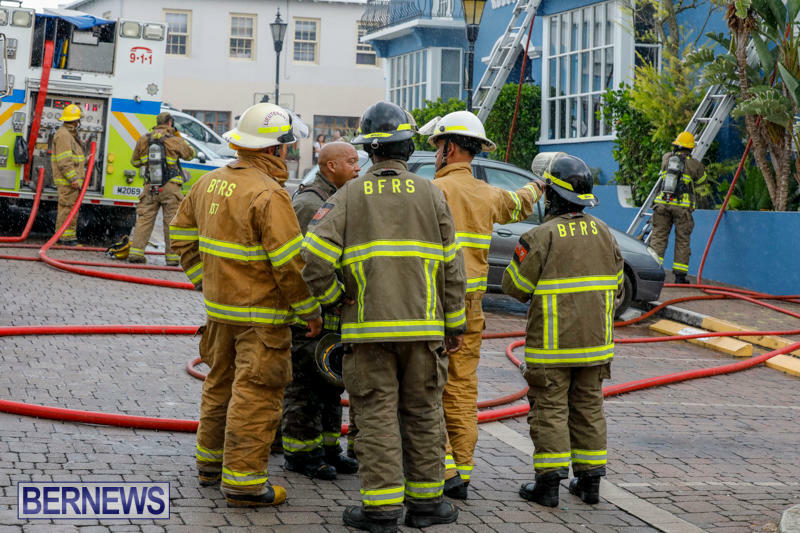 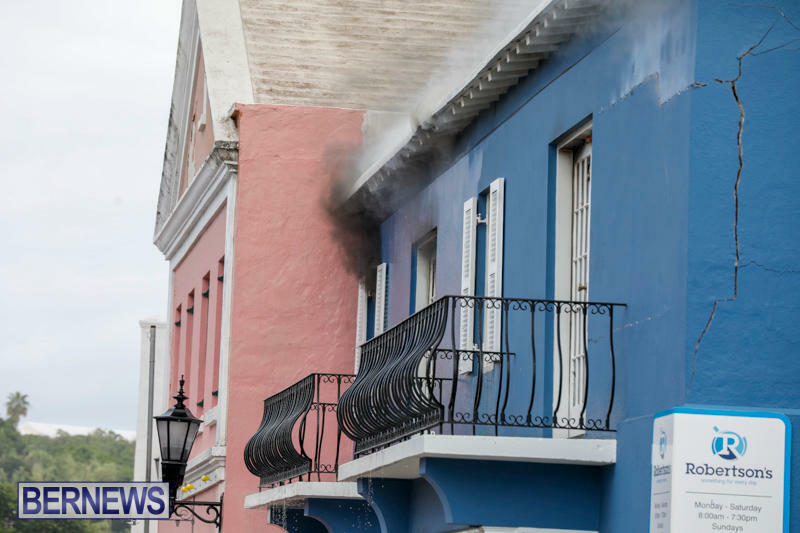 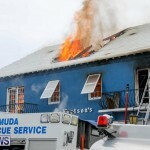 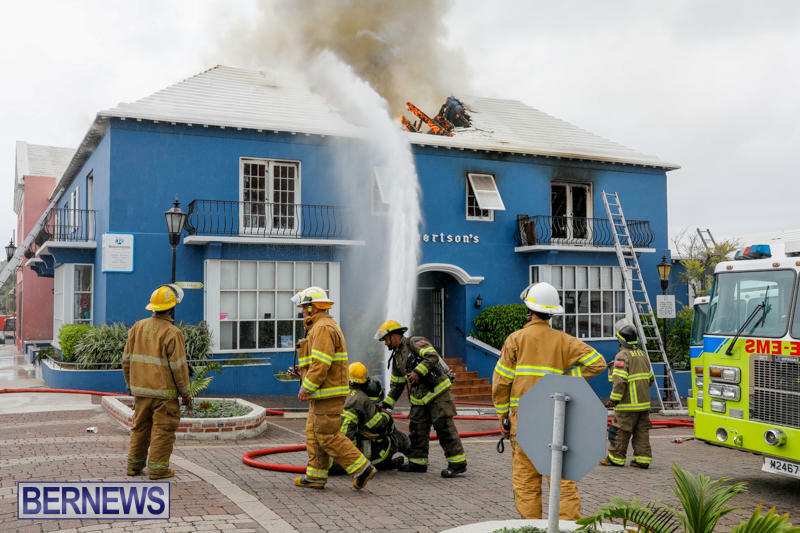 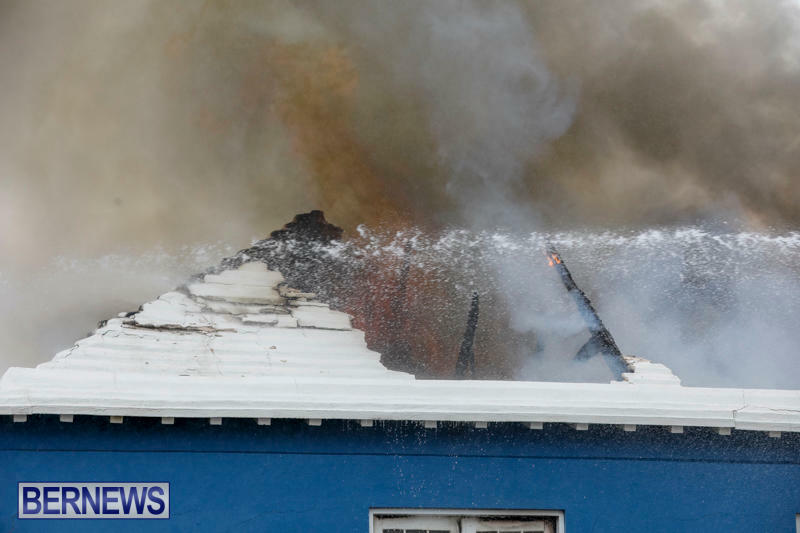 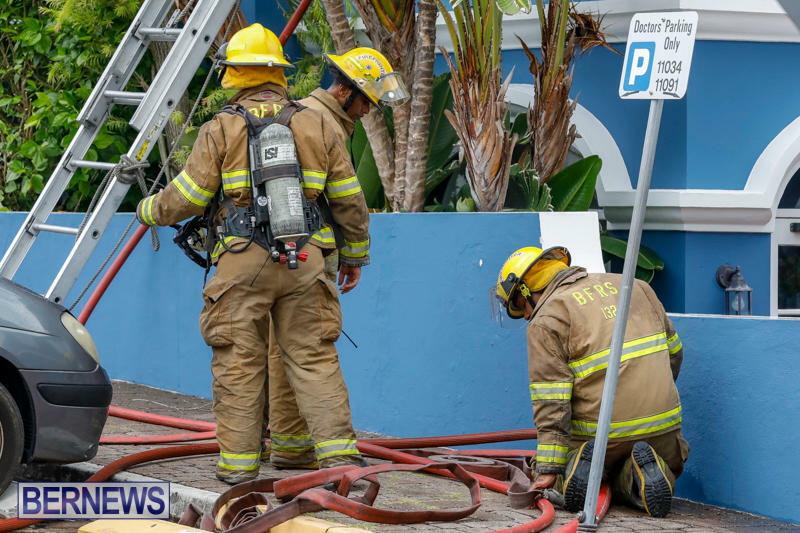 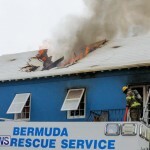 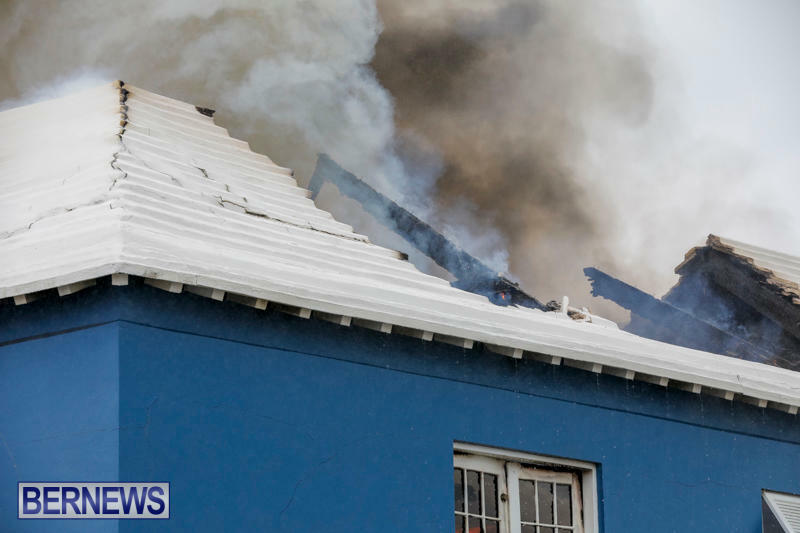 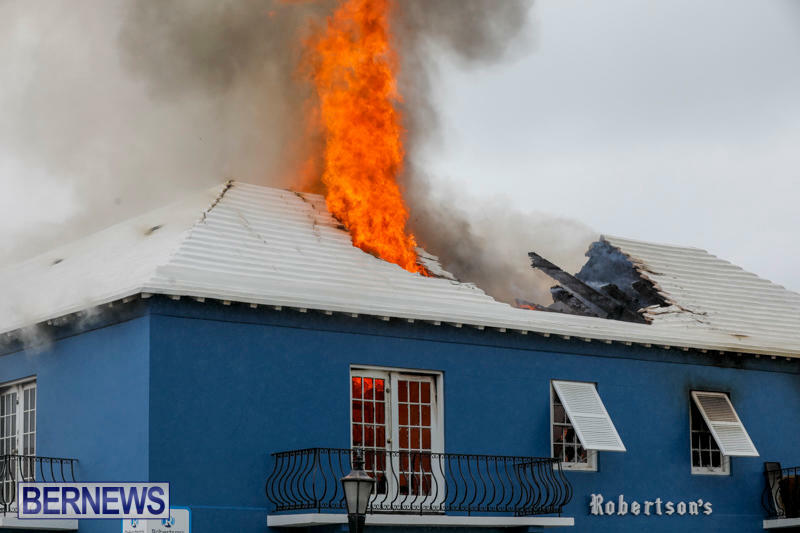 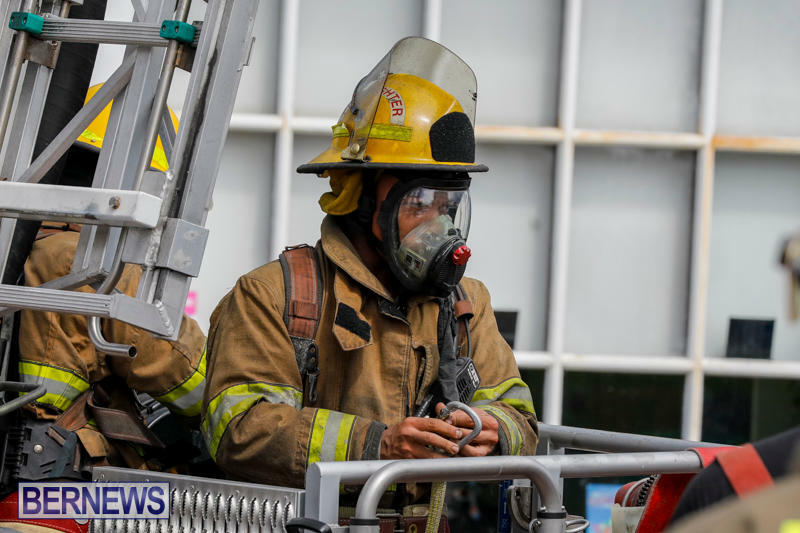 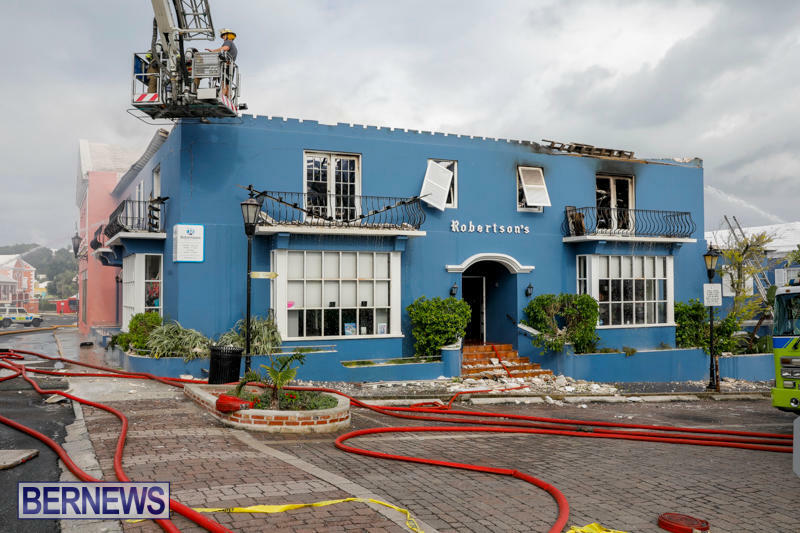 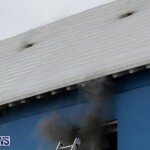 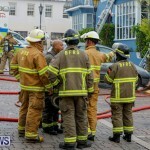 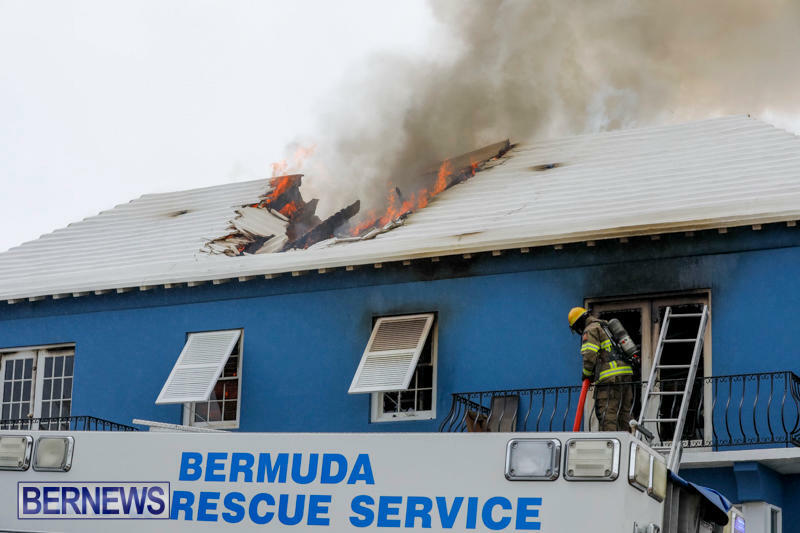 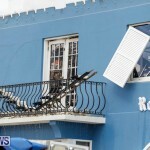 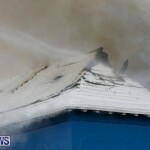 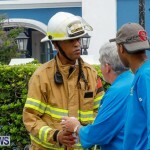 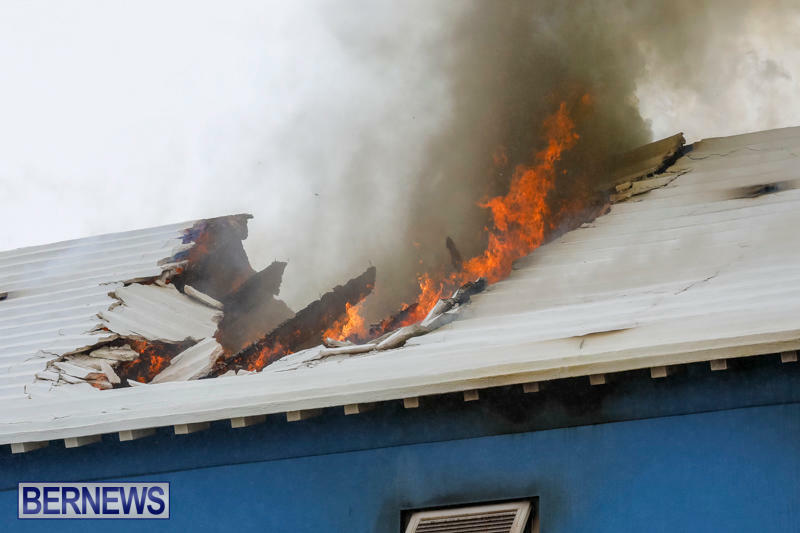 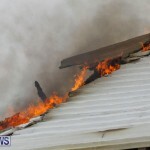 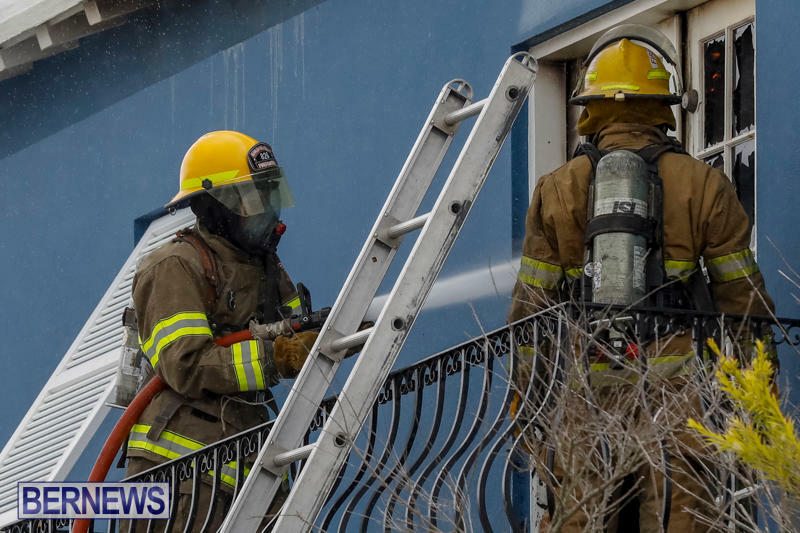 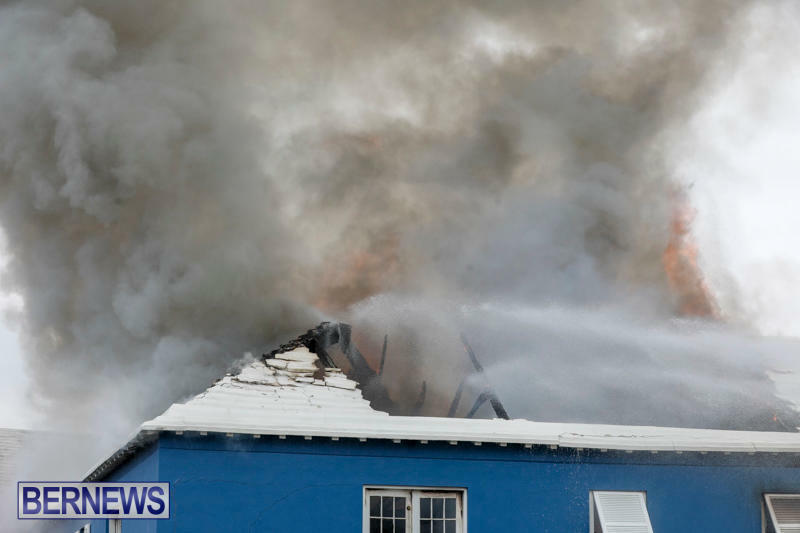 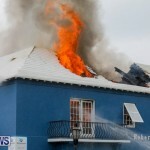 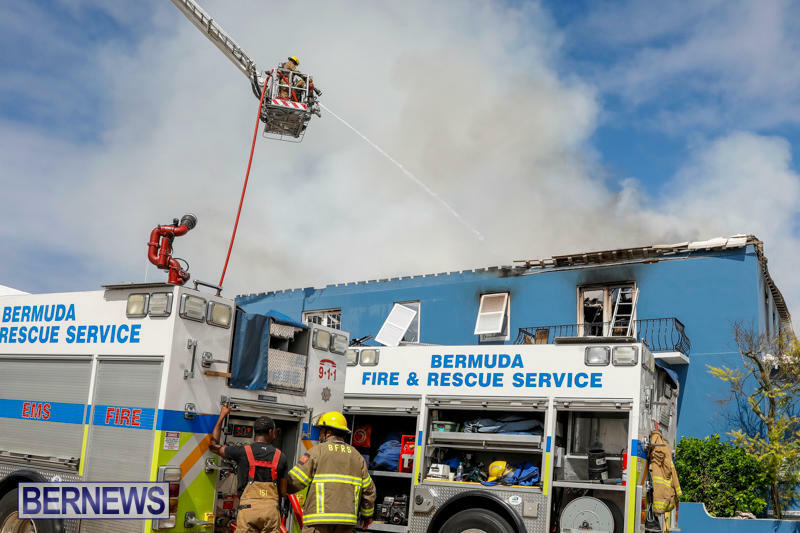 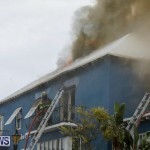 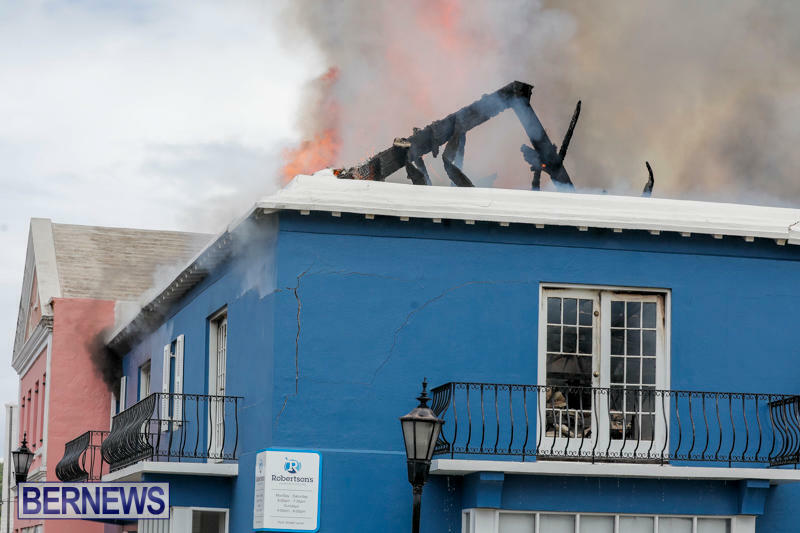 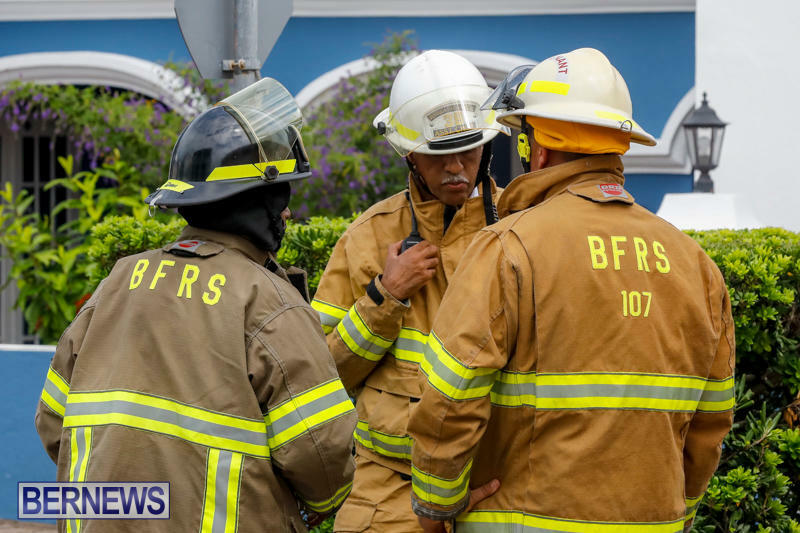 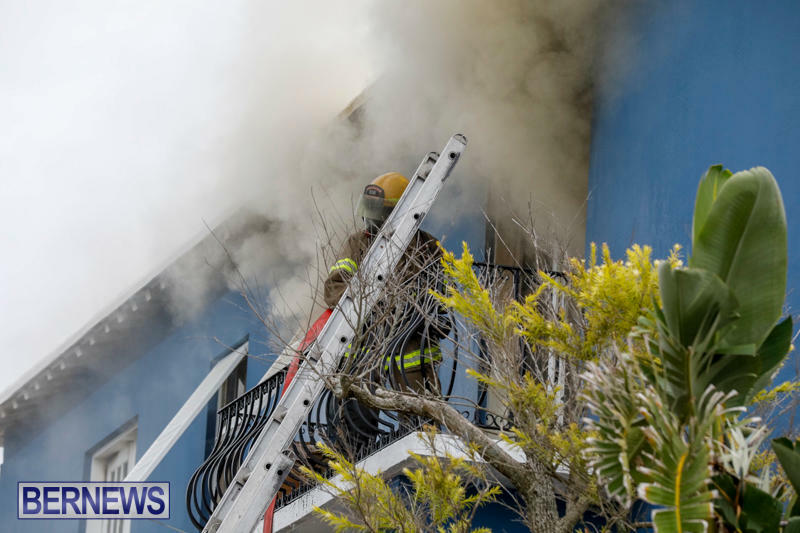 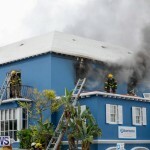 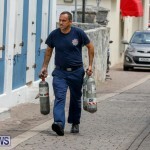 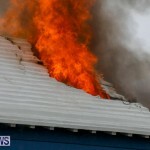 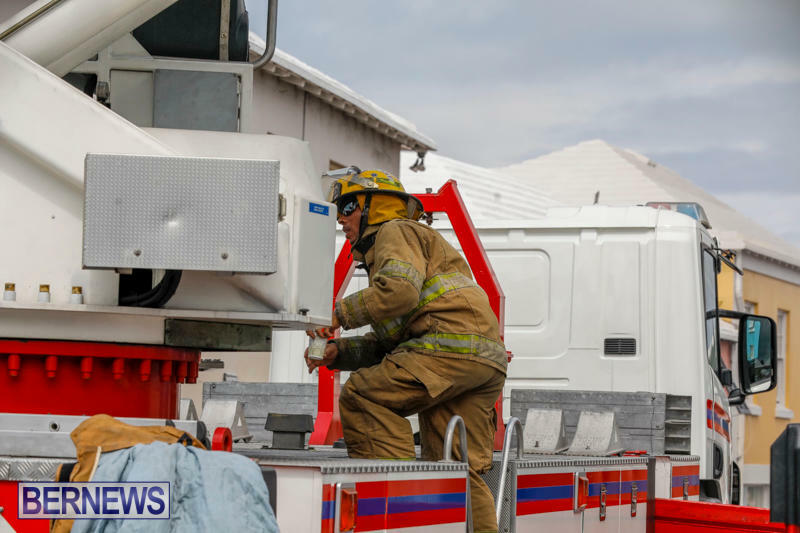 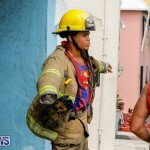 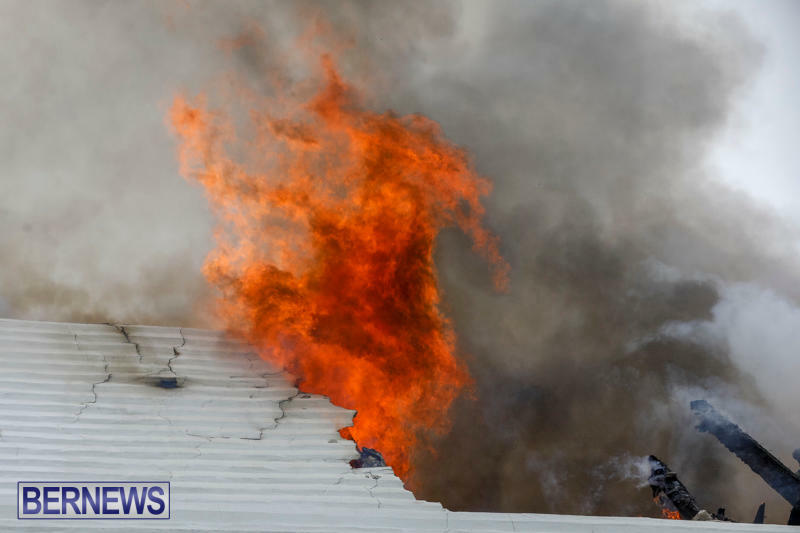 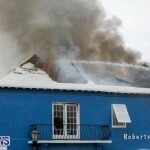 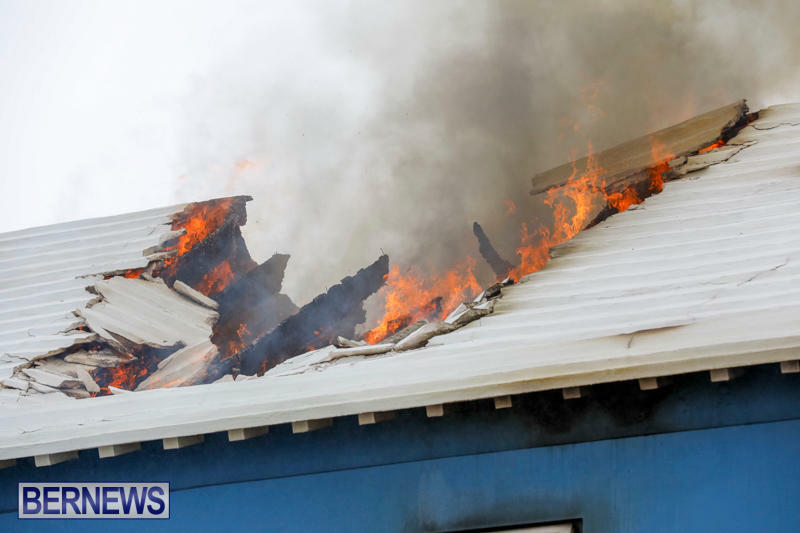 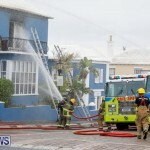 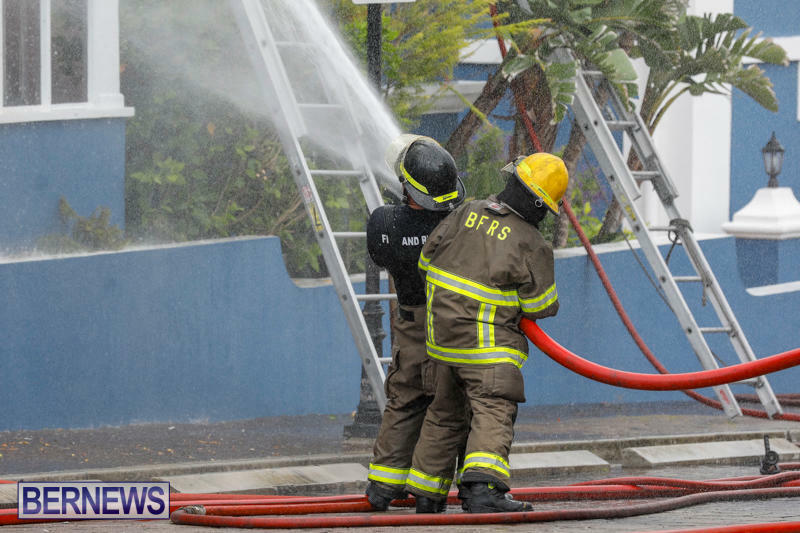 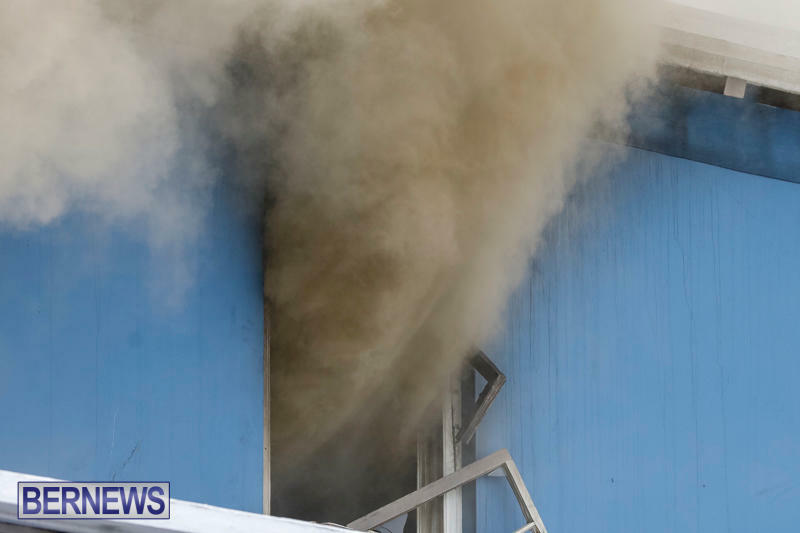 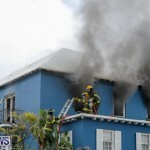 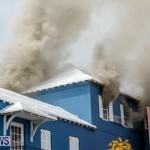 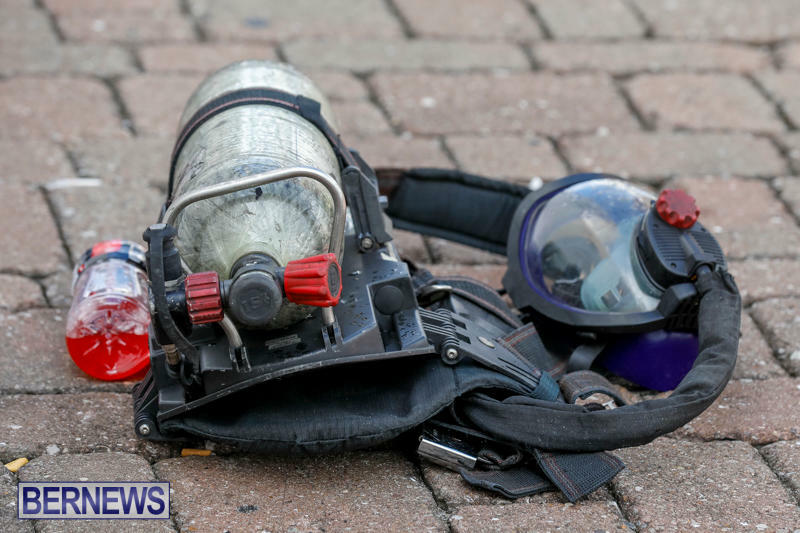 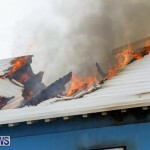 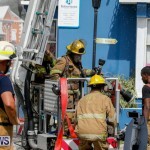 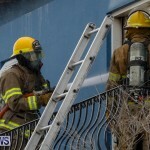 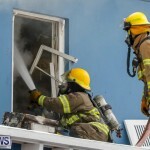 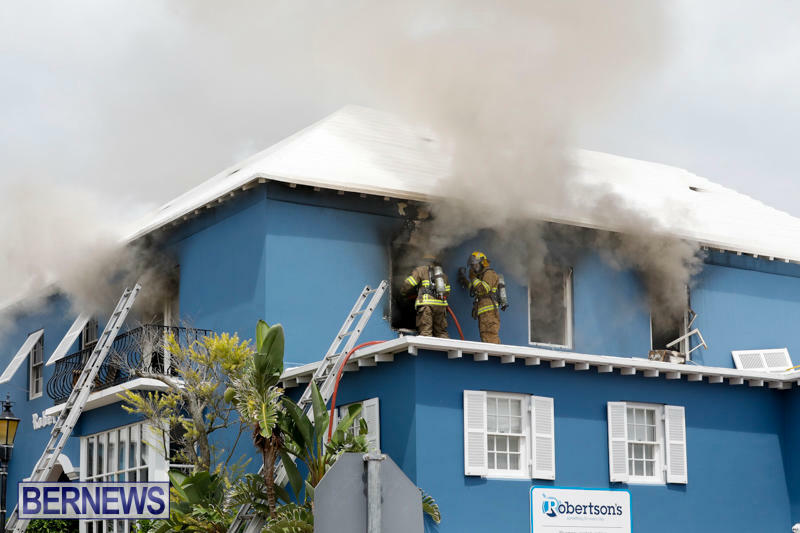 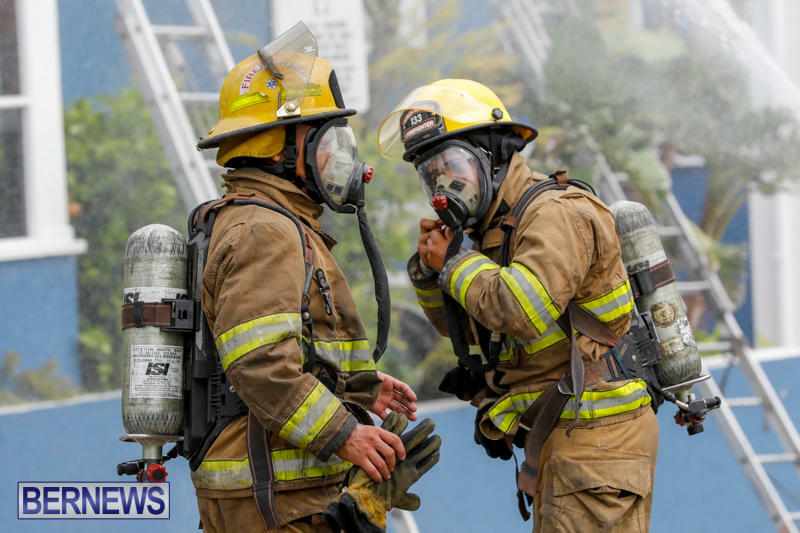 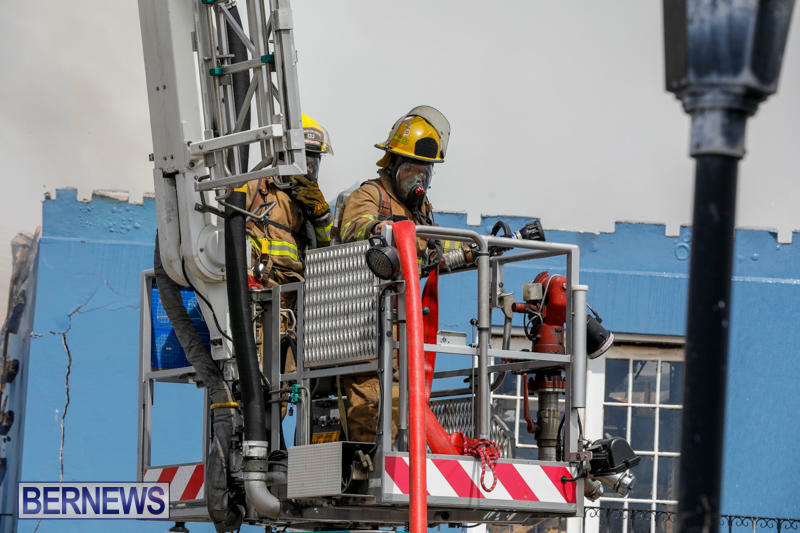 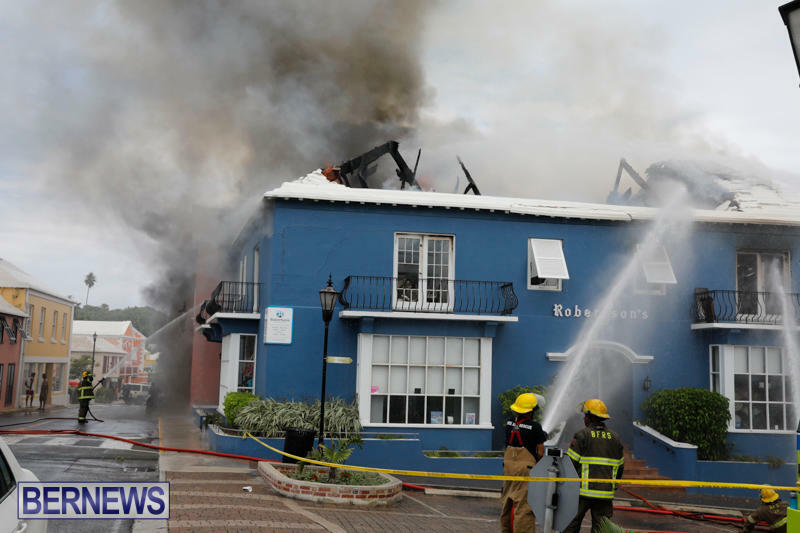 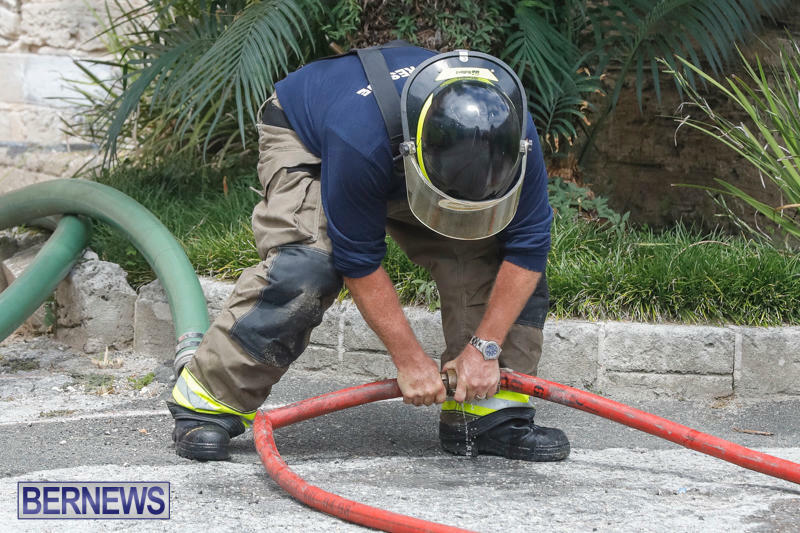 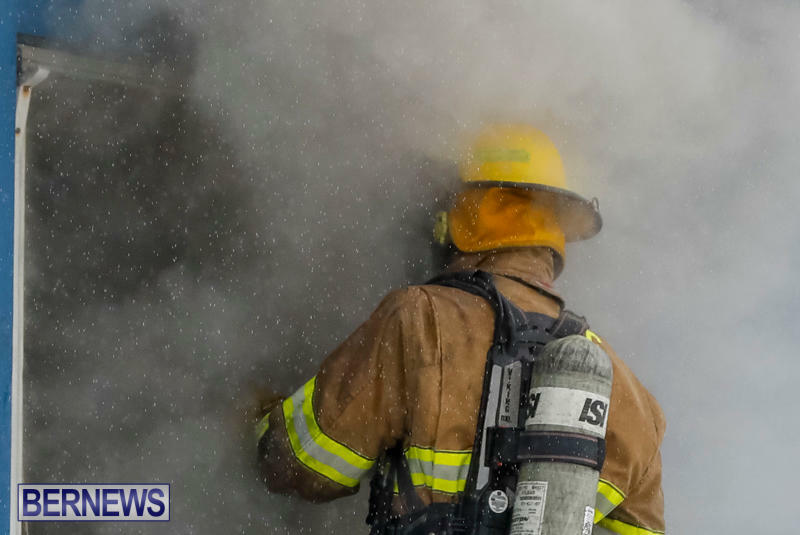 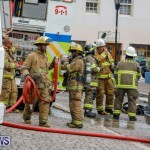 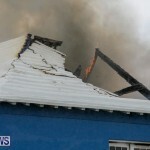 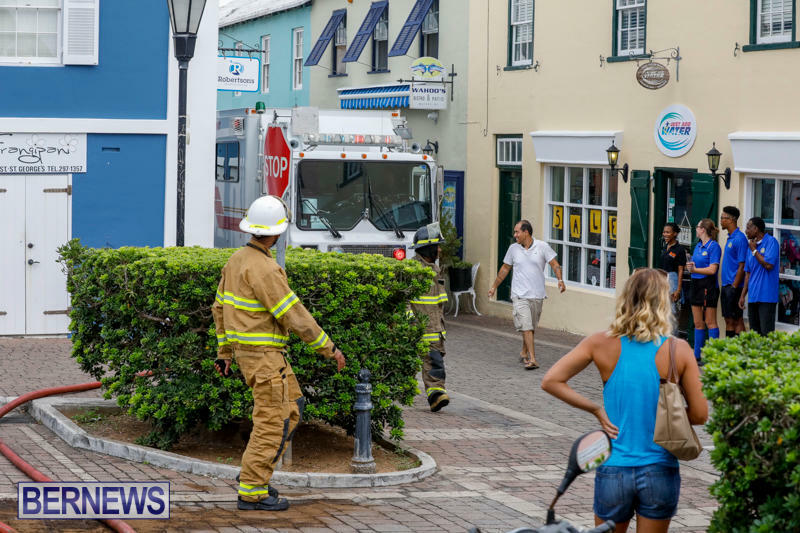 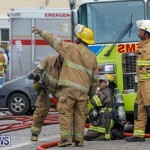 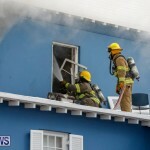 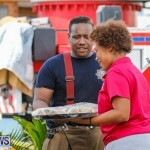 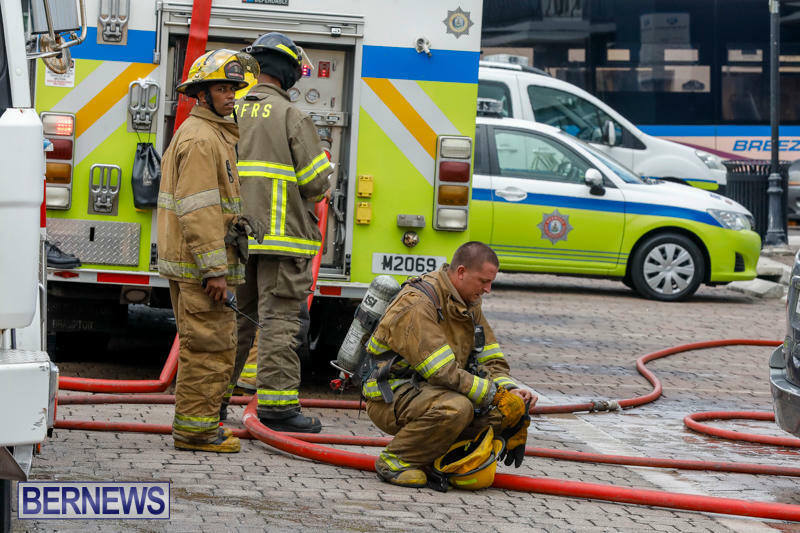 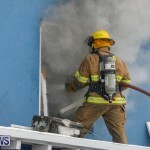 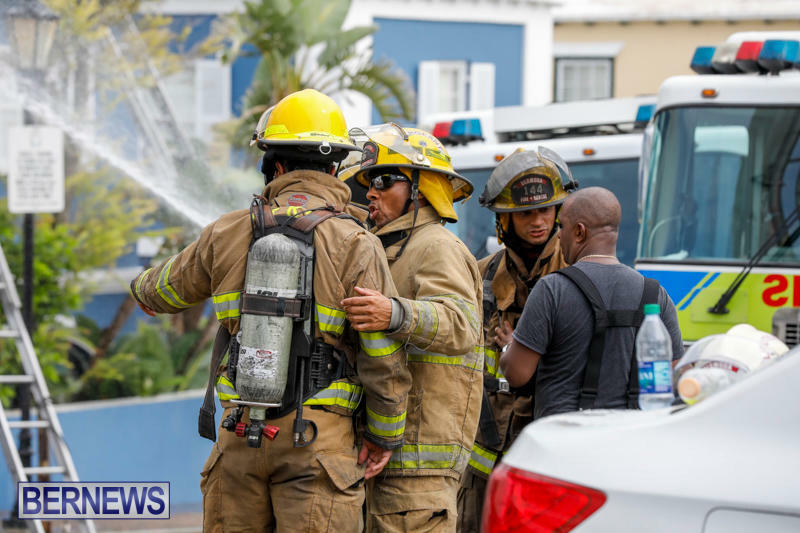 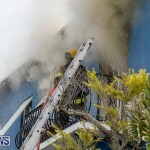 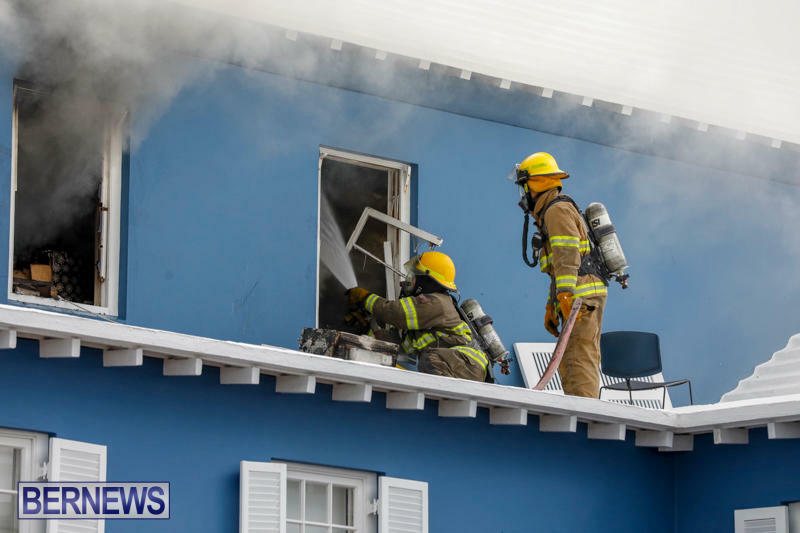 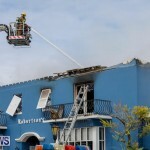 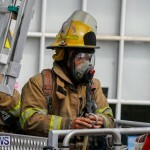 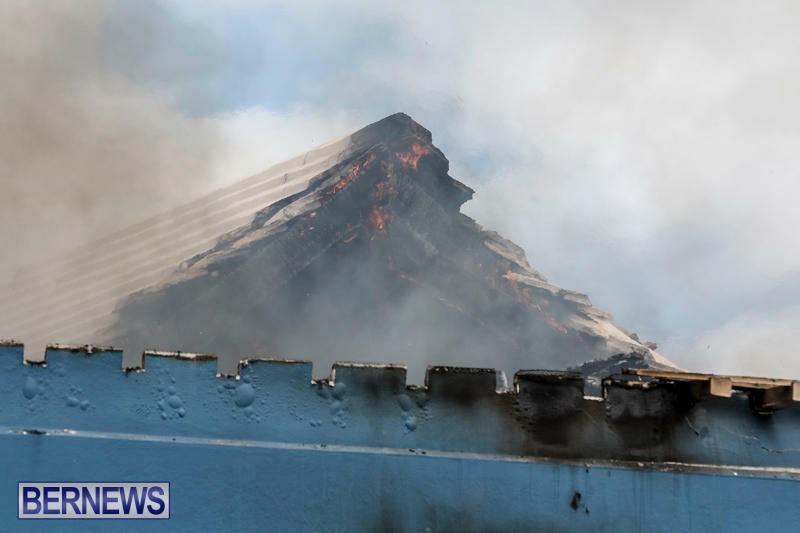 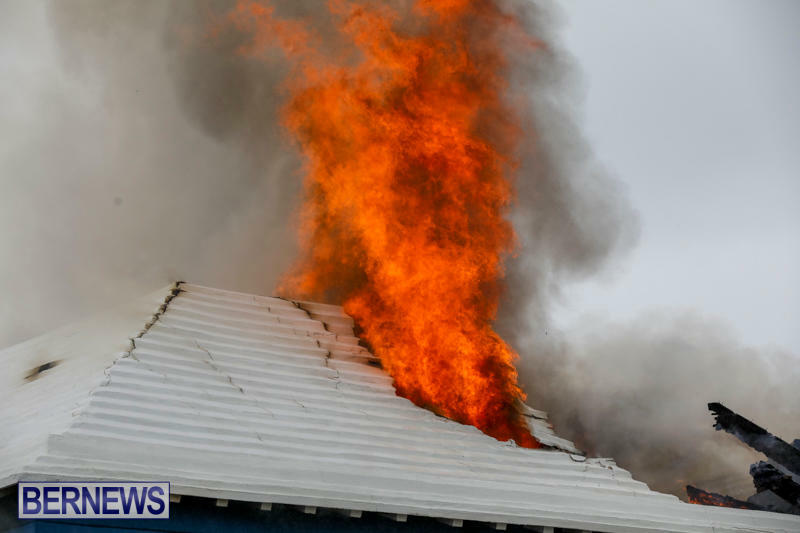 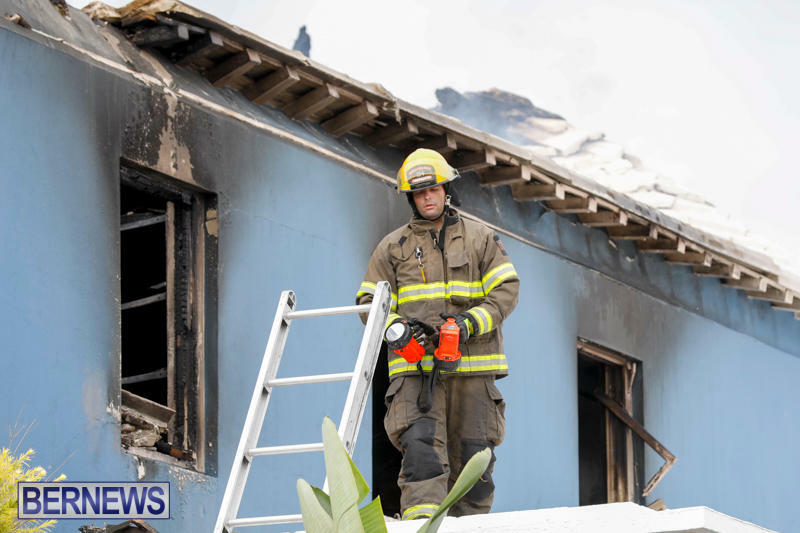 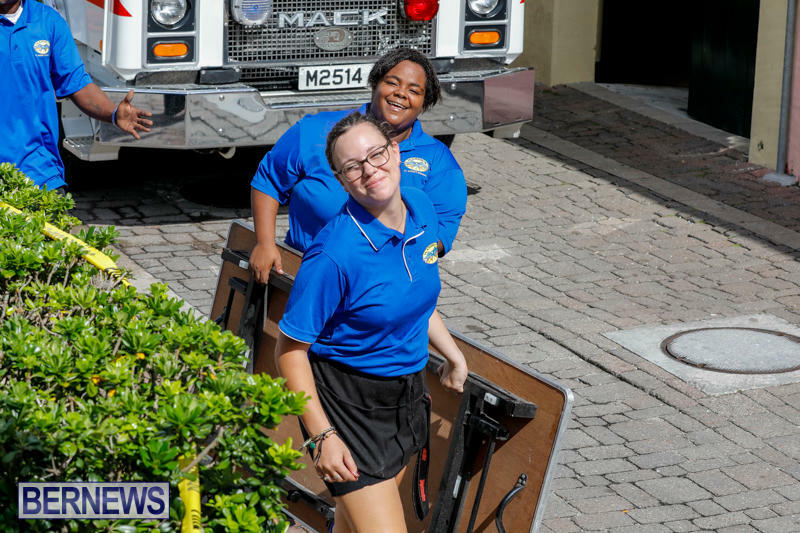 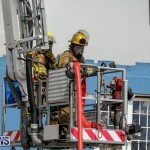 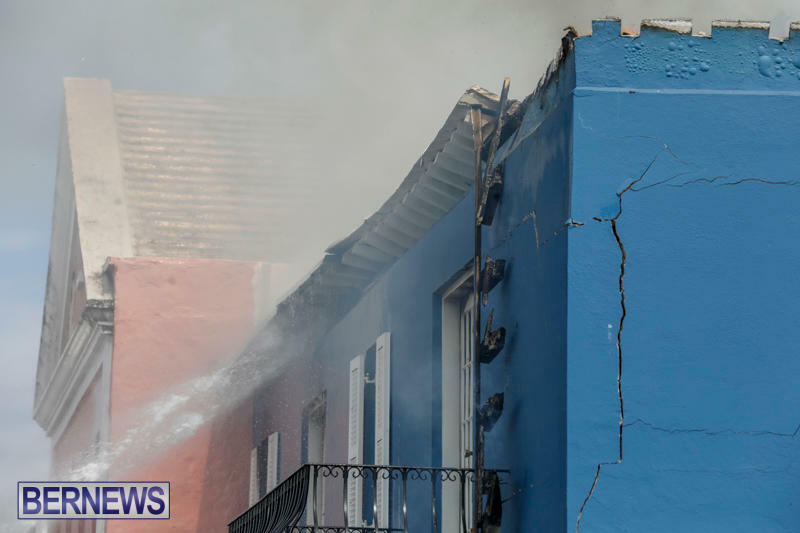 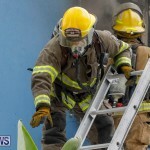 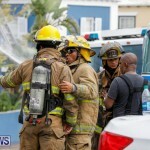 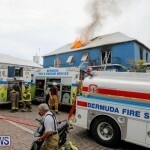 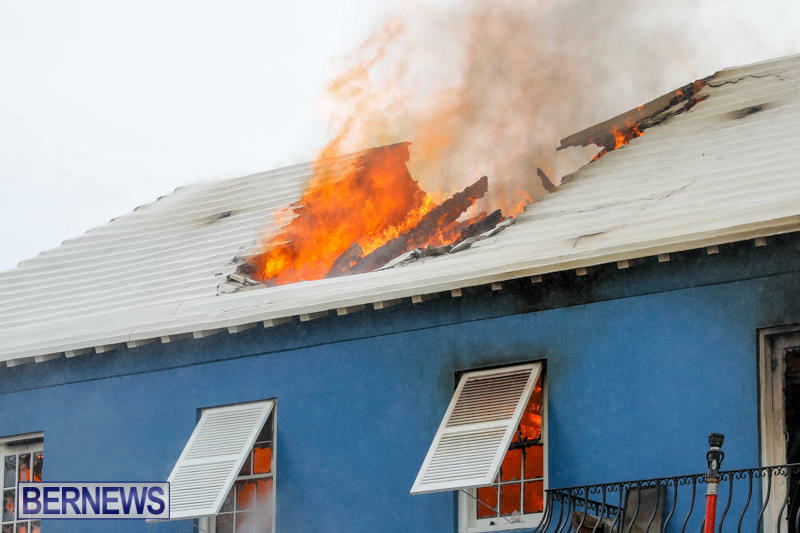 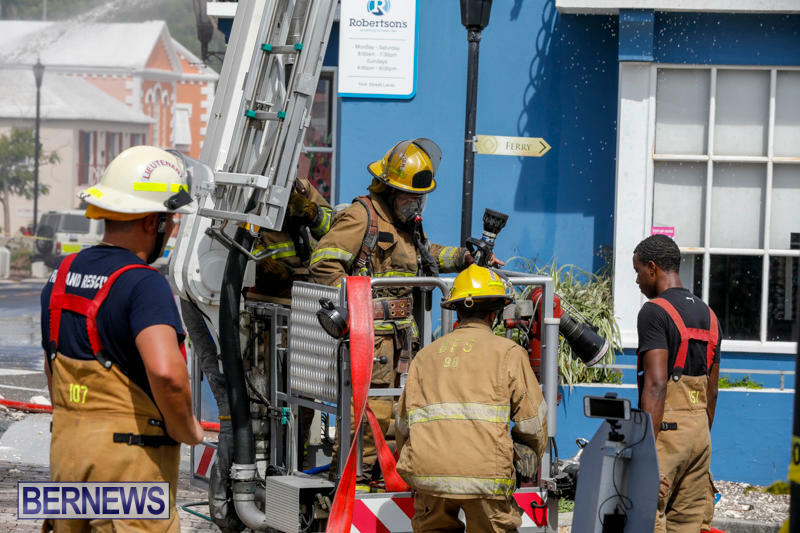 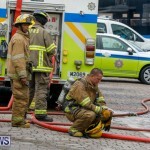 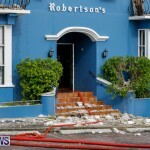 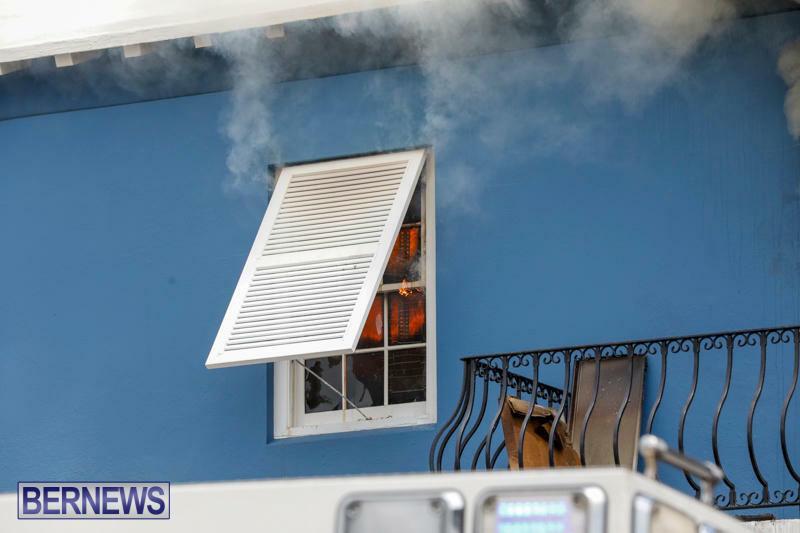 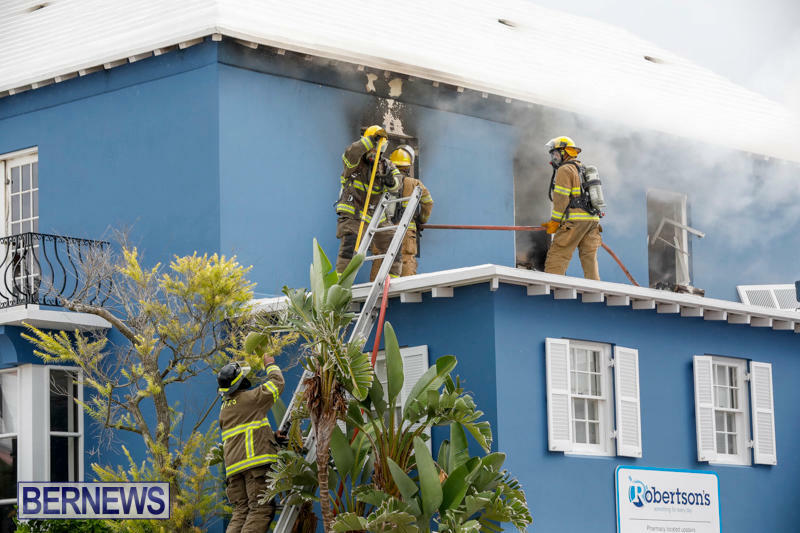 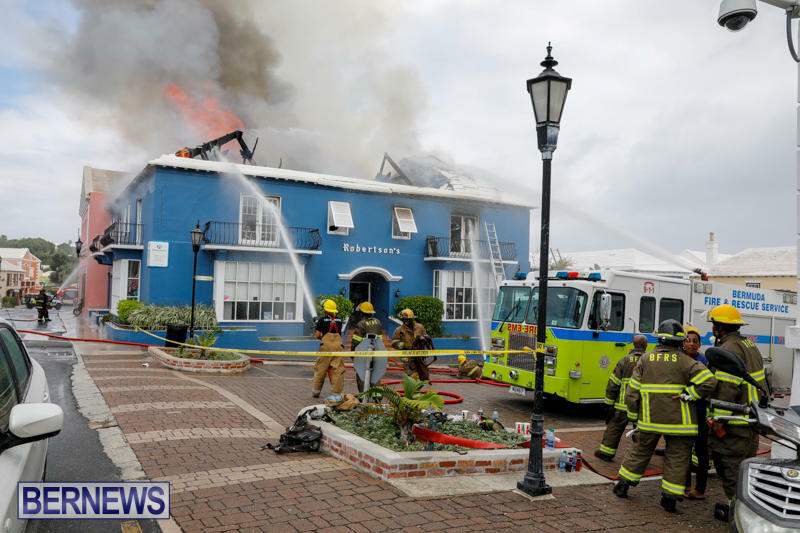 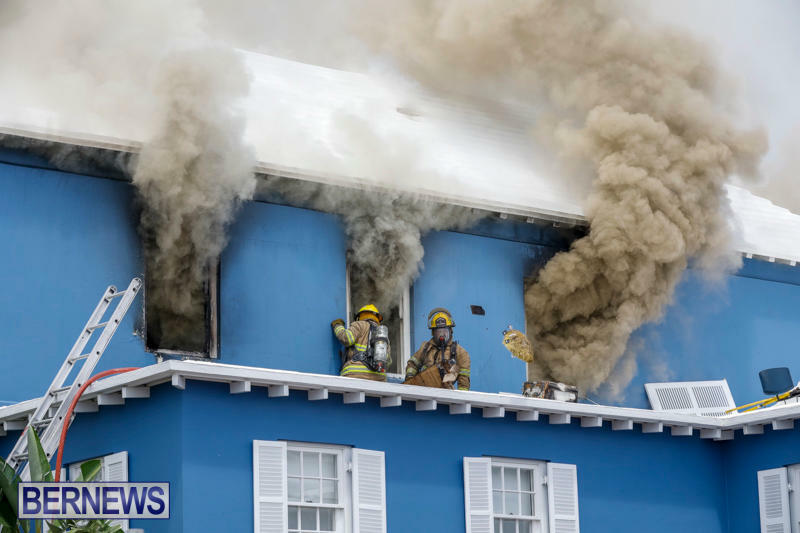 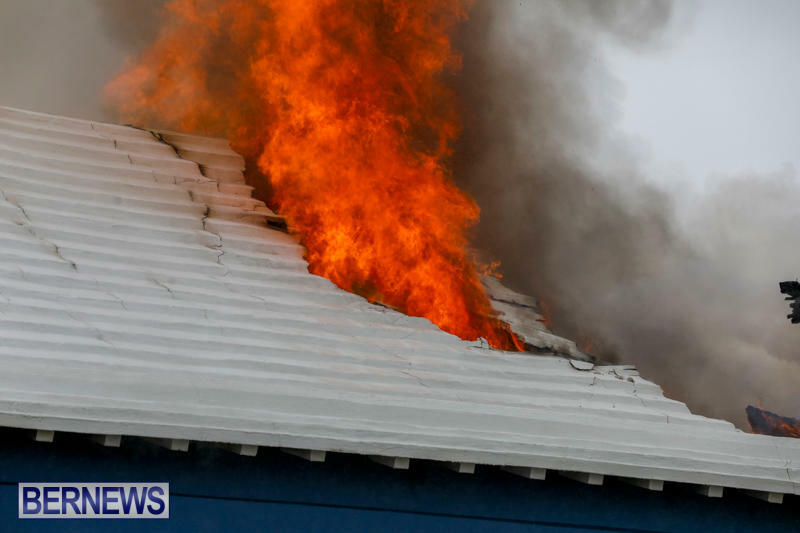 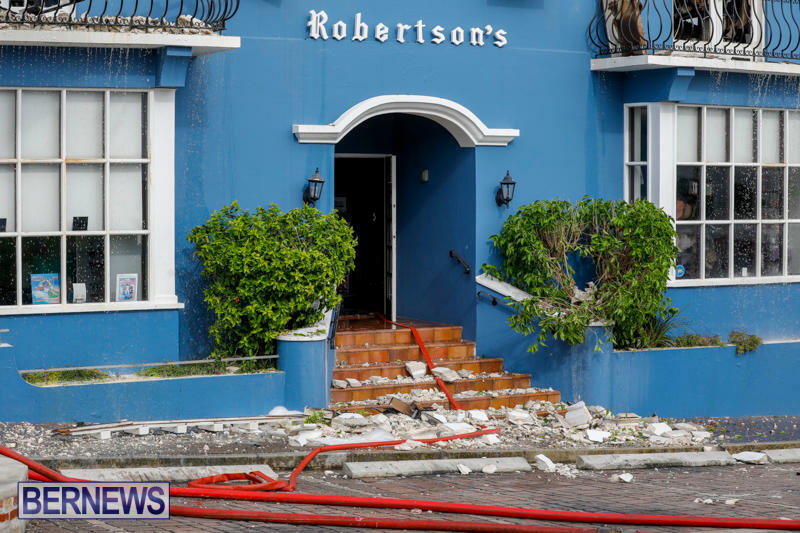 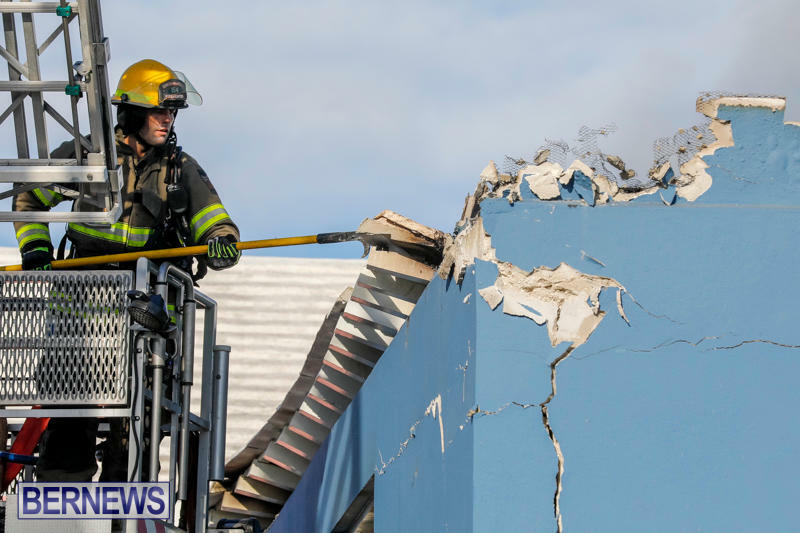 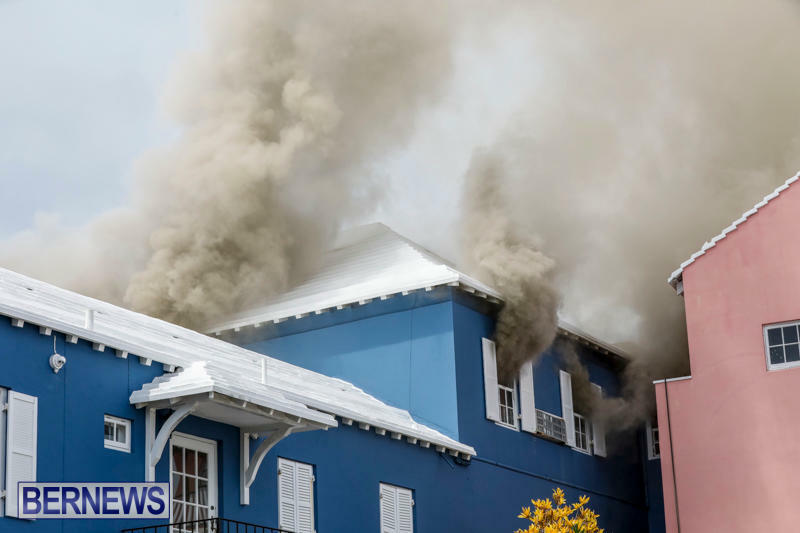 The Bermuda Fire and Rescue Service responded to a fire at the Robertson’s Drug Store building in St. George’s around midday on Saturday [Sept 2] where the fire gutted the top floor resulting in the building’s roof collapsing. 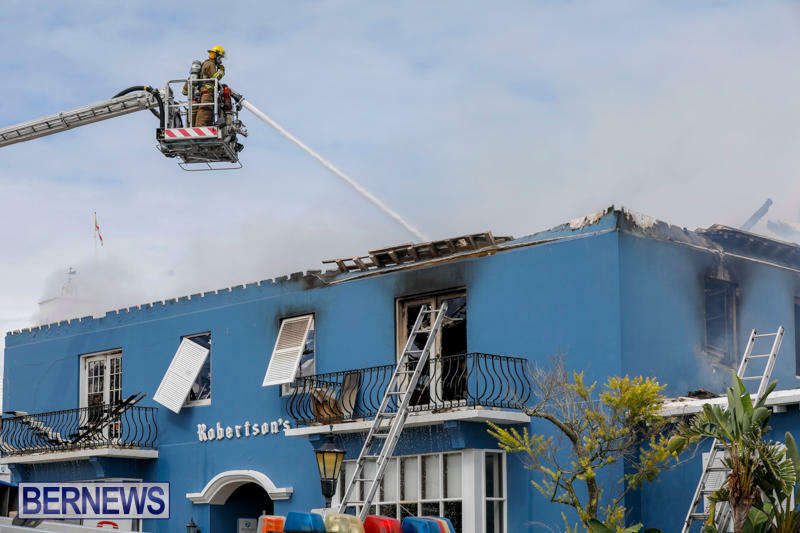 Firefighters battled the blaze all afternoon and continued wetting down hot spots into the night before packing up their equipment and the roads in the area being re-opened to traffic at approximately 9.45pm. 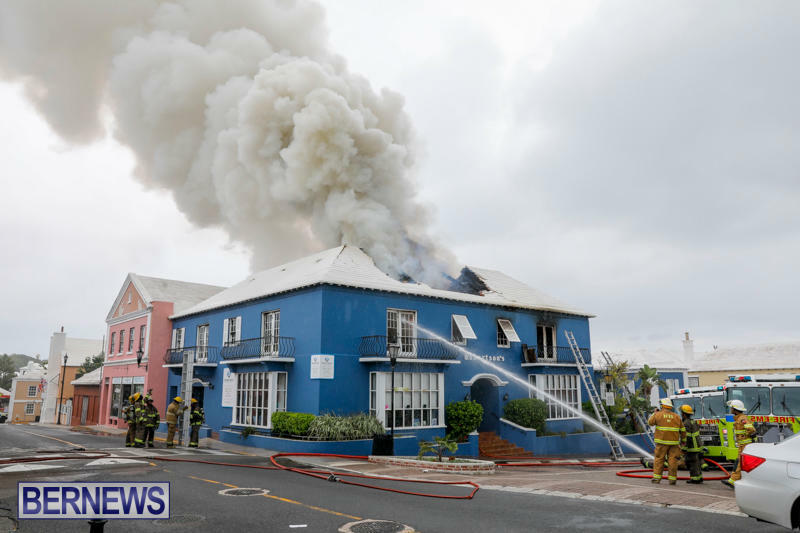 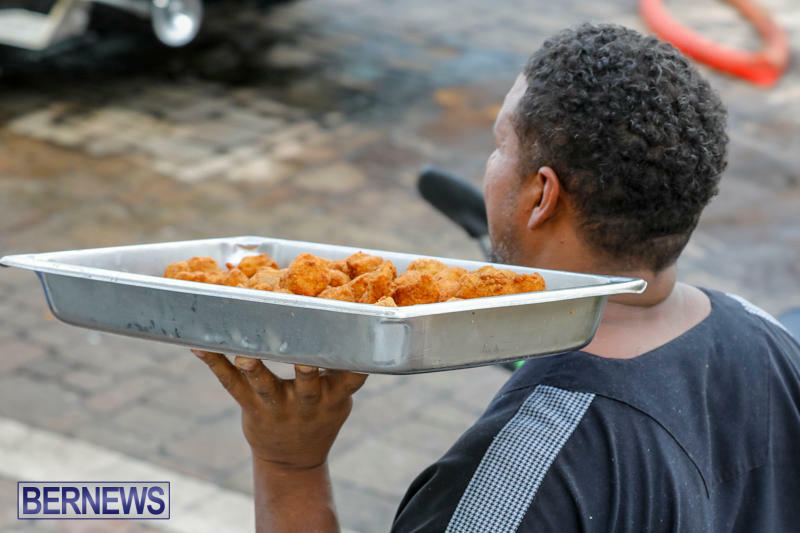 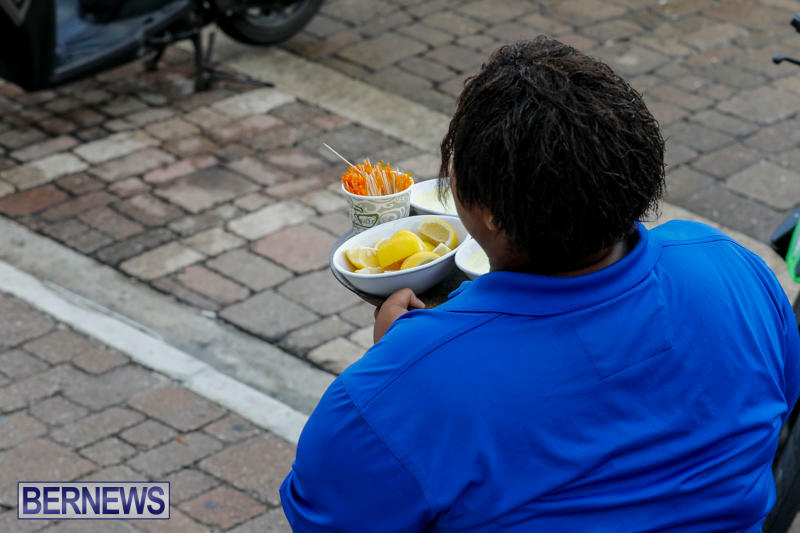 This family owned and operated business is a staple in St. George’s having served the community for many decades. 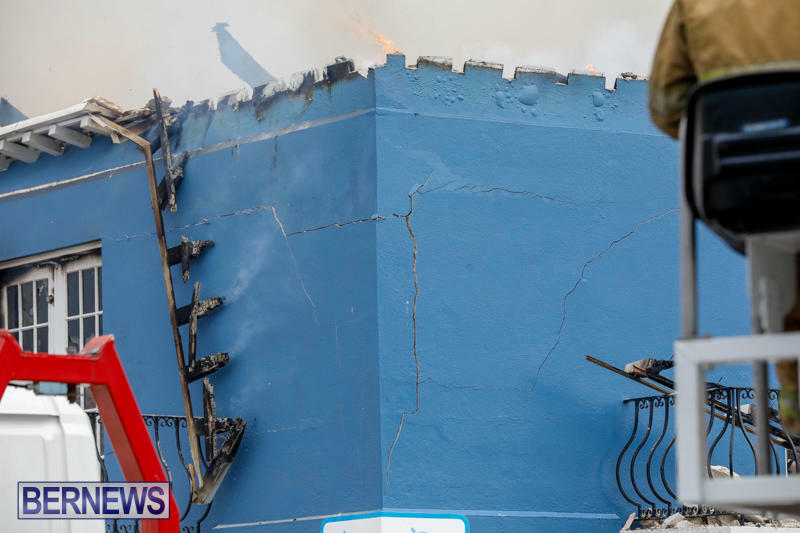 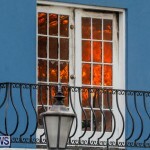 This marks the second time the family have had to endure a destructive fire as the building was destroyed in a blaze forty years ago. 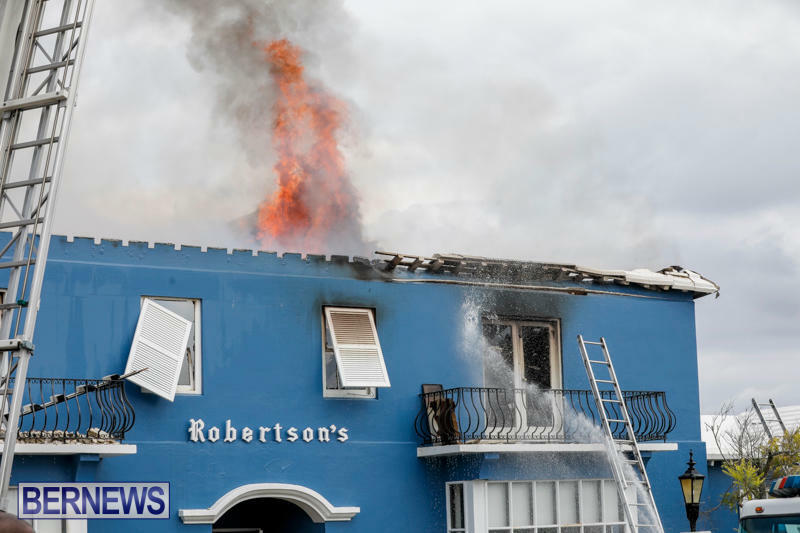 This morning, area MP Renee Ming said, “I am currently off island and am deeply saddened to learn of the fire at the Robertson’s Drugstore. 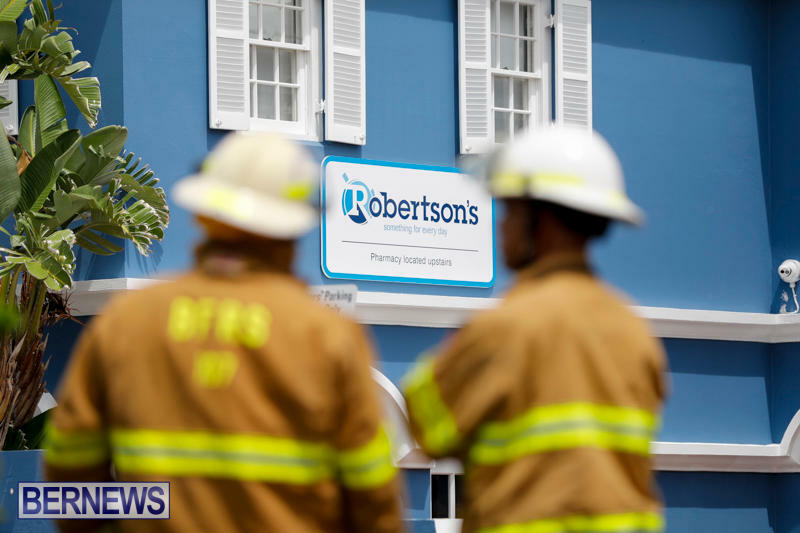 “My colleagues in the Progressive Labour Party join me in expressing these sentiments and offer our greatest sympathies to the Rothwell family, employees of Robertson’s Drugstore and the area residents. 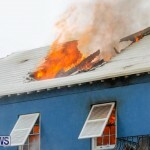 “For us St. Georgians, the drugstore is a staple of the St. George’s community as it is the only drugstore that many St. Georgians have ever utilized. 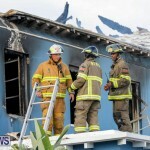 “While the property damage is a tough pill to swallow, I think I speak for all when I say human loss would be more tragic and we can only be grateful that no injuries were sustained. 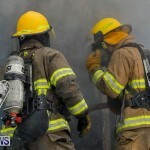 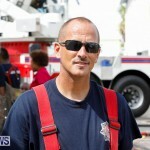 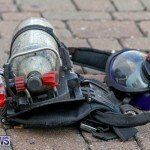 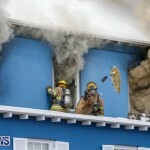 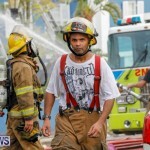 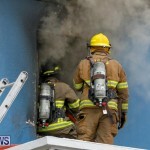 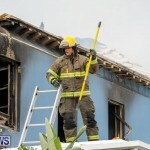 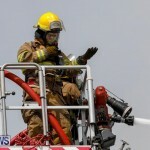 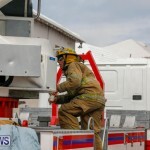 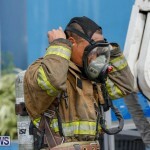 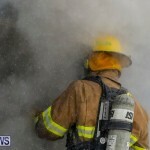 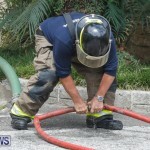 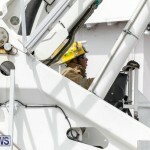 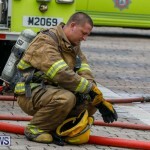 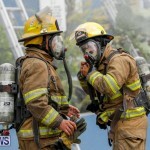 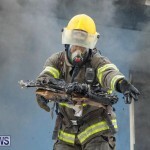 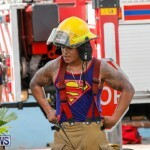 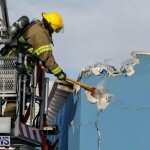 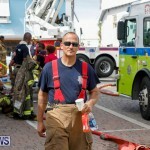 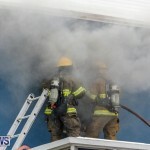 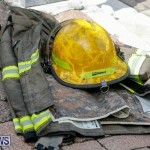 Wow, hats off to the firemen; we thank you for what you do. 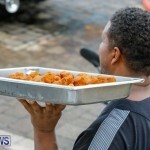 And, thanks too to those that were so kind to offer them a bite to eat. 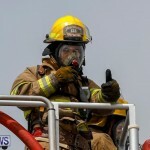 What caring community we are. 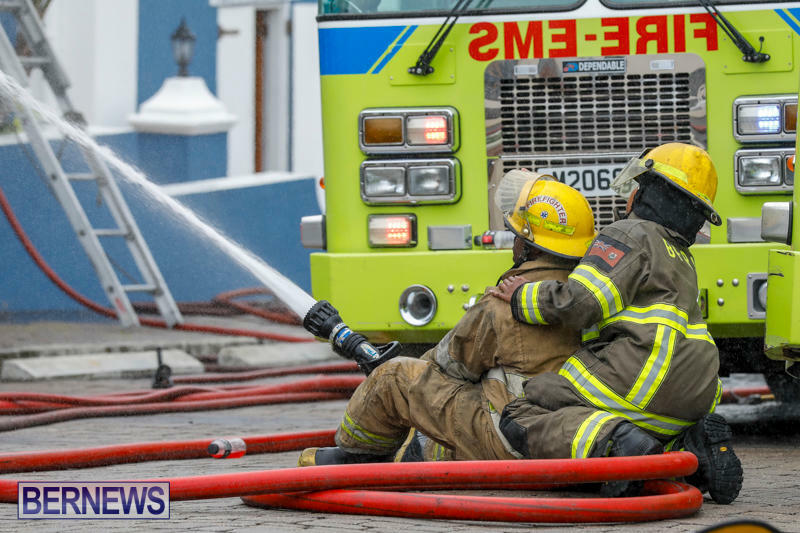 That was very touching. 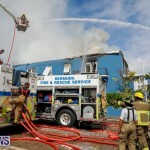 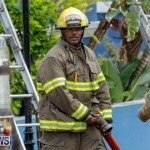 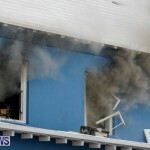 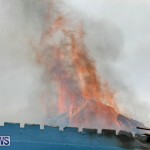 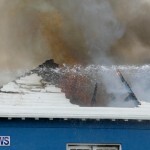 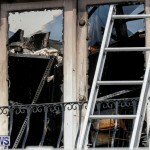 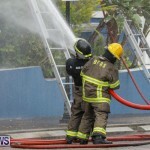 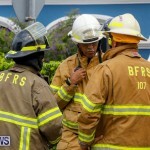 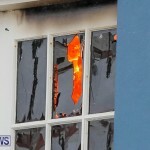 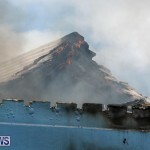 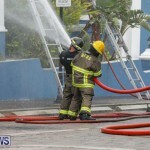 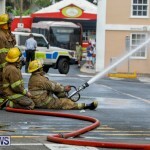 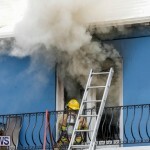 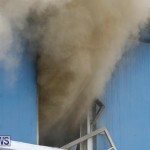 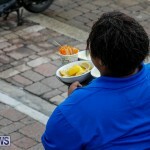 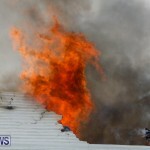 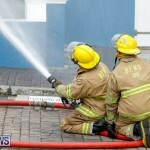 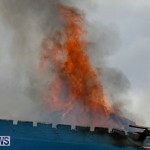 All I can say is “Bda Fire Service is pathetic”. 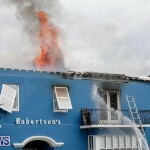 Fire starts at 1pm, large snorkel truck not deployed until 3:15pm. 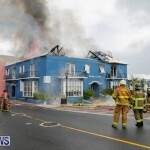 They let this fire get out of control just like the Front St fire. 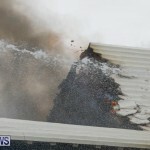 Yeah, they really are pathetic going up on the roof to fight the fire, when at any moment it could have collapsed from under their feet. 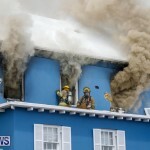 How dare they put their own lives at risk for the sake of others. 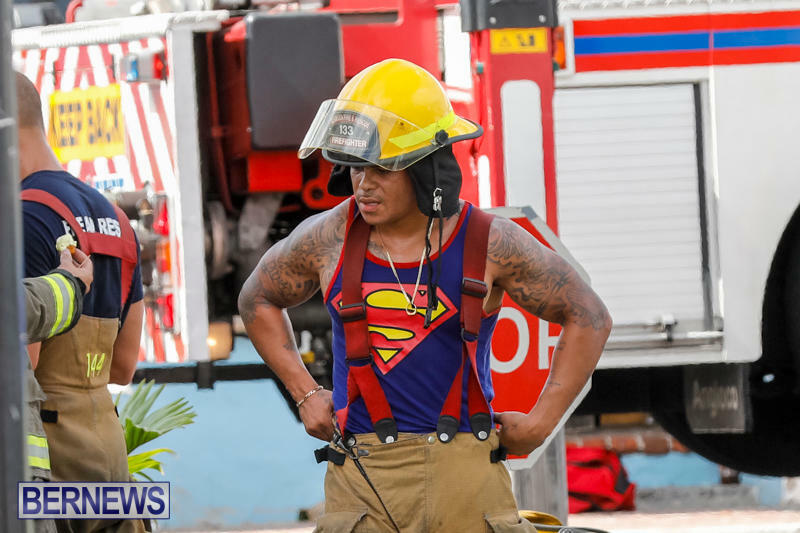 Let’s hope you never have to call upon these heroes yourself!! 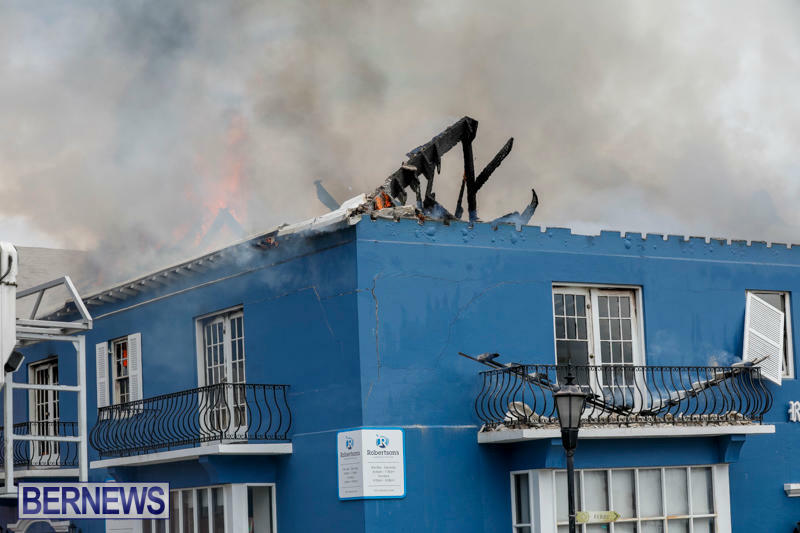 wow – so sad. 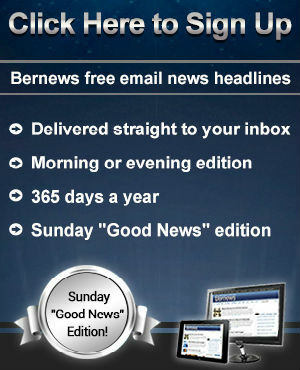 I remember going to St. George’s EVERY Sunday afternoon for a “drive” with my parents and grandparents. 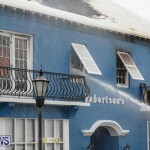 We always stopped at Robertson’s for refreshments!! 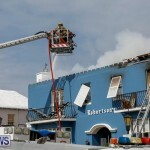 I remember the fire from April 1977 that destroyed the then drug store. 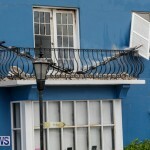 What you see now is the replacement of that. 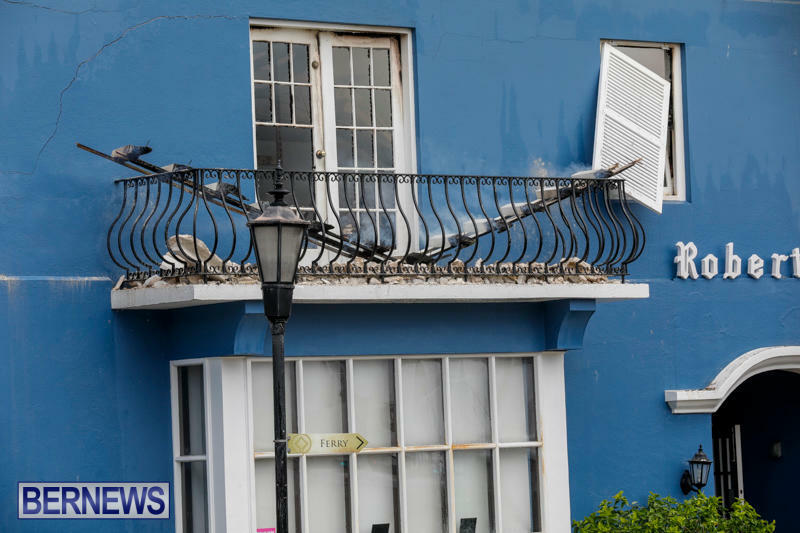 I hope the owners are fully covered for this. 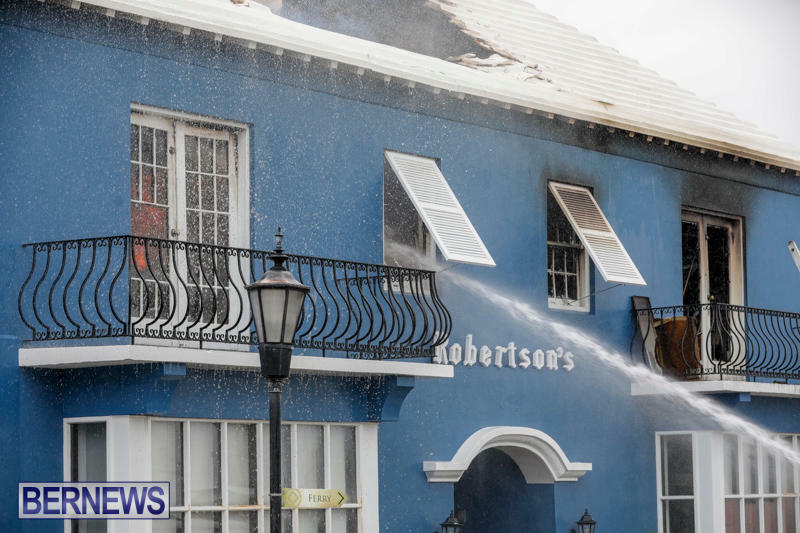 Robertson’s is a Bermudian institution that we shouldn’t lose. 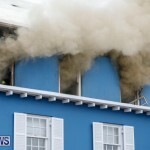 Glad no one was hurt and wish them all the very best.